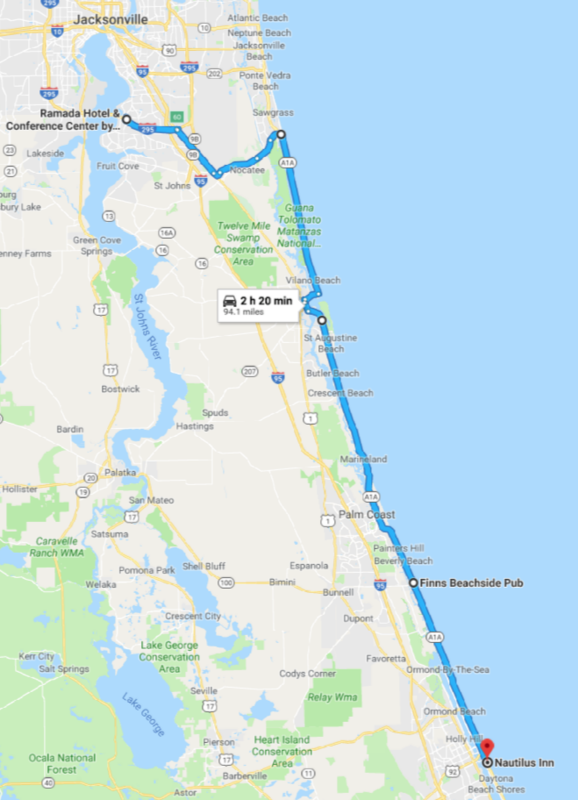 This was supposed to be the trip report from our motorcycle ride to Daytona Beach, Florida for Bike Week 2019. However, due to reasons outlined in this particular journal, we ended up riding 364-miles to Jacksonville, Florida, for dinner on Wednesday and then 80-miles to Flagler Beach for lunch on Thursday, before essentially riding 500-miles back home Thursday night. This year’s ride down would be a repeat of our ride down last fall — the Chuck & Julie Special — where we’d make a 364-mile ride down to the Ramada Inn & Conference Center in Jacksonville, Florida, on Wednesday, spend the night, and then ride that last 90 miles into Daytona on Thursday. Up and until last fall, we’d make the 450 mile ride to Daytona often times solo in just one day, leaving at home around 6:00am and hitting our 1st official Bike Week stop, Finn’s Rooftop in Flagler Beach, around 2:30pm before making our way to our hotel by 5:00pm or so. Needless to say, we’d be a bit tired on Thursday night. But, hey, it worked for us twice a year since 2012. But, the two-day ride down is definitely a bit more relaxing since there’s no real urgency to “get to Daytona” by early afternoon. With that as background, we left the house around 9:40am which gave traffic time to die-down and made our way to the Delta hanger at Hartsfield-Jackson Int’l Airport where we met up with our friends Chuck & Julie. Chuck rode his bike loaded-up for the trip to work at 4:00am to start his normal shift, Julie Uber’d down just a bit ahead of us, and we arrived around 10:15am, 15 minutes ahead of schedule, and immediately pointed the bikes South on I75. The weather was overcast and in the mid-50’s, so not exactly the warm, sunny ride we’d hoped it would be. We stopped for lunch at Chili’s in Macon, Georgia, about an hour later at 11:20am, as that would be one of the last, familiar “bar & grille” restaurants we’d encounter on the Golden Isle Parkway — our preferred back way down — until we reached Waycross, Georgia, around 3:30pm. Again, the nice thing about going down to Jacksonville for the night is it takes the urgency out of making good time so we could arrive in Daytona early enough to enjoy a full afternoon and evening after being on the bike for eight hours. So, lunch at Chili’s was a leisurely, enjoyable time. It was about 12:30pm when we headed back out on the next leg of the ride to Eastman, Georgia, where we’d stop for gas noting Jacksonville is just a two tank ride when you’re getting about 37 mpg on riding two-up on a fully loaded Harley-Davidson touring bike. 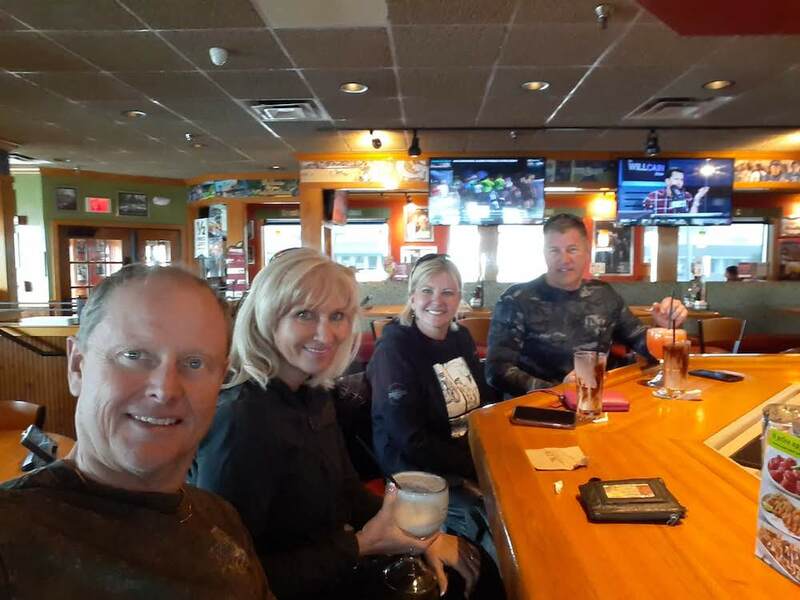 Our next stop was at the Applebee’s in Waycross, Georgia, at 3:30pm, to ‘hydrate’ and hopefully shed a few layers of outer wear now that the temperatures were sneaking into the 70’s, although the sun was playing hide & seek with us. Again, great time just relaxing at the bar before hoping back on the bikes for the final leg down to the Ramada in Jacksonville. Thus far, we’d encountered no real traffic, which I suspected would change as we got on the 295 beltway and I-95 South out of Jacksonville, noting that I oped to stay on US Route 23 all the way into Jacksonville and deal with the local traffic through four or five small towns, instead of jumping over to I-95 at Kingston, Georgia, to by-pass the local traffic. I-295 South did not disappoint, we hit traffic as soon as we jumped on. It finally opened up when it changed to a 3-lane closer to the I-10 interchange, and I-10 East was wide open, as were the first few miles on I-95 South. The last 5 miles to our exit at Baymount were another story, but for Florida at rush hour it still wasn’t awful. We reached the gas station at our hotel right around 6:00pm, topped off the tanks, and checked-in. Much to our surprise, and despite being told by the reservations agent that the hotel’s restaurant and bar remodel had been completed and they were once again open for business, such was not the case: the place was unchanged from our trip down last fall and the same as Chuck & Julie recalled from a year ago. Chuck & I both specifically asked about the restaurant and bar. Very disappointing. Anyway, we checked got settled in our tired-looking rooms and headed out to grab some dinner about 30 minutes later at 6:45pm. As we did last year, we headed down to Gator’s Dockside Grille, a sports bar just a mile or two from the hotel. We had a nice meal and a great time, but we always have a great time when we’re with Chuck & Julie. After that, we headed back to the hotel and spent a good hour or so socializing in the lobby before turning in for the night. The plan for the ride down to Flagler Beach was to leave around 10:30am and make our way to A1A at Mickler’s Landing and take it all the way down into Flagler, arriving around 12:30pm for lunch. Between the time zone change, etc., I found myself up around 4:30am and did my best to rest until Debbie woke up on her own. Normally, I’d just get out of bed, move to the arm-chair or sofa in the corner of the room and hop on my laptop. Unfortunately, the chair or sofa weren’t where they were supposed to be, it was just a large unoccupied space with a lamp and nothing under it. I think it was around 8:15am when we finally got up and headed to breakfast before they shut it down at 9:00am. We had ourselves squared away and out to the bikes around 10:00am where I found Chuck & Julie already getting themselves packed up and ready to roll. I had a brief chat with a couple of guests who were headed to some golf tournament about the Harley and never gave that a second thought, as I assumed they meant down towards Daytona… where we were headed as that was the context of the discussion at that moment. We rolled-out right around 10:25am and made our way onto I-95S to the Old St. Augustine Road Exit — a slightly different route from last fall that kept us off Old St. Augustine Road with all of its intersections a bit longer — and then made our way onto the Nocatee Parkway. It was when we got to the parkway I quickly realized the golf tournament the guests from the parking lot were attending was at Palm Valley Golf Club in Nocatee which put us into some unexpected traffic. Thankfully, that and a small detour / back-up in St. Augustine were about our only disruptors on the ride down to Flagler beach, setting aside your average Floridian’s seeming lack of motoring skills or attention to the world around them: I’m not sure which it is, but drivers across Florida require my full attention as you never know what they’re going to do. But, all that said, it was a lovely 74-mile, hour and 50 minute ride. When we arrived at Finn’s in Flagler right around 12:30pm per plan, I was surprised to see so many darn cars, far more than the number of motorcycles that were on hand. In fact, I can usually find a place to park the bike with the trailer right near the restaurant, not so today. I had to circle the block twice before I finally found a space long enough two blocks up A1A. Sadly, this put me in a foul mood, as we seemed to be facing yet another “Bike Week” overlapped with “Spring Break” where the number of cars vastly outnumbered motorcycles, making for a lot more traffic since cars consume the space of four motorcycles. As Debbie noted, Spring Break’s overlap with Bike Week certainly explains why the number of kids and extra cars in Daytona seems to grow year-over-year as the number of “Bikers” continues to decline. When we reached the rooftop bar it looked to be a mixed crowd, about 60% bikers and 40% non-bikers, some of whom were locals just out for lunch. Again, my impatience started to get the better of me… not a good omen for the weekend since I’d have to be dealing with traffic, crowds, etc. for the next two and a half days. 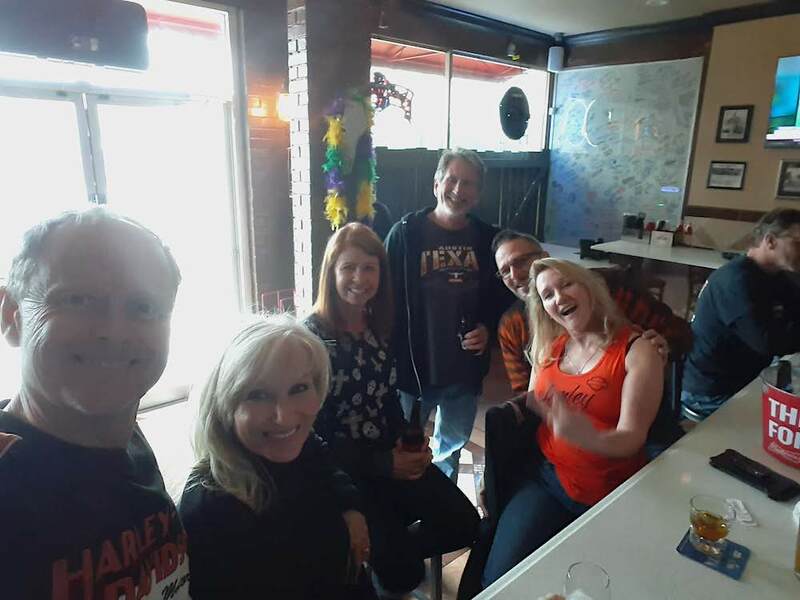 However, we did find some standing room at the bar and, a short time later, Debbie secured a corner table out in the sun so we made our way there to have lunch and socialize. The fish taco’s were delicious and as we were eating and enjoying the warm sun our friends Mike M. and Jeff L. from Atlanta with their respective friends showed up and joined us, finding some seats at the nearby bar. We had a good time chatting with them, some of the locals at the table next to us, etc. It was probably around 3:00pm when we left Finn’s to head to our respective hotels for the 4:00pm check-in. Chuck & Julie were staying a hotel in Ormond Beach, about 5 miles from were we had our reservations back at the Nautilus Inn in Daytona Shores. All told, it was almost an hour-long ride to the Nautilus given all of the traffic along A1A / Atlantic Avenue due to traffic control at Main Street. By the time we reached the hotel I was extremely annoyed and frustrated by all of the car traffic and just not in a good mood. 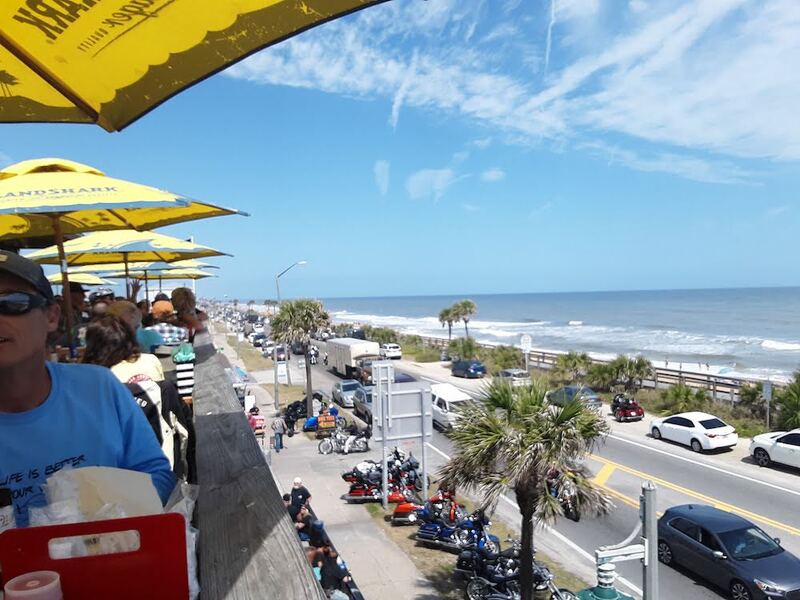 We have been coming to Daytona for spring and fall Bike Week since the fall of 2012 and have stayed at various hotels along Atlantic Avenue, having discovered the Nautilus Inn and stayed there for the 1st time in October 2017, then again in March of 2018. They were both exceptional experiences. Sadly, year-over-year Bike Week has been changing as has the world around Bike Week, including the overlap with Spring Break that causes the hotels, restaurants, streets and even the Bike Week venues to be filled with a mixed crowd of motorcycling enthusiasts and children of high school and college age, some with adult supervision and some without. But, it is the traffic that has become a nightmare. As long-time readers may recall, in October 2015, Debbie and I were struck by a elderly motorist with minimal insurance who was cited for an illegal left turn from the right lane across two lanes of one-way traffic that put Debbie in the emergency room and our motorcycle on a flatbed. Since that time it has been a love-hate relationship for me at Bike Week, as the experience has changed from one of escaping to enjoy the warmth & hospitality of Daytona for a few days each March with fellow motorcycle enthusiasts to being overwhelmed by motorists in cars everywhere we turn — some with questionable driving skills and little or no insurance — and venues filled with curiosity seekers from Spring Break activities. To that end, I have said over and over again there are some people who should not be “here” at Bike Week, with reference to the inter-mixed Spring Breakers, under or un-insured drivers with poor motoring skills, and the Bike Week crowds. So, it was with all of this pent-up frustration that we entered into the hotel lobby and it just went south. I’ll skip the details but if suffices to say, after waiting impatiently I finally got to the counter to check-in and ended up getting in a bit of an altercation with the check-in agent on an unwarranted $25 trailer parking fee. Things escalated a bit and we ended up leaving instead of checking-in. As we were leaving the parking lot of the Nautilus Inn I realized I was the person who didn’t need to be at Bike Week in Daytona. Bike Week and I are no longer a good fit and it is unfortunate I had to “discover” this while checking into the Nautilus Inn. While I could have certainly found another room in Daytona, the things that cause my love-hate relationship would still be there… I just needed to remove myself from the situation. It was not an easy decision since we’d come down with friends who we’d planned on spending our time with, as that would leave them on their own… and that wasn’t fair. And, it wasn’t an easy decision because I knew Debbie was really looking forward to getting away from the dreary cold weather we were having at home for a few days of walks on the beach and fun in the sun in Daytona. I sent off a note to Chuck and we talked briefly on the phone, so he understood but was clearly disappointed. 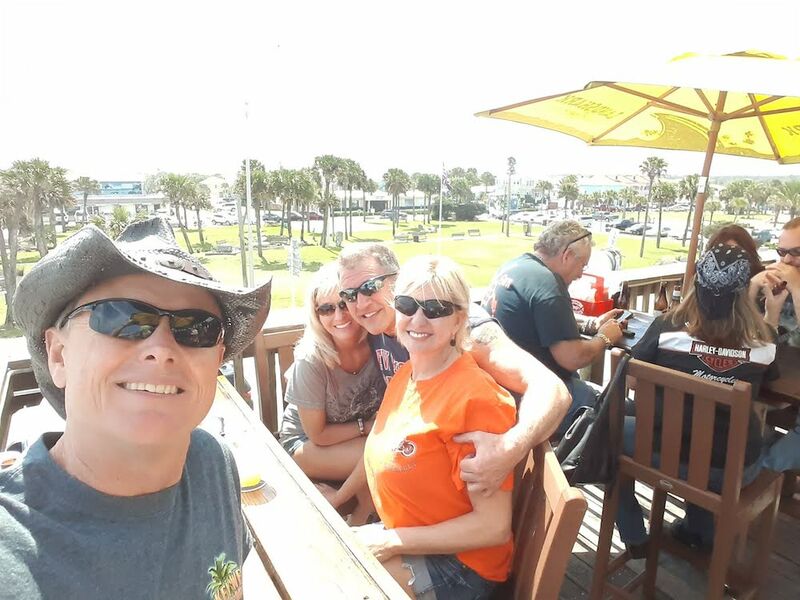 Again, we had other mutual friends in Daytona for Bike Week so, in the back of my mind, I figured they’d still have friends to spend their time with. It was around 4:30 when we headed-out of town the long-way around so as to avoid the bike week traffic. My plan was to ride home, all 471-miles worth, arriving sometime around midnight if we didn’t encounter any traffic, made a couple of gas stops and had dinner somewhere along the way. The biggest challenge was getting in to Atlanta ahead of the strong storms that were expected to pass through shortly after mid-night. Yes, we could always stop and spend the night at a Hampton Inn or Holiday Inn Express along the way, but the weather for Friday morning wasn’t all that much better so best to push through, get home and settled back in. It was relatively smooth sailing after encountering a bit of traffic 90 miles and an hour and 40-minutes into our ride in downtown Jacksonville on I-95 just ahead of the I-10 West interchange. After fueling up in Jacksonville we didn’t stop again until we reached Valdosta, Georgia, about 118-miles and a little before 8:00pm later for dinner at Cheddar’s, same place we stopped for lunch with Chuck & Julie back in the fall. This was not quite 1/2 way home for us, as we still had 256-miles and 4-hours of riding ahead of us when we left around 8:30pm. We were running on fumes when we pulled in for gas in Arabi, Georgia, about an hour and 77 miles later; this would give me enough gas for the final 180-mile leg through Atlanta at our 82mph cruising speed. I found it odd that when we pulled into the gas station our ETA at home was around 12:24am, but after rolling out it jumped to 12:41am. Well, after getting around Macon on I-75 and heading due North towards Atlanta, about 85-miles from home we ran into a bridge construction project where they had two of the three lanes of I-75 shut down, noting that this is prime time for truckers who have to go around Atlanta to get from Point A to Point B making a mess of the situation. We were at a dead stop or crawling speed for a good 20 minutes and my left hand was cramping from having the clutch pulled-in for so darn long. I’m now thankful we had the clutch valve replaced before this trip, as I’m sure the hydraulic fluid in the clutch, transmission and engine oil temperatures were soaring. After getting past this little delay it was smooth sailing through Atlanta and into the house with only a brief rain shower as we rode through Atlanta. I should note, I was looking at the weather radar about every 30 minutes since we’d transitioned onto I-75 North from I-10 West, trying to figure out if and when we’d encounter any rain. I knew we’d get a little wet going through Atlanta, but it looked like we’d just sneak into Cobb County during a break between passing storms so I opted to just press through the light rain with the 1/2 helmets and full leathers vs. stopping to put on rain gear and full face helmets, as that would have merely delayed us and put us a higher risk of needing that gear in Cobb County. We rolled into the garage right at 12:30am and the rain started right around 1:15am. Looking back at the weather radar, what we road through in Atlanta simply got heavier as soon as we’d passed, so thank you Lord for answering my prayer for Debbie’s safe and dry arrival back at the house. Me, I deserved to be hit with your worst after bailing on our friends and stealing Debbie’s vacation from her. Sometimes I forget that it’s just not about me. I unpacked the trailer and put our suitcases and Debbie’s overnight upstairs while Debbie finished her chicken fingers from Cheddars. A short time later she headed to bed while I spend a couple of hours decompressing from the long ride and continued to wrestle with my decision to abandon Bike Week. Again, I was not in a good place when we arrived in Daytona and the likely outcome from that — dealing with the Spring Break traffic and crowds mixed with the Bike Week traffic and crowds — was also not good and I probably knew this before we left which is why I could never get excited about making the trip. Friday was all about being honest with myself about my lack of patience and self-control, choosing vacation destinations wisely, mending fences and figuring out the plan forward. I know Debbie was truly crushed by the loss of her vacation, even though she’s quick to rationalize it was probably for the best. 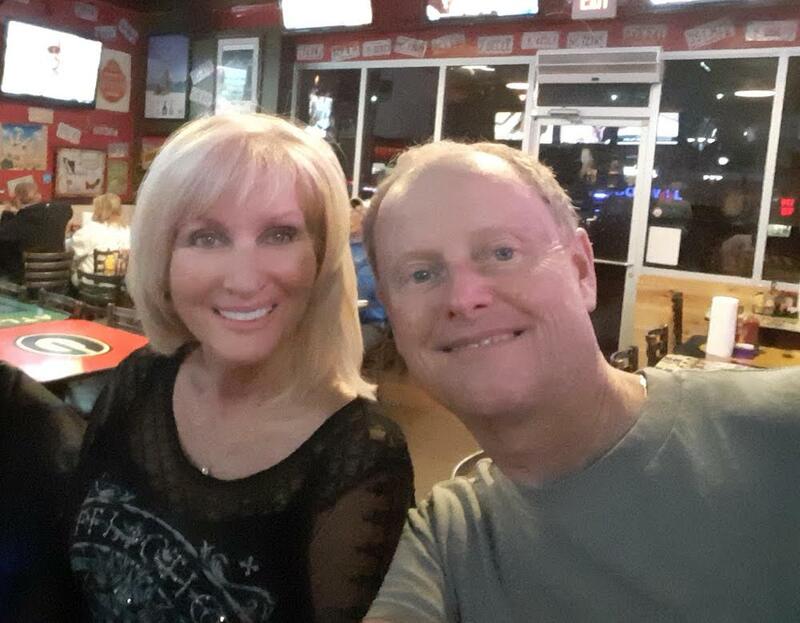 Our friends Chuck & Julie are true friends, so there’s no loss of love there, just disappointment that we weren’t with them as planned for Bike Week. Looking forward, as I said, we won’t be going to Daytona for fall or spring motorcycle rallies for at least the next year or two, if at all. Do I really want to be doing THIS when I’m in my 70’s? Motorcycling is a pastime and hobby, not a lifestyle for us. We’re not “bikers” by any stretch, just motorcycling enthusiasts. So, perhaps motorcycle rallies are not the place for us, or at least Daytona’s Bike Week. Smaller motorcycle rallies in Panama City Beach that don’t overlap other events like Spring Break are still a maybe, or maybe not. Our annual 4th of July trip to Key West, that’s still happening. In fact, motorcycle road trips that have nothing to do with major events will likely be more frequent and take the place of Bike Week / Rallies in the future. Debbie’s kept herself distracted with laundry, cleaning, etc., because the weather is truly depressing and seeing her this way is perhaps the biggest, crushing blow to me at this point as this really is all on me. She did enjoy the riding down and back, so the passion for riding motorcycles is still there, as is the enjoyment we have of spending time with our friends. The Bike Week vibe is a toss-up. Me, I need to get out and clean the Harley as it’s now covered by just under 1,000 miles of road grime after our ride down to Finn’s Rooftop in Flagler Beach for lunch. Yup, that’s the bottom line: We just rode 1,000 miles to have lunch with friends who live 15 miles away. As mentioned in an update last week, I ordered a set of Unique Style Racing’s (USR’s) Revi Motorsports-made, Switchback mirror lights late last week and they arrived today. The fit and finish is very good. Installation is straightforward, although I did need to pop the lower housing loose to install the light as the foam gasket material around the edge of the light is quite a bit thicker than the OEM material; not a big deal but something to take note of if you’ve removed and reinstalled your OEM swtichbacks where their gaskets have been compressed, as I have. I’ve linked a 3 minute video that shows the installation process for those who’ve never seen how it’s done. 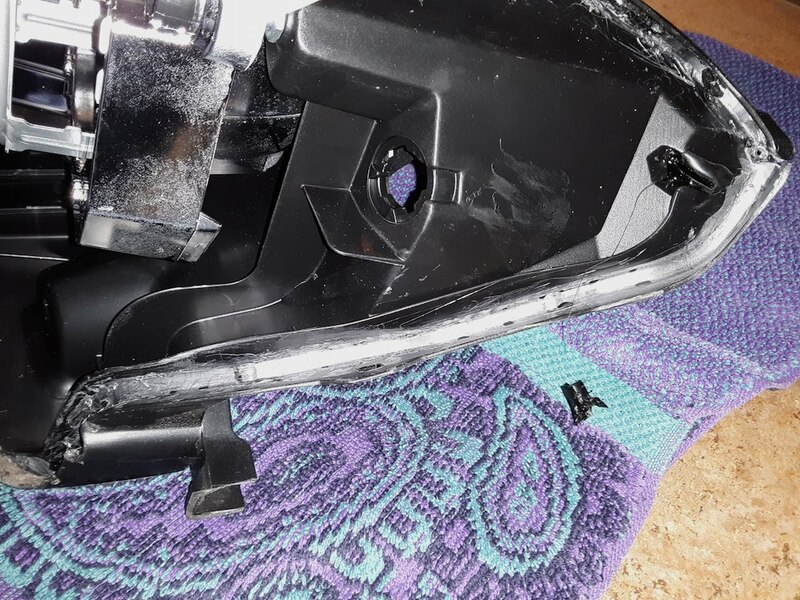 Most of the plastics in the mirror are fairly stout; however, be careful with the glossy plastic part that the switchback mounts to; those small tabs are brittle. Also, make sure press-to-fit parts are aligned before snapping them back together. Note that I was not interested in the DRL feature; I just wanted to eliminate the chrome from the mirror housings with an smoked lens / OE-quality replacement and this looked like a good option, pending mesojdm’s next release and not knowing how deep in the waiting list I was; I’m still waiting to hear back about the ECT TRD Pro shifter knob as well. So, being anxious to get all of the mods done on this truck, when the USR / Revi switchback popped-up on my radar for what seemed like fair money, I decided to give them a try as I was pleased with USR’s comms and support when I bought a set of the DEPO TRD Pro headlights a few weeks back. Anyway, while I’m not in the aftermarket parts business, I’ve been wrenching on cars and motorcycles and worked in aircraft manufacturing long enough to have a pretty good sense of what’s good and what’s not-so-good. The DEPO headlights, as others have noted, are excellent OE quality parts, if not on par with Toyota’s OEM lights. However, I also had a set of the DEPO TRD Pro taillights (not from USR, but another reseller) pass through my garage and they were not-so-good; strange that they were so far inferior to the headlight materials and fabrication quality. Based on the foregoing, I would assess the Revi Motorworks Switchback material and fabrication quality to be very close to the DEPO headlights. As for the internals and some of the other design features, time will tell if the reliability is there but for my needs they’re a good fit: again, very good fit and finish, the smoked lens gives me the look I wanted and is a vast improvement over my cheap-screw de-chrome efforts using black-out trim tape as an interim fix. The smoked lens could have stood to be a bit darker if only to off-set the milky light color of the non-tapered defuser which is very different looking from the OEM’s and — based on the photos I’ve seen — MESO Customs swtichbacks with their more detailed, molded and tapered acrylic defusers. However, what the internal defusers may lack in an OE/OEM look from an aesthetic standpoint is purely subjective, along the lines of some aftermarket head and taillight offerings (e.g., Spyder’s stuff comes to mind), but they are plug & play albeit with a pigtail instead of a molded-in male plug in the housing, have a clean, dark look and they are indeed bright, as advertised. 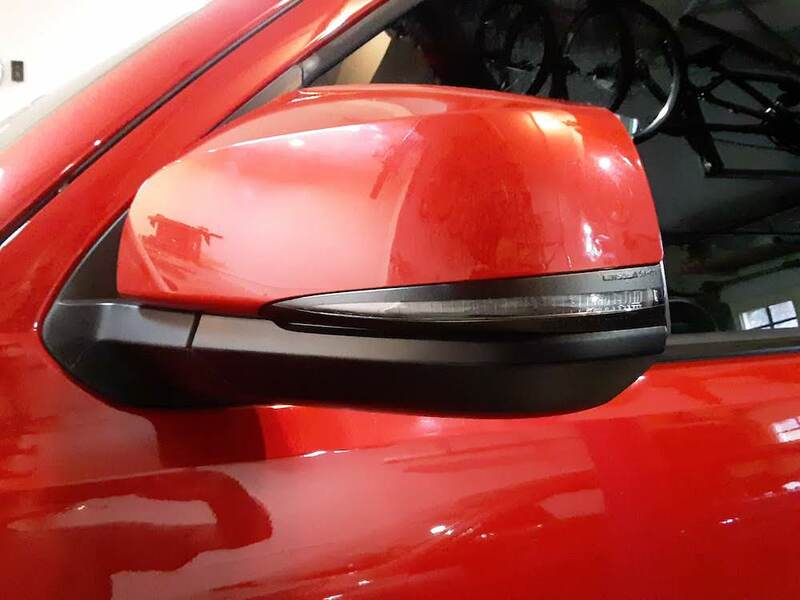 Bottom Line: I feel like they were a good value and gave me what I was looking for, i.e., a blacked-out aftermarket-quality replacement for the chrome switchback signal in my mirror to complete my de-chrome of our TRD Sport. So, this has been my evolution: Stock with chrome, then Black-Out Trim tape applied over the lens to hide the chrome pending availability of blacked-out switchbacks, and now the USR Revi’s. Here’s how the USR/Revi’s came… nicely boxed with OE look. And, the Revi side by side with the OEM switchbacks. See linked video for installation; about 3 minutes per side. Again, these aren’t quite OE and use pigtail connectors for plug & play installation. Also note that I did not run the wire for the DRLs as I don’t have an interest in that feature; however, I elected not to cut it away since there was plenty of room inside the mirror housing for the pigtail and bundled wire. And the installed views: without the cover both off and on, and then with the cover-on for the final look. The defuser definitely is a bit obvious in bright light so time will tell if I warm up to it or not. Someone on a discussion forum described it as a white blob, which is fair but an off-white, gummy worm would probably be a bit more accurate. 3/12/19 Update: The defuser is providing to be less eye-catching that I originally thought. In the grand scheme of things, unless you’ve gone to the trouble of eliminating your DOT-required reflectors in the front (orange) & rear (red) corners of your truck, having the ghostly-white defuser in the turn signals — which is really only visible in direct sunlight — is a non-issue. I say this because I know it’s there and am looking for it. I’d venture to guess the average civilian who doesn’t even know there are crazies out there who actually spend money “fixing up” new cars and trucks would never notice. Our winter doldrums continue, but getting the motorcycle ready for our ride down to Daytona this coming week on Wednesday and making reservations for our July visit to Key West have kept our spirits up. Actually, our spirits are always up… Life is good. As for our week, it was dotted with all kinds of routine activities and perhaps the highlight of the week, a 20-year reunion of the folks who worked together back in the late 1990’s on the C-130J development and certification program. There was, as always, some tweaking on the Tacoma, mostly chasing a water leak at the rear door, and the usual Friday and Saturday nights out: Friday was something of a bust but Saturday turned out to be a really great night. Anyway, far too much detail follows. As always, we start with the weather. What started out as a cold and dreary morning turned into a sunny and even colder afternoon. Try as it might, the sun could not make the thermometer get out of the low-40’s. But, at least it’s not raining! It was a typical morning, with the typical blogging, etc. Well, that’s not entirely true. I was up at 2:00am and spent the wee hours of the morning downstairs reading and whatnot hoping I might get sleepy enough to catch a few more Z’s but no such luck. It was a good day to get caught up on banking and sift through all of the correspondence from Morgan Stanley as our financial guys essentially do a fruit basket turnover of our portfolio’s to purportedly insulate us from what most believe will be a turbulent market in the coming weeks and months. 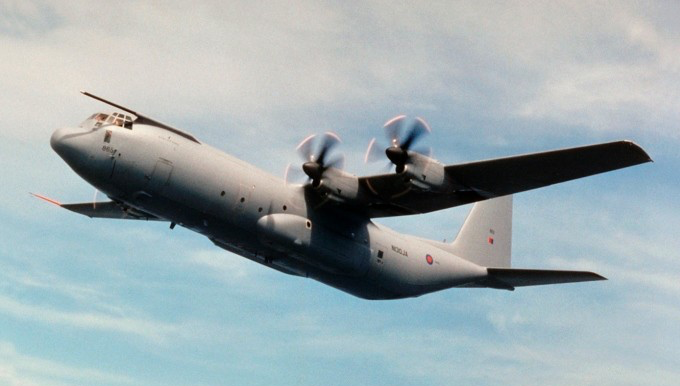 In fact, later on in the day one of our advisors called to make sure it would be OK to sell-off some of my Lockheed stock, noting I’ve beaten them up pretty good because they didn’t sell it when I suggested it was time about this time last year. I think it was at $340/share and is just now making its way back up past $300 after being way down. Debbie did, in fact, get out of the house to do some grocery shopping but didn’t dilly-dally. I think it was one of her shorter shopping trips. Again, it just feels really cold, with a steady wind giving us a ‘feels like’ 35°F during the warmest part of the day. Yes, I know these are a lot warmer temps than what family and friends who live ‘up north’ are experiencing but, well, our skin gets thin down south, don’t you know! I’ve still not booked our lodging for our nearly annual July 4th week motorcycle trip to Key West, but did check to make sure there was still availability; there was. I guess I really need to do that this week, lest I lose our rooms. Still not sure why I’m dragging my heels on this, but I am. However, I am definitely beginning to get ourselves ready for the trip to Daytona next week. I programmed my phone to sync up with the motorcycle’s Bluetooth system so it will alert me when calls, etc. come in on my phone. I don’t plan on taking calls or reading messages, but at least I’ll know I’ve got them which is a good thing. To actually interact I’d have to get a Bluetooth headset and I’m not sure I’m ready to do that just yet. I’ll probably pull the trailer out of the shed late tomorrow or on Wednesday during our “dry days” so it will be in the garage. As it is right now, the backyard is so saturated I really don’t want to pull the 120 lb trailer across the lawn which would leave two deep tracks. As much as I keep trying to not fiddle with the Tacoma, I keep finding things that need to be fiddled with. After yesterday’s hour plus drive in the rain I noticed the outer edge of the tires had an odd, whitish discoloration. I’m guessing it was probably the very old tire dressing I used, which was a heavy, greasy formulation. It took me a good hour to get most of it off but they still looked more grey than black. Having bought some new tire dressing — something from Turtle Wax similar to Armor All — I decided to treat the tires with that. Of course, like Armor All, the over-spray from stuff will stain concrete, cement, asphalt, etc., so I fabricated a ground shield from some left-over exercise room flooring material that slips around the tires when I apply the material. It seemed to do a good job of keeping the over-spray off the garage floor and the tire dressing has at least made the tires black and shiny again. I also had to spend a little time investigating the source of some water collected in the right rear corner of the truck bed during yesterday’s rain, either from when the truck was parked out in the deluge or when driving to/from Randy & Liz’s Roadhouse Bar & Grille. Thankfully, tightening up the inner frame on the right-hand A.R.E. shell kept that window watertight as the carpeted shelf under the window was bone dry. However, I’ve noted there are still two big gaps on either end of the tailgate where it meets the bottom edge of the shell door. So, I’ve got to figure out what I can do to block those as they’re clearly an easy way for water to flow in to the cargo box. More to follow on this. While I was messing around in the garage I spied my Yakima roof rack still waiting for what will hopefully be the right size mounting clip to arrive hanging from its storage hooks. I’d been wrestling with whether or not to “sticker it up” or leave it plain and decided now was a good as time as any to sticker it up and see how that looked. I can always remove them. So, after doing a scavenger hunt to find as many of the right types of decals — ones related to cycling products, as that’s what you typically put on these things if you’re a cyclist — it got the treatment. It needs a few more just to fill in the gaps, but it was a good start! On the “clear out the stuff I don’t need front” I had two buyers appear yesterday for some of the take-off parts from the Tacoma. One gentleman in the local area expressed interest in the Tacoma’s stock grille and will be coming by tomorrow at 3:00pm to look at / buy it. It’s a great deal at a fraction of the cost of a new one and will off-set more than half the cost of the aftermarket grille I bought to replace it, so that’s goodness. 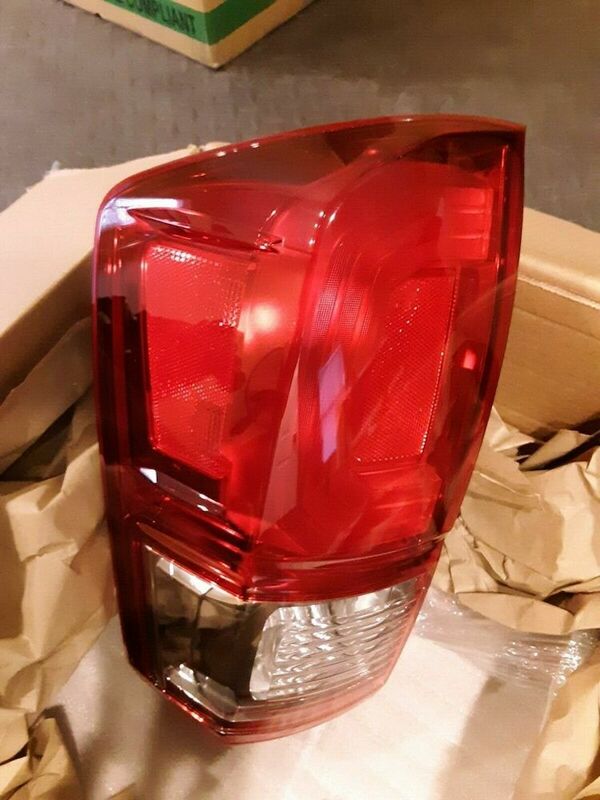 One of the two taillights I put out on ebay also sold last night to a buyer in Florida. 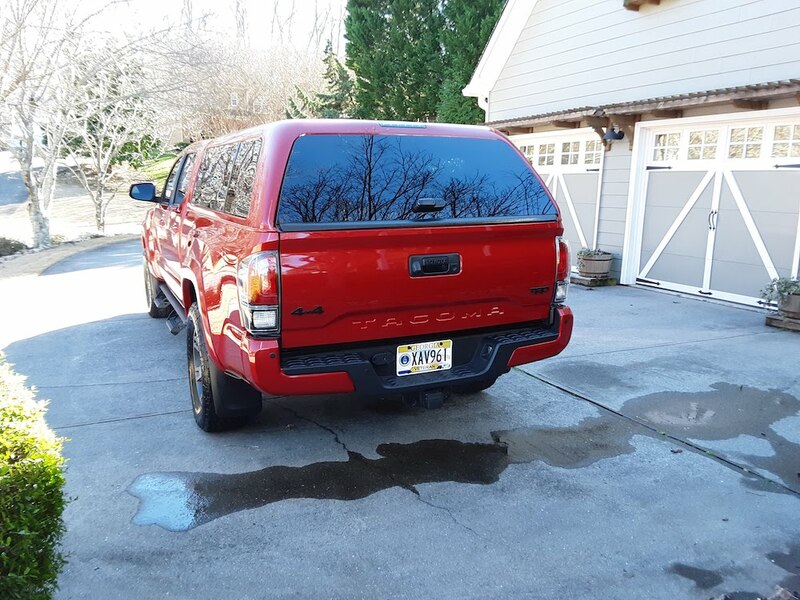 So, I’ll get the box ready to go 1st thing tomorrow again, a great deal for someone and it off-sets the cost of the TRD Pro taillights now on the truck. If I can sell its mate, then once again… I’ll have covered more than 1/2 of the cost of the new nights. Fingers crossed all of these take-off lights sell over the next few weeks. As for our evening, we’re both back into our eating plans again. Me, I had my usual for Monday: blackened tilapia burrito. Debbie, she’s been on something of a fitness mission with her daily exercise and a nearly vegan diet during the week: pretty much yogurt for breakfast and veggie’s for lunch and dinner. She’s amazing; I just can’t give up my fish, chicken, ham and steak usually served on some type of flour-based bread, muffin or tortilla with my greens added to the mix. I was reminded our smart phones don’t really have the best quality camera technology when Debbie came back from Caroline’s swim meet with less than useable photos. Knowing this, and not wanting to spend stupid money on expensive smart phones, I’ve always had a small digital camera around here somewhere does take great photos. And, it was working just fine up and until I switched out phones for a newer model last fall. So, last night I finally got around to getting in sync’d with the camera and we’re now back in business. Not that we’ll actually remember to take the camera with us. That’s the problem and the reason folks tend to buy the more expensive smart phones with good cameras: you’ve always got your phone so it’s very convenient. That was about it for our Monday. Except, well… we watched the mercury slip past 30°F on it’s way down to the low 20’s over night as we snuggled in under the covers; brrrr. I’m not sure if it’s the return of the cold weather or something else, but I really got a good solid 7 hours of sleep last night; pretty unusual for me. After my usual morning routine, and after Debbie was up and around, I finished packing up the taillight off the Tacoma I’d sold on ebay so it could be shipped off to the buyer in Florida and then took it over and dropped it off at the post office, something that’s become a bit of a routine for me of late. But, it feels great to be shedding these take-off parts instead of warehousing them. The attic is looking a lot less cluttered and that’s a good thing. However, the buyer for the Tacoma’s grille had to push-off his drop-by due to a work conflict, so hopefully we’ll see him tomorrow afternoon and have yet another large box off the reservation. And, I noticed someone has placed bids on both of the headlights that came off the Tacoma; woo, hoo! Those will sell and be out of here as well. 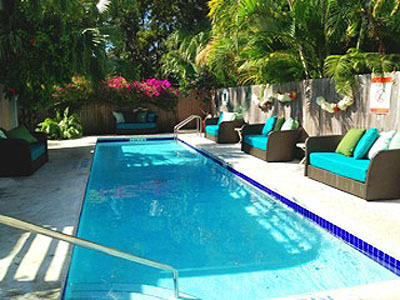 I finally got around to making reservations at the Cypress House in Key West for what has become our annual visit over the 4th of July holiday. They now use a central reservation service for all of the “Historic Inn” properties which is a mixed blessing. I liked speaking with the front desk folks at the Cypress House since they seemed to be very accommodating of our requests; however, the gal I spoke with — Tippy — was also great. We secured a little discount with our AARP membership, put in a request for Room 9, which is located right next to the pool on ground level, and also put in a request for a parking space. Sadly, parking in Key West gets more sparse and expensive every year so the once no-charge parking in the Golf Cart parking space is now $25/day… first come / first serve. Oh well. But, at least we have a room on 3 – 6 July back at our preferred lodging location. Now I just need to make our reservation at the Hilton Grand Vacations – Tuscany Resort in Orlando for the trip down on 2 July and figure out what we’re doing on the return trip. If our friends, Chuck & Julie, join us we’ll just need to find a place back in Orlando… probably Tuscany or a Hampton Inn. 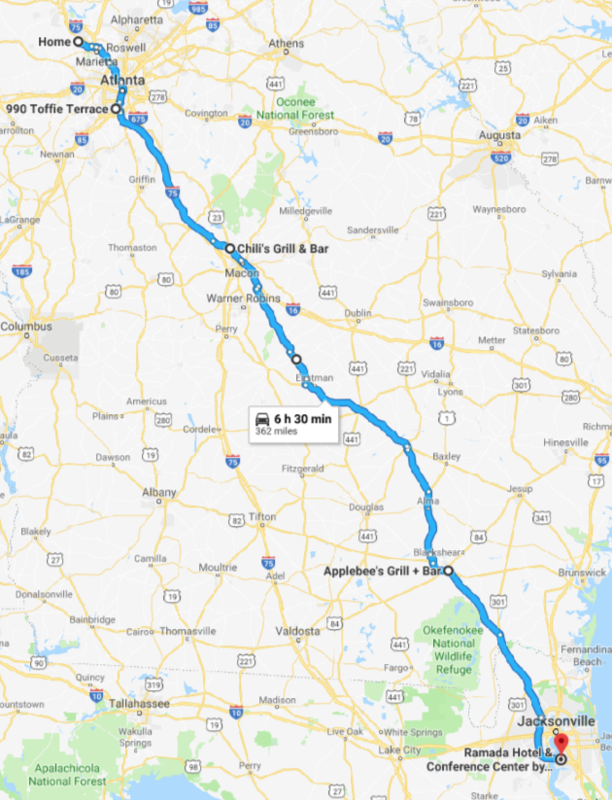 If they pass on the trip, we may call an audible and go a different way back home, either along the Atlanta coast or perhaps via Alligator Alley to the Gulf coast. We can’t dilly-dally too long as we’ll need to head to Pennsylvania on 9 or 10 July for the Tandems East Tandem Weekend on 12-14 July and a visit with my folks after the rally before making our way back home. Both the car and the truck got a light interior cleaning. Perhaps it’s the newness of the truck or, more likely, the black interior… but I find I need to vacuum it a lot more often than I did the charcoal grey interior of the Tundra or Debbie’s Honda Accord. And, since I’m giving the truck a quick vacuum and wipe down, I’ve just started to do the same with Debbie’s car. I spent a little more time investigating the source of water collected in the right rear corner of the truck’s cargo and I believe I’ve found the source — some gaps and cracks in the right-hand rubber rain flap on the A.R.E. shell’s rear door and, well, all kinds of gaps and cracks in the Tacoma’s tailgate and rear bed. I’m thinking some silicone and a few pieces of automotive rubber weather seal will address those gaps; something for Wednesday or Thursday. I’ve had to rework the adhesive mount for the phone holder/charger in my truck a couple of times and finally gave up on my original mounting technique which worked against gravity and flipped it 180°. It puts the phone up a little higher than I’d like, but if it works… who cares. The Harley received a little love after coming back from service in the way of a light cleaning with detailer’s spray vs. a full wash. I’m guessing it will get filthy on the way to Daytona, but having taken the bike apart to install my wireless phone charger, all of the painted surfaces were in need of a wipe down to remove all of my fingerprints and the other smudges I added the last week. Speaking of the Harley and our trip to Daytona, I also took advantage of our 2nd day of no rain and sunny skies and moved our Bushtec trailer from the storage shed to the garage while the lawn was dry and solid as rain comes back in this weekend. 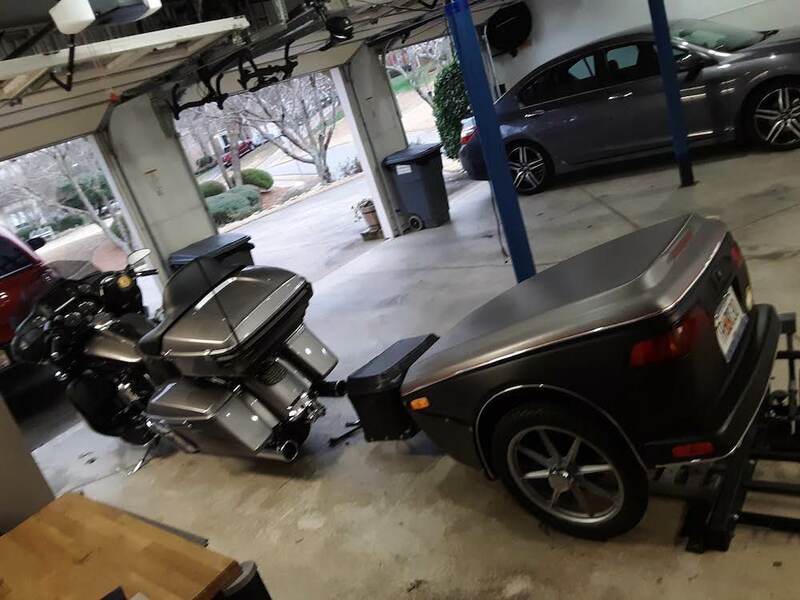 With the trailer in the garage I can now install the hitch stored in the trailer on the Harley and make sure the bike is ready to go next Wednesday, the 13th. It was dinner in and Debbie had her veggies while I made a large salad topped with diced chicken tossed in hot wing sauce. Good stuff! As for the evening, I tapped-out a couple of tandem cycling blog entries, one on our 2019 rally calendar and another draft on our Yakima Rack project I’ll finish once I find the right size clip, hoping it will be the one due to arrive at our local REI by Thursday. I also watched a couple of documentaries on Netflix that were very interesting, in particular was one on Ronnie Coleman, an 8-time Mr. Olympia who is considered by all to have been the greatest body builder of all time. His workout methods were brutal and the wear and tear they put on his body, coupled with a back injury from his college days, really took a toll on his health later in life in the form of degenerative discs and the related spine and nerve damage. He’s still a great, humble guy who at 53 years of age works out every day but has spent the past several years going through many surgeries, lived with pain every day and has to use crutches to move around during his 6-month recovery spans. Again, just very interesting from the standpoint of seeing someone who has an indomitable spirit, an insane workout ethic, etc. who never complains for blames. It always seems like it’s easier to sleep when it’s a little cold and with the mercury at 21°F this morning, that was pretty much the case. I slept in until 7:00am and then headed down to do my morning routine. Despite the cold, Debbie headed out to pick up some groceries after she finished her morning routine while I ran out to run a few errands, i.e., banking, picking up some paint for the upstairs hallway ceiling, silicone for the leaks in the rear door frame of the Tacoma’s shell, gas, a shorty 3/8″ socket wrench at Lowes and I also picked up some Kobalt wrenches at 1/2 price as Lowes continues to transition from Kobalt to Craftsman branded tools. These were the nifty hand wrenches where one end is a box-end and the other has a ratching head. I always thought they were sort of gimmicky, but after buying a couple to keep on the Harley when we’re trailering and need to have the ability remove the hitch in the event the bike has a mechanical issue and needs to go into a dealership for maintenance, they’re really pretty slick since they let you put a ratcheting head in places you can’t get to with a socket wrench. It’s the little things like this that make me happy. Back at the house I parked the truck out in the sun so I could soften-up the rubber seals on the rear door that needed to have a little silicone added to make them water-tight; getting the rear door of the shell to be water and dust tight is an ongoing project. After I had that taken care of I did a bit of a workout since it was too cold to ride the road bike and the off-road trails remain closed due to flooding. It wasn’t a terribly hard workout: some dips, pull-ups, sit-up, push-ups and curls. However, by the time I finished the always somewhat tender tendons in my right elbow were really unhappy. In fact, I believe my left elbow’s tendons were having sympathy pains. As the sun came out towards the middle of the afternoon I found Debbie outside in the back/side yard moving leaves around with a heavy bow-rake. I told her getting the leaves out of the side yard was already on my to-do list; I just wanted them to dry out a bit more before I started since they’ll need to go through my chipper/shredder to be mulched. She acquiesced to my request, but I could tell she’d gotten it in her head those leaves needed to go sooner rather than later. Therefore, it will likely be something I do tomorrow. In the interim, I did a little clean-up work around our fountains and down by the mailbox, cleaned the lens on the spotlight that illuminates our American flag at night and little things like that. As I was working on the yard the UPS driver came by with a package containing a new driver’s door switch housing to replace the one I’d buggered up with too much heat from the heat gun. Thankfully, it wasn’t an expensive part and it took all of 15 minutes to remove the old one, swap the switches over to the new one and then re-install it in the truck. By this time, it was a little after 3:00pm and the gentleman who expressed an interest in buying the stock grille I’d removed from the Tacoma came by. 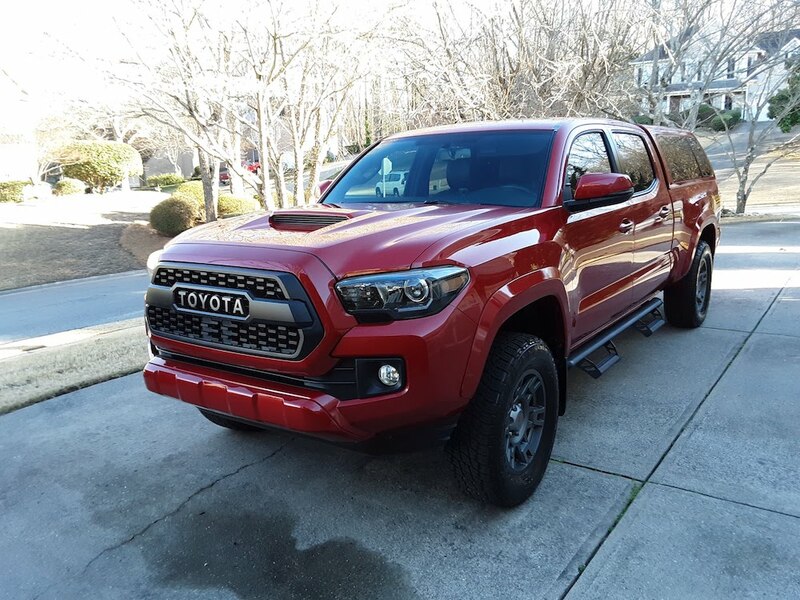 He was a very nice young man who was in the process of putting chrome on a new Toyota Tacoma SR5 while I was doing the opposite with our Tacoma TRD Sport. We talked trucks for a good while and then I showed him the grille and then gave him a quick hands-on tutorial on how to remove the grille surround from the truck and then how to remove and re-install the grilles from the surround. It was a nice 40 minute visit and I was very happy to have yet another large box out of the attic that would have simply sat there and collected dust until we ever sold the Tacoma… and then some. After all, I still have the stock grille I removed from the Tundra back in November 2006. It was dinner at home this week vs. last week’s meet up with Larry & Brenda at Guston’s; boy, what a great time. No, Debbie’s hard at it with her eating plan and she’s making sure I have all the salmon, chicken, steak and greens I need to stay happy and healthy as well. After that it was a relatively quiet night at home. I think I actually took a short nap after eating and then did a final news round-up and checked to see how the market performed; we’re holding our own. We had a bit of a warming trend with the temperature at 28°F when we woke up. We were expecting sunny skies, but it was quite over-cast for most of the morning. My morning routine got a bit sidetracked when Debbie asked if I’d bring the documentary about Ronnie Coleman up on Netflix for her to watch while she had her coffee, etc., noting she’s grown tired of the usual morning news/talk/entertainment shows. It takes a little know-how to bring up Netflix on our TV’s since we have AT&T’ as our primary service, but I had it up and going in a few minutes. Of course, once it was on I found it hard to walk away, (a) because I like spending time with Debbie when I can, and (b) it really is a fascinating story. So, yesterday’s blog updates, etc., were all slipped by a day. As the morning progressed the clouds cleared, the sun came out and the temperatures began to move into the 30’s, then 40’s by mid-morning and hit the 50’s by noon. I spent the first part of the morning making some rubber gaskets for the Tacoma’s A.R.E. 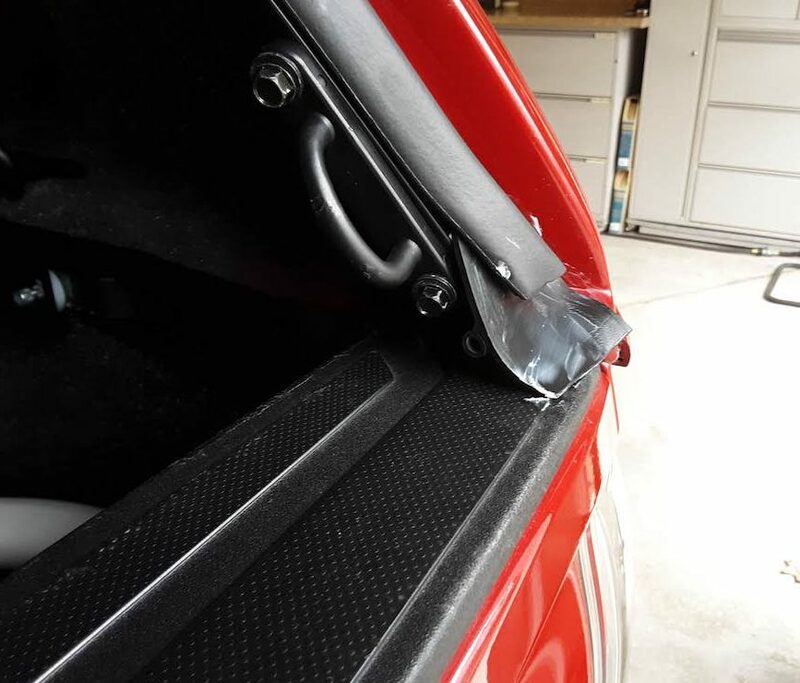 shell, my latest brilliant solution for the gaps in the rear door seal. But, as it turned out, it was a fairly brilliant solution: I even impressed myself on this one. Now, I just need to drive the truck around with them in dusty, then raining conditions to see if they work! While I was doing this Debbie was taking advantage of the lovely warm and sunny day — with the temperature now tickling 60°F — to sit out on her bench and get some sun. After lunch she had some errands to run while I turned my attention to yard work. As always, it’s a never-ending process. 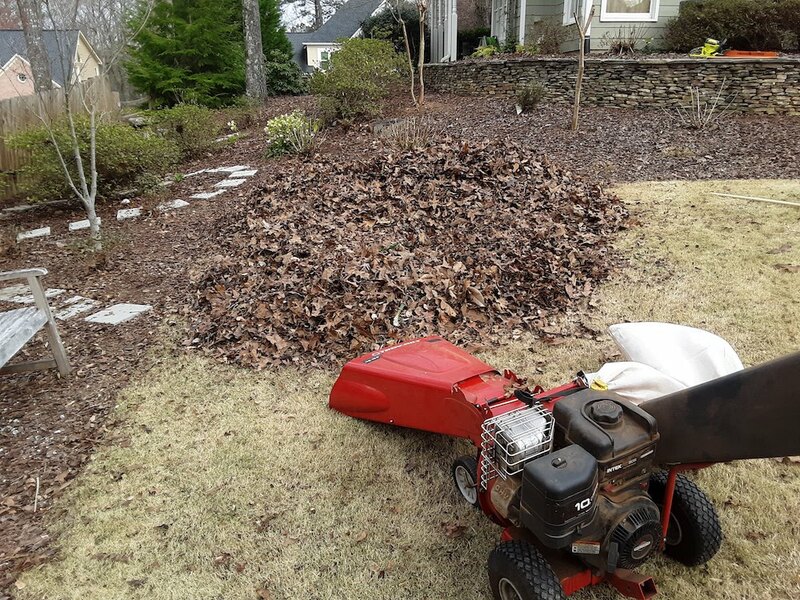 My goal was to get the leaves sitting in the side gardens raked and blow on to the grass where I could turn it into mulch with the chipper / shredder. But, as I was walking out to shed I saw those darned Yucca plants Debbie pointed out to me yesterday: I’d thought I’d removed those! Turns out they’re like weeds; nasty and hard to kill. One thing led to another: after pulling up the Yucca’s I began to trim some Azaleas, and then I turned my attention to the mass of ferns under the kitchen window and in need of attention. Before I knew it, I had two bags of yard waste sitting at the curb, hand burned through 90 minutes of my yard work time and had yet to rake a single leaf. 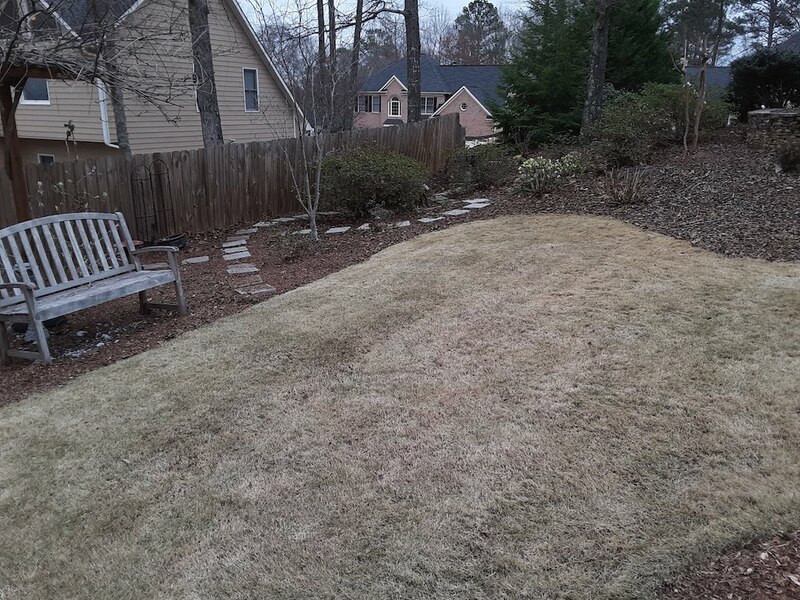 A few hours later I’d cleared the side yard & garden of last season’s leaves and turned them into mulch, then “vacuumed” the backyard with the mower to make it tidy again. Debbie had headed off to sit with all four of the granddaughters from 5:00pm until 10 or so as Wesley and Julie had another awards banquet to attend. It was around 6:00pm when I finally came in the house, changed clothes and made myself a nice big salad for dinner. Oh, it felt good to sit down. While I was relaxing UPS came by and dropped off a package from Amazon Prime. The problem was, I’d not ordered anything from Amazon Prime. It was just a week or so ago when I’d received another mystery “gift” from Amazon Prime and UPS; this was weird. I did a little on-line checking and discovered this was most likely a scam called “Brushing” perpetrated by less than reputable 3rd party Amazon sellers who have gotten customer mailing / contact information. It took me 20 minutes on the phone, but Amazon was able to get UPS scheduled to pick-up and return the package to the shipper. There’s apparently not much else Amazon can do since even they can’t be sure which seller may have compromised our address. So, in the interim, if I receive any advance notice from UPS I’ve got an Amazon shipment coming when I didn’t order anything, I’ll just instruct UPS to return it to the sender before it’s ever delivered. It was around 7:00pm when I checked my computer to see if I’d received a notice from REI that my Yakima Clips had arrived; no such luck. However, I did see where several of my ebay auctions had ended and was happy to see my headlights had been sold. Or, so I thought. By the time I had them packed and purchased the postage to ship them off I received a note from the buyer saying, “Ooops. I just realized I don’t know how to install those; can I cancel the order? Really…? !” Oh well, close but no cigar. I’ll re-list them Monday. It was right around 10:00pm when Debbie returned home from the kids. She was worn-out, to be sure. Miss Scarlett continues to be the less than ideal baby of late when Julie’s not around, not wanting to take her bottle, take naps, etc. Belva and Patrick have experienced this on nearly every recent time they’ve sat the girls, so it wasn’t an easy night for her. The sun vanished as quickly as it appeared, but at least the temperatures remained moderate, holding in the 50’s over night and through the morning. It eventually reached the middle 60’s but we had off and on rain with a few thunder showers thrown in for fun. It was the usual morning routine, punctuated by me deciding to go and see what a search on my name my reveal on the internet. Imagine my surprise when I found a full bio on MyLife that was about 75% correct. It was the 25% of incorrect information that bothered me so I set about trying to get these personal information collection sites — Mylife, Intelius, Spokeo, Radius, and BeenVerified — to remove my and Debbie’s personal data. Four of the five services were easy to deal with in terms of getting the data pulled down; however, MyLife took a little extra effort. An article that outlines how you go about opting out of these reporting systems can be found HERE. Clark Howard has more detailed information on his website regarding MyLife that you can find HERE. I’m pretty sure that morning exercise, coupled with yesterday’s discovery of the “Brushing” scam and “other stuff” put me in a less than ideal frame of mind that remained with me the rest of the day, which was kind of bothersome because I knew it and couldn’t shake it. I was just irritable. After my angry morning and lunch, I put on a suit without a tie and headed off to a 1:00pm 20 year reunion of folks who were on the C-130J development program, hosted by my last boss and a co-worker of 20+ years, George. It turned out to be a nice time and it was great seeing folks whom I worked with back in the 1980’s from my time out working at Lockheed out in California and who were transferred to Georgia for the F-22 program in 1991 who, like me, ended up on the C-130J program by the end of the 90’s. 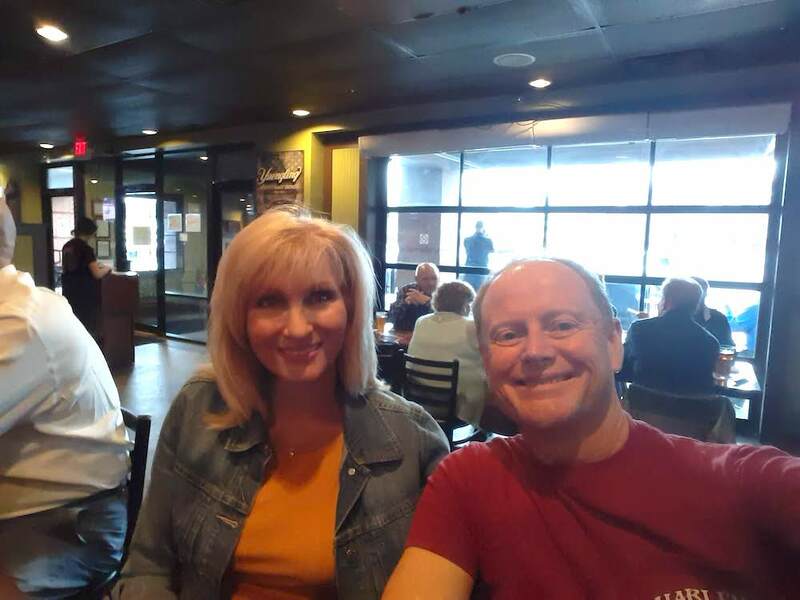 We initially met at the plant in Marietta for a reception, update briefing and tour of the facility and then moved to a nearby restaurant for a social around 3:00pm. Again, just great seeing folks whom I’d not seen in quite a while as well as some of the former co-workers I left behind when I retired back in June. And, yes… it’s hard to believe I’ve been retired for 8 months. It was around 4:45pm when I had to make a final round and say goodbye as Debbie and I were scheduled to meet our friends David & Deb for dinner at Aspens to celebrate Deb’s birthday. Fortunately, traffic wasn’t awful, so I was spared that work-related experience. Sadly, when I got home I saw that we’d received a “Morgan Stanley on the Markets” Email which our financial guys and Morgan Stanley only seem to send out when the market has tanked again. Sure enough, we’d had a really lousy week and Friday ended with a big thud. We arrived at Aspens promptly at 6:30pm with Deb and David arriving a few minutes later. We were seated early as the restaurant was not anywhere close to being full, something I found unusual as it was always packed whenever we’d been there for dinner in the past. As we went to our table I spied yet another co-worker from Lockheed and his wife having dinner and said hello to them before joining the two Deb’s and David at our table. 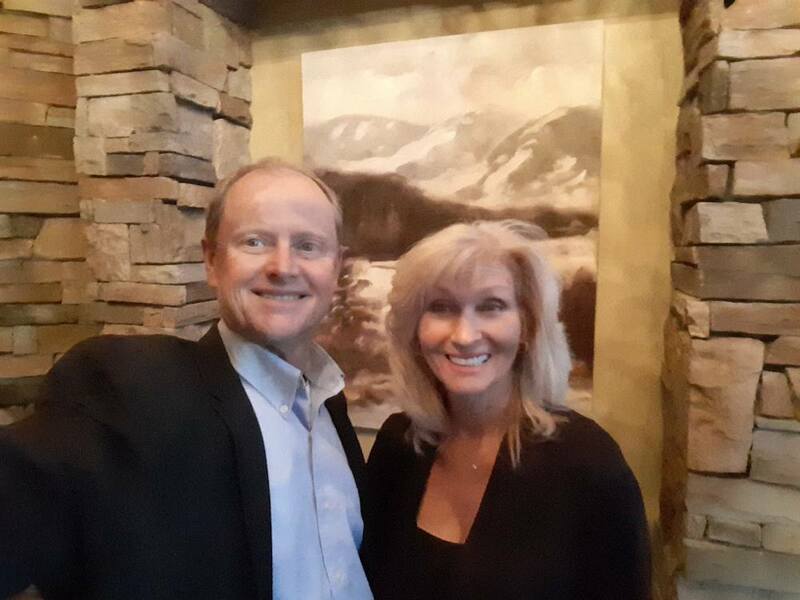 We always enjoy being out with David & Deb but, quite honestly, the food at Aspens was a huge disappointment. I made the mistake of ordering a 1/2 order of Oysters Rockefeller and if there were oysters under the toppings I’ll be darned if I could remember finding one. In fact, as we were leaving we saw an order of the raw oysters and they were also miniscule. As for our entree, we split what was billed as Cajun Shrimp & Grits, jumbo shrimp over gouda grits with Andouille sausage. What we received was a bowl with 4 shrimp sitting in what looked like a bisque, not a bed of grits, and in the grits were a few small pieces of coarsely chopped sausage. Just a huge let down. David & Deb ordered steaks and while Deb’s was amazing, David’s was over cooked. They brought him another and it was good, but not great. So, while it was enjoyable to be out with David & Deb at a nice restaurant instead of a bar, but actual dinner was not good. In an effort to end the evening on a high note, Debbie suggested dropping by Guston’s to see if our friends Dave & Trudy might still be there and to listen to some live music. I had the same thought in the back of my head as I was still in a funk and needed to decompress. It was a good news / bad news story. The good news was, our friends were there along with another couple from our neighborhood. The bad news was, Guston’s booked in a band with something of a fan base from the local area and the usually light-hearted, relaxing adult atmosphere of Guston’s was no where in sight. There were far too many rowdy power drinkers and folks who were a bit rough around the edges filling the place and the band was way too loud. In other words, it was anything but relaxing and I told Debbie “we need to go.” So, after spending a little time with our friends and a nightcap, we headed home. Anyway, that was my Friday, a little bit of a roller coaster with highs and lows. Once again, we woke up to a damp and cloudy day, but there was hope for the afternoon. 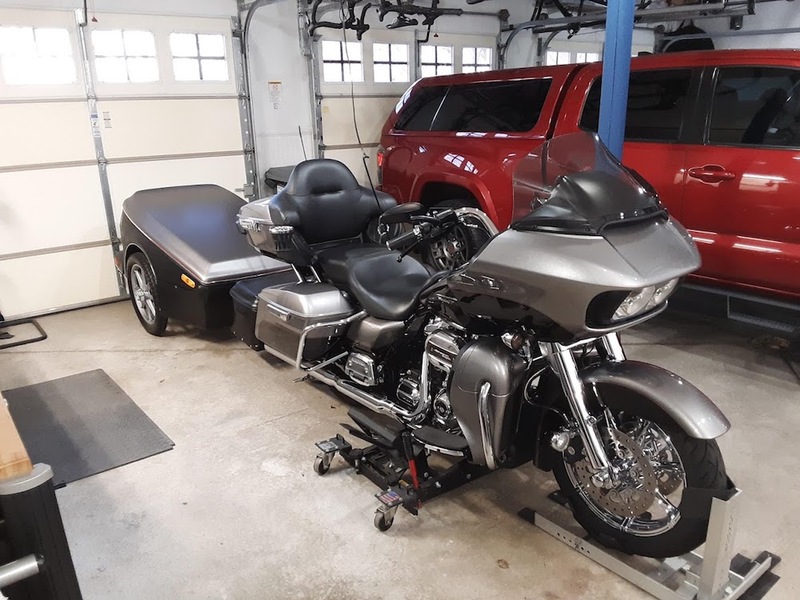 After a little breakfast and updating Friday’s blog, I headed out to the garage to install the trailer hitch on the Harley ahead of next week’s ride down to Florida. It only takes about 30 minutes to remove or install the hitch so I’ve made a habit of taking it off the bike once we return home from a trip and store it in the trailer until I’ll need it back on the bike for the next trip. I’ve gotten pretty good at the removal and re-installation process over the years so it’s really not a bother and I prefer not having the hitch on as it tends to get in the way if you have to do any maintenance on or around the rear wheel and tire. So, as of now, the bike and trailer are all set to go: tire pressures have been adjusted, all of the lights work, the trailer’s neck bits have been lubricated, etc. All we need to do now is attach the trailer to the bike, pack our bags and then put the bags in the trailer. Come on Wednesday! With the all set to go, I turned my attention back to the leaky rear door of the Tacoma. You see, as impressed as I was with my little gaskets, after the truck sat out in the rain on Friday evening I discovered they did nothing to reduce the amount of water getting into the bed of the truck via the back door. So, today’s project involved setting up a camera on a tripod inside the truck with some lighting and then flowing water from a hose over the door so I could capture the leaks on video and see where they were actually coming from as my intuition was apparently wrong. In fact, it turns out I was wrong about how the seals were supposed to be positioned as well. While I was doing this, Debbie was out running a few errands and visiting Pike’s nursery as she’s got a case of Spring Fever and is dying to get out and dig in the dirt… except we only have mud. So, it was mostly looking and asking questions, not so much loading up her car with things to plant just yet. After not hearing of any grand plans from our friends for the coming evening, we decided we’d head over to Loco Willy’s for dinner and play it by ear from there. We had a very nice time at Loco’s, noting that Saturday is definitely the better day for us to visit, at least until things warm up a bit. Even then, we’re thinking Guston’s may become our new Friday night place with Loco’s on Saturday. We’ll see. As we were headed home from Loco’s we decided we’d head up to our little resort in the North Georgia mountains and do a little dancing in their night club, as they always have a really good DJ most evenings. So, we headed home, got changed and headed back out, arriving around 10:00pm. 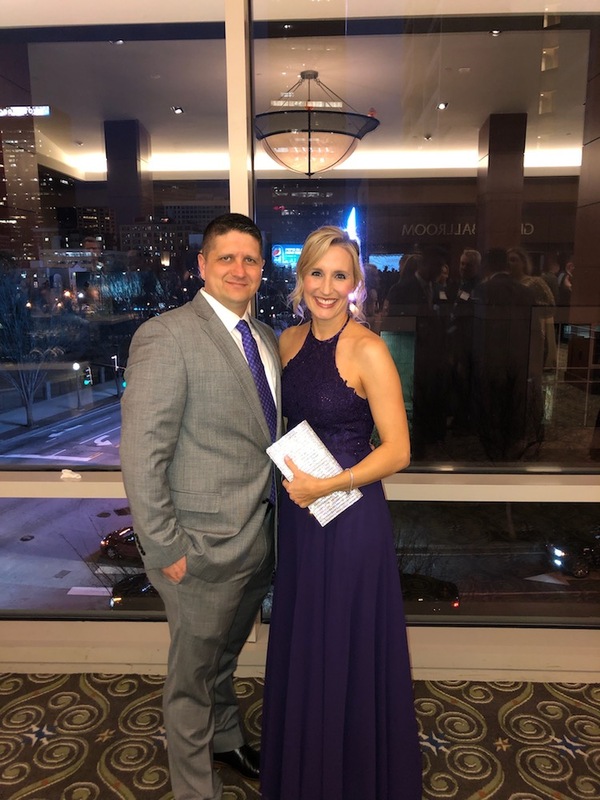 We had a great time visiting with friends and danced the night away before calling it a night and retired to our room around 1:00am. It definitely made up for Friday night’s less than enjoyable experience at Guston’s. Guess what! Yup, it’s still raining. After losing an hour of sleep because of setting the clocks ahead, we made our way home, arriving around 10:30am. I immediately worked my way around the house resetting the clocks from 9:30 to 10:30am, solidifying the start of daylight savings time. Losing that hour of sleep and moving the clocks ahead always screws me up, and putting that on top of our depressing weather made Sunday feel like it was definitely going to be a day of rest for both of us. After resetting clocks I did a bit of home finance / banking stuff and some other “office work” before heading out to the garage to find out how damp the back of the truck was after last night’s rain and this morning’s rainy ride home. Yes, it was damp: can’t wait to get those leaks fixed! We had a late lunch (well, not really if you ignore daylight savings time) a Loco Willy’s as Debbie was craving a burger and, since The Red Eyed Mule was closed, Loco’s “Willenburger” was our next go-to burger. 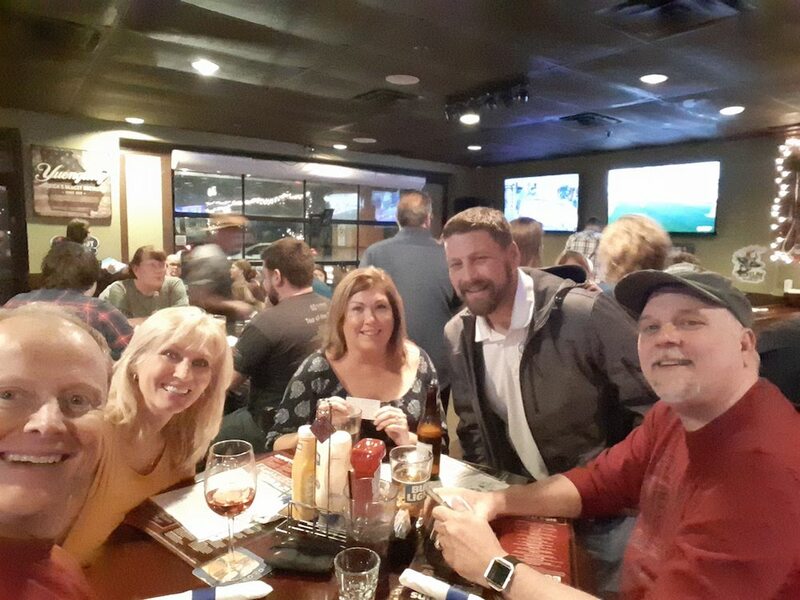 As always, we found quite a few of the usual suspects at the bar and we’re happy to see the nice weather allowed Loco’s to fully staff the outdoor patio bar and seating areas, which freed-up a lot of seats at the inside bar. Back at the house we continued to struggle with the time change. We flipped the NASCAR race from Las Vegas on in the family room and had the Atlanta United soccer game on in the kitchen and as we were taking in the events we saw where our friends Ryan and Jeanette were looking for something to do. Not really wanting to get out, we invited them to drop by the house and about an hour or so later they did. It was just the four of us sitting around the kitchen table for a good 3-4 hours sipping cocktails, watching some movies in the background, etc. It was around 7:30pm when I threw a couple of steaks on the grill and made some mac & cheese and that became our dinner. Just a great night. 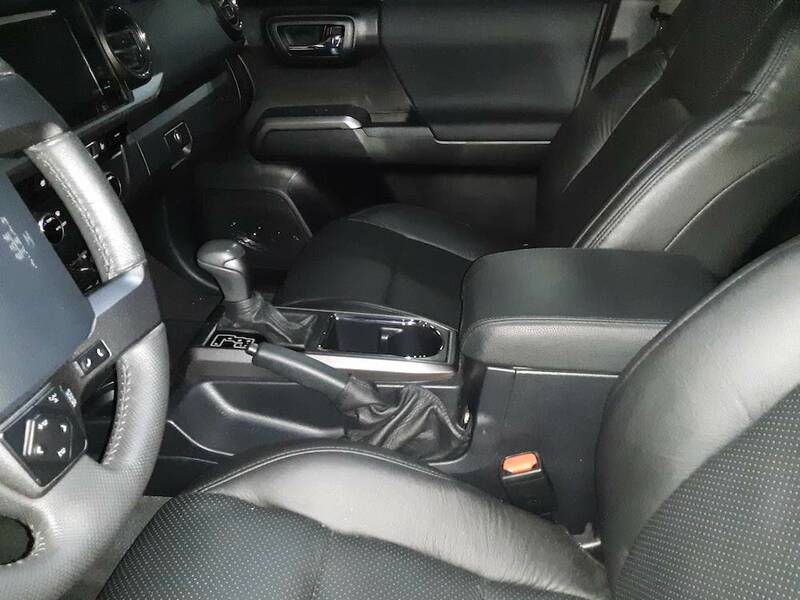 Why, you might ask, would someone want to bother with the expense and effort to “upgrade” something as utilitarian as the shifter and brake boot or your center console cover / arm rest cover? 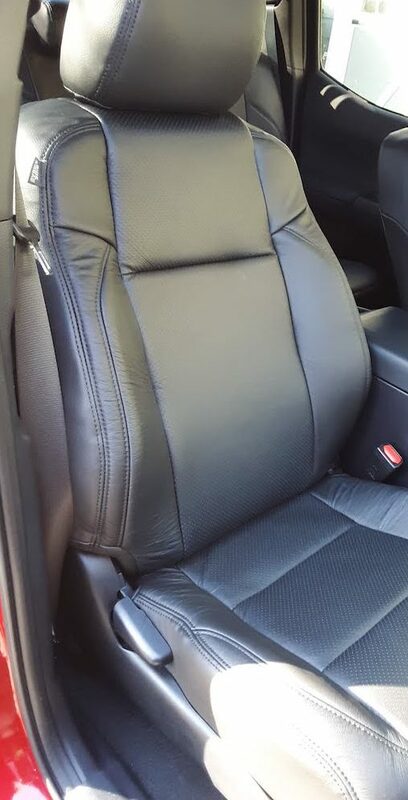 Regular readers may recall that back in December I replaced the original, cloth seat covers in our Tacoma with a set of leather seat covers from an on-line firm called LeatherSeats.com; you can find the details in this blog entry. 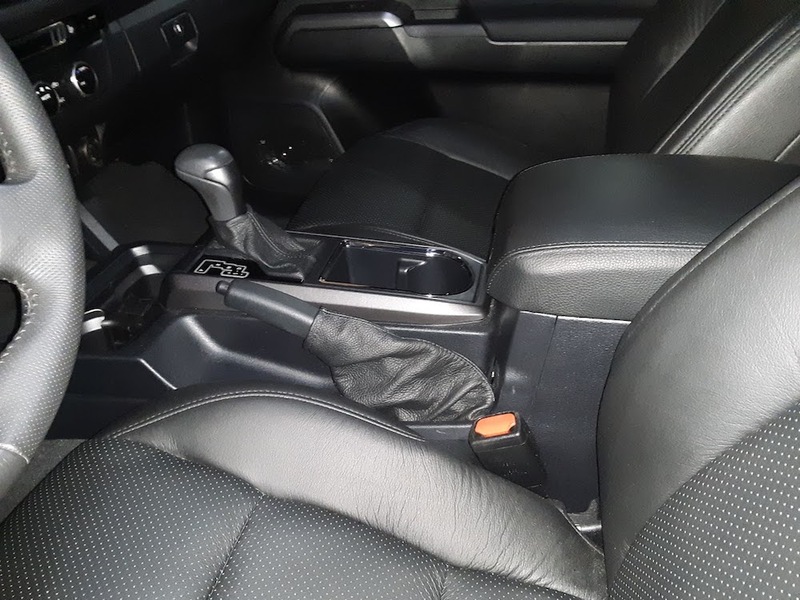 Of course, now that the seat covers brought the overall level of quality in the Tacoma up to Lexus standards, the vinyl shifter and brake boots looked absolutely cheap and tacky and the hard rubber center console lid / arm rest looked out-of-place as well, never mind being about as comfortable to rest an elbow on as a brick. 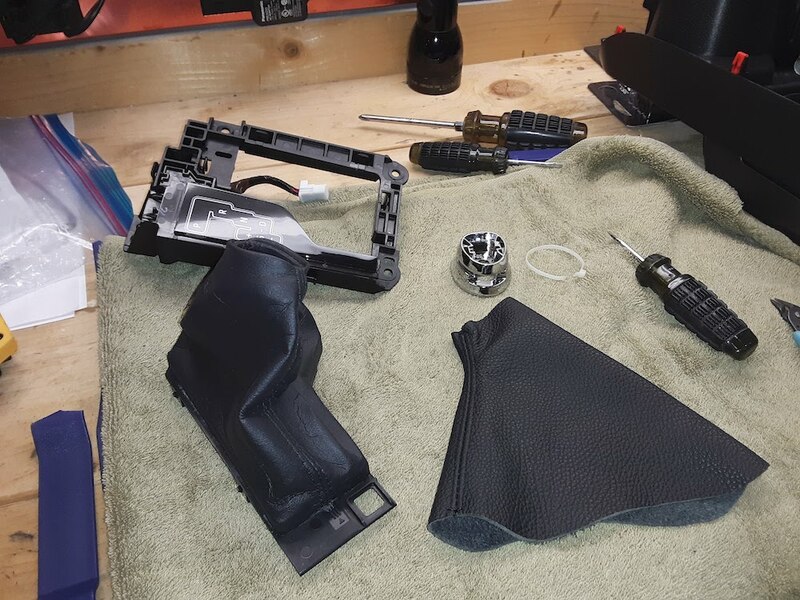 So, although not originally planned, the need to find a firm that made real leather replacement covers for the shifter, brake level and armrest came to the fore. REDLINE GOODS – YOUR ONLY OPTION? 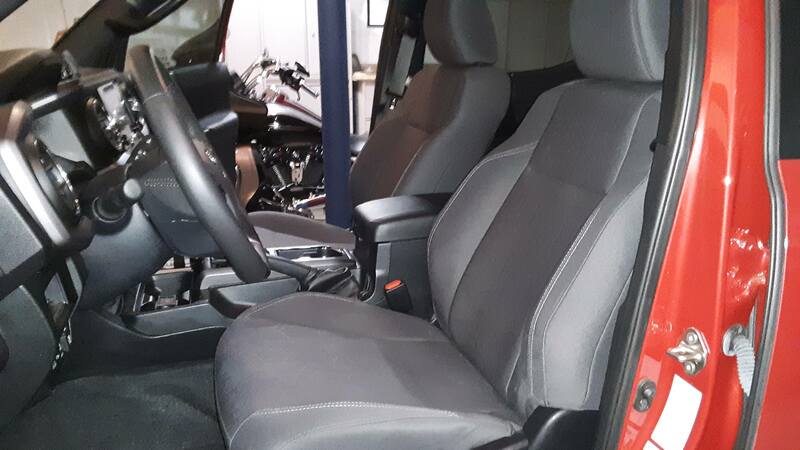 As I began my search I could only find one firm in the business of making full sets of aftermarket leather shifter & brake lever boots and arm rest covers for the Tacoma trucks: Redline Goods, an e-tailer operating out of Poland. There were other companies who made shifter boots, but none appeared to be making all three boots which you’d logically want to come from the same company at the same time so the leather they used on the three different covers would be very similar. The pricing seemed reasonable given the obscure nature of the market and Poland is actually a great place for textiles. Moreover, it appeared as though there weren’t too many brands and models of vehicles for which they didn’t have patterns which suggested they knew their business well. My needs were simple: black leather with black stitching. I placed my order back on 29 January and the three pieces of leather arrived in a large, white padded envelope on 20 February. I paid the $19 up charge to have the wire frame pre-installed in the brake lever boot as I didn’t want to mess around with trying to extract and then re-insert it myself. But, overall, I was pleased with the quality of the three covers I’d received. It wasn’t until the evening on Wednesday, 20 February, when I carved-out some time to do the boot installations. Having taken the interior of the truck apart a couple of times now, this wouldn’t be all that challenging… or would it? I read Redline Group’s installation instructions just to be sure what I had in front of me, and it was pretty straight forward. The brake lever boot was a fast & easy swap-out; however, the shifter boot was a bit more entailed. 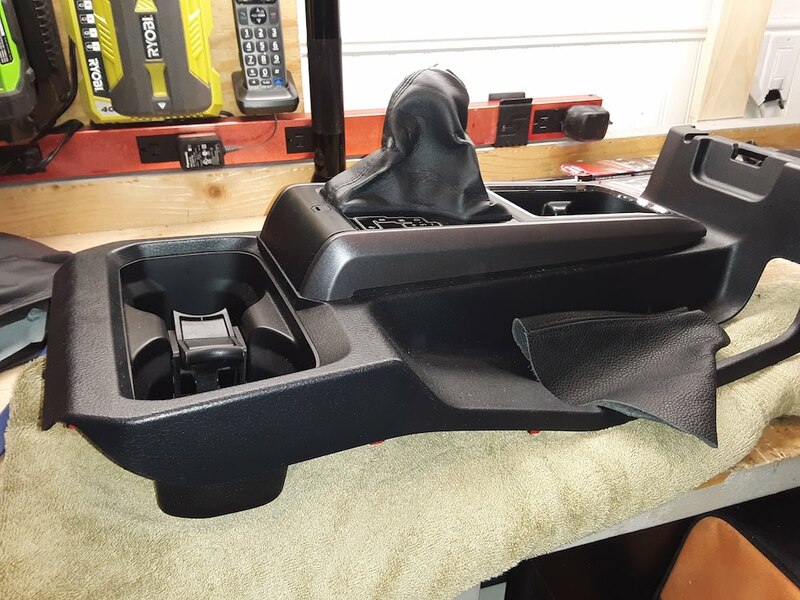 I had to disassemble the gear selection console and then remove the shifter boot housing from the sub-console and then separate the glued-on vinyl cover from the boot housing. 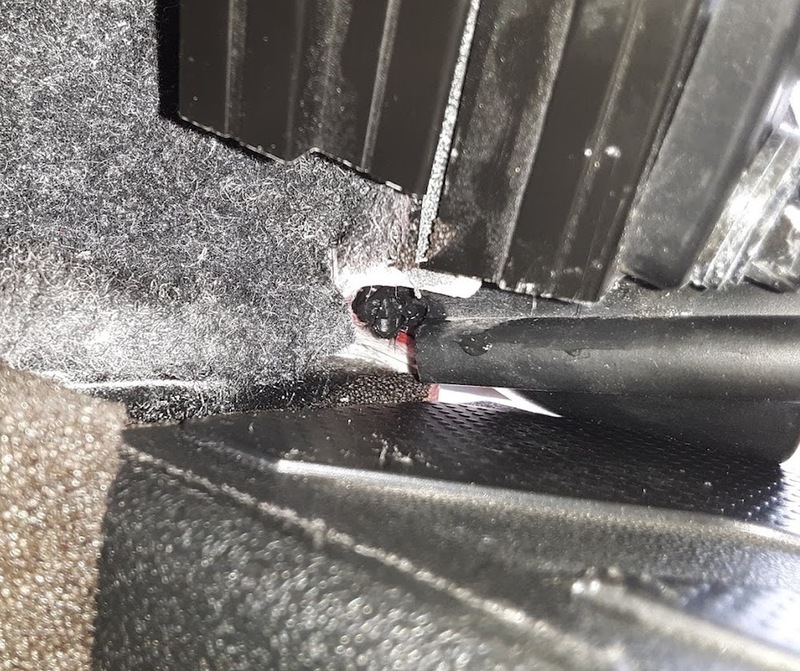 The new leather boot and the housing had to be sprayed with 3M heavy-duty adhesive so they could be bonded together before everything went back together. That added a good 40 minutes to the project but the result was worth the effort. The leather boots look and feel great and truly were necessary given the quality of the leather seat covers I’d installed. The arm-rest cover turned out to be a bit more challenging, if only because I wasn’t happy with how it looked and felt after installing it per Redline Good’s instructions. I’ll skip the gory details and note I put it all back together with the arm rest cover installed over the original arm rest top, which looks good. 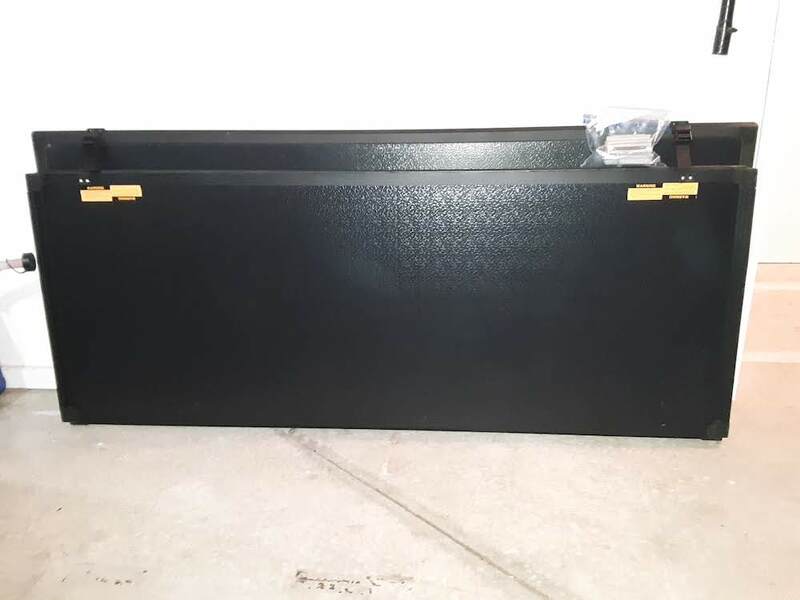 But, it was still a work in progress at the end of the day as I needed to purchase some 1″ thick densified polyester batting from the fabric store to be installed between the leather cover and the original hard rubber cover. In order to make this all work I was drawing on my experience from working on motorcycle seat covers to come up with a better fit, feel and finish vs. slapping the piece of leather over the plastic lid/arm rest with a thin layer of foam. On the following night, it took me about an hour to remove, modify and reinstall the armrest but it turned out better than I expected. 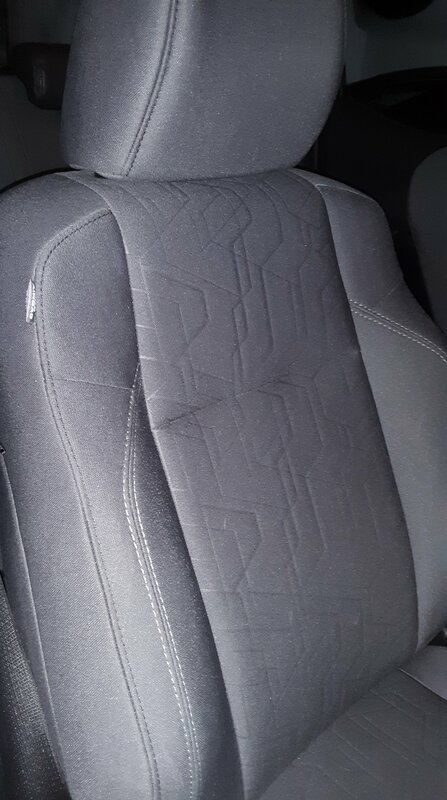 As mentioned, I decided to ignore Redline Good’s installation instructions and treated the armrest recovering project just like a motorcycle seat installation, fixing the leather cover in place after pulling it tight over the foam and molded top of the armrest using an electric staple gun and 1/4″ staples. This is the only way I know to get leather properly stretched and aligned over some type of plastic or fiberglass foundation, akin to a motorcycle seat pan. The plus here was the way the console top / armrest was made, the leather-covered and now padded console top / armrest would be pressed back over a plastic inner lid held in place by six screws, with both upper and lower lid parts sandwiching the hinge assembly that attached the console cover / armrest to the center console housing. Again, once I had it all put back together it looked really nice and now had a lovely, plush top that’s easy on the elbows! Bottom Line: The minimal time and expense required to make this change was well worth it. 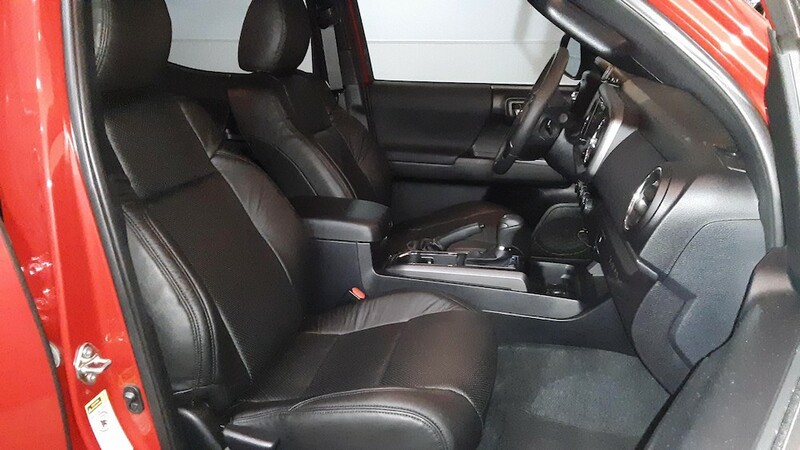 The boots look like proper boots and share the natural leather look and feel with the seat covers. The armrest has the same natural leather look and is, for the first time, soft and comfortable as well as being a little taller than it was before. Frankly, I’m not really sure why Redline Goods advocates and instructs you go glue their leather cover to the hard, barely padded inner cover top of the original console top / armrest, or use glue at all. But, it’s their product so if you read this and opt to deviate from their installation instructions you do so at your own risk. I’ve briefly described the technique and will note you can find videos to show you how tack & stretch upholstery installations are made: that’s all this is. Yes, it will take a little elbow grease to press the inner cover back on to the now leather-covered and padded hard rubber armrest and you’ll find you need to trim away some of the rubber tabs on the cover, but I think the end result is a great looking and feeling armrest that looks factory correct with the leather seats and shifter/brake boots. Weekly Journal: February Showers Bring March Flowers? I’m really beginning to wonder about Mother Nature; has she outsourced climate management to the lowest bidder? Seriously, I know it’s winter but you wouldn’t know it. It’s not been cold enough long enough to kill off the pesky insects like Mosquitoes, and we’ve gotten more than enough rain for March & April. The temperatures have been so mild that the trees and flowers have all started to bloom early, right as the temperatures will plummet later this week: so much for a beautiful bloom by most of our flowering trees and shrubs. But, the biggest challenge is trying to stay energetic and cheerful when you wake up to one dreary day after another. As we look ahead to this coming week we WILL have SUNNY weather… but with the highs only in the 40’s. So, it will look lovely but one step out the door will remind you that Spring is still a couple weeks away. Well, setting all of that aside, we did have a couple of really enjoyable meet-ups with friends this past week. One was something of a surprise when we discovered a couple whom we know from tandem cycling were passing through the area and camping in a nearby national park. We met them for dinner, noting it had been 9 years since we last saw each other. And, while I wasn’t as productive as I’d wanted to be, I was able to get in a bicycle ride, complete and install a homemade wireless phone charger for the Harley-Davidson motorcycle, catch up on my technical blogging, give some much-needed cosmetic care to the Tacoma’s trim, finish the Tacoma (no more planned upgrades!) and sold-off the tonneau cover that’s been sitting in the garage since early January. Debbie was able to spend some time with Scarlett on Thursday and Caroline on Saturday while doing all of the things she does that I probably don’t mention often enough; she’s the best! As mentioned, last night was a rough one for Debbie but, thankfully, it turned out to be a passing thing; thank goodness! She was back into her normal routine by mid-morning and exercising before noon. Me, I was up a little later than usual but was still able to get last week’s journal finished up so it could go out in today’s mail and hopefully arrive in my folks mailbox on Thursday. Seems to be about a 3-day trip for 1st class letters. This pile of boxes is substantially smaller, but not yet gone. 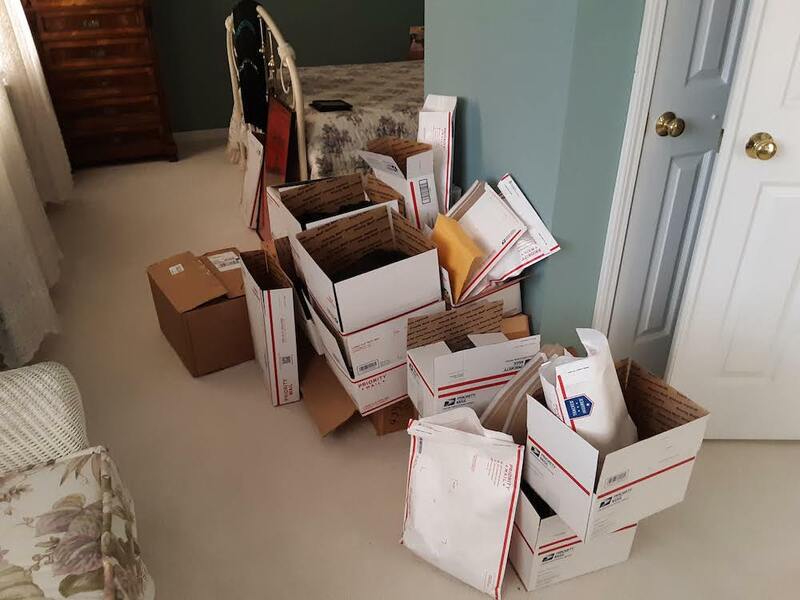 I had just one package to get shipped out today and had it wrapped and dropped off at the post office before 10:00am. Again, I’m really amused by the different postal rates. In this instance I had a 4.4lb item that fit in a Large-size USPS Priority Mail / Flat Rate box. The flat-rate shipping fee would have been $17 for the Flat Rate box but, because I wrapped the box in brown paper and simply calculated the shipping rate based on just the box size and weight, the same USPS Priority Mail service was only $9.12. I just don’t understand how their business model works, unless there are just a lot of folks out there shipping really heavy items that see a cost benefit. It’s a mystery, to be sure. Looking ahead to our trip to Daytona Beach, Florida, on 13-17 March, I was able to get our friends a room at the same hotel we are staying in at a non-discounted rate as reservations begin to get cancelled. I’m now waiting for them to confirm they’re OK with the cost so I can make sure I don’t get left holding a $291 deposit that becomes non-fundable in a few days. No good deed goes unpunished, so I may live to regret having leaned so far forward on this. With the sunny skies and temperatures trying to get out of the 40’s and into the 50’s I’d thought about a bicycle ride, but just couldn’t get motivated enough to head out alone, noting it was still a bit too cool for Debbie’s preferences and she’d already decided to do her exercising at home. I’m not going to “I should’a on myself” but it was truly a missed opportunity to take advantage of a nice day. I’ll have to make a point of getting out tomorrow and just ride a longer loop, either before or after we pick-up the Harley which will take a good one and a half hours out of our day. 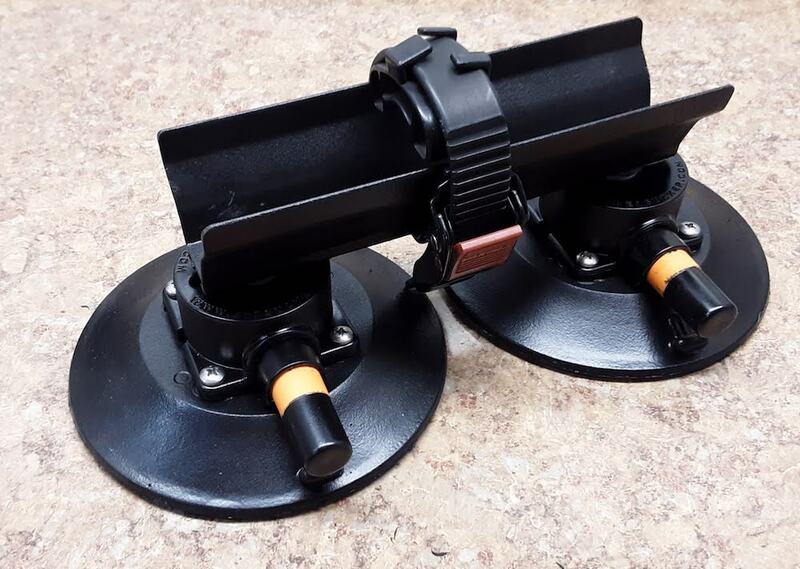 As for what I did with the time I could have been out cycling, I ended up refinishing the two suction-cup mounts I used to attach the rear wheel of the triplet to the top of our fiberglass camper shell. I bought these back in 2012 when we acquired the triplet and didn’t want to drill holes in the shell for a traditional roof-mounted rack system and they’ve worked-out really well, having never come loose. When I bought these, ‘Sea Suckers” as they’re called, they were marketed primarily for use on boats as temporary mounting devices for fishing rods, beverage holders, electronic equipment and the like and, as such, only came in white. Although they’re now offered in black, I figured I’d see if I couldn’t repaint these fully-amortized models with a combination of flexible, rubberized “Plasti-Dip” paint on the top/exposed side of the rubber suction cup base, a self-bonding paint on the plastic housing and plunger and then some bed liner paint on my small rear wheel tray for their 2nd life on the Tacoma. I must say, they turned out rather well! While I was waiting for the paint to dry I found myself doing some a little more maintenance work on the Tacoma’s plastic exterior trim by applying some “Back-to-Black” trim restorer & conditioner and to the various rubber seals using Shin-Etsu grease, a product developed by Honda specifically for automotive weather seals. Debbie spent a good part of the afternoon seeing what she could find at Pike’s Nursery and a few other places while also doing a little grocery shopping and taking advantage of just being out of the house after hunkering down during last weeks’ gloomy weather. We did dinner in since it allows both of us to eat the things we should be eating and avoid the things we really don’t need in our diet during the week. Debbie has been leaning towards a diet high in fruits and vegetables where I stick with things like fish, chicken and steak and a side salad or some type of “greens” thrown into a tortilla with the protein du jour. We tried to call my parents but both of our cell phones or, more correctly, our cell phone service was acting up. Therefore, we were unintentionally “pranking” my folks with what had to be four or five failed phone connections in short succession. All but one of them came across as a busy signal to us, but on the last one we were able to make a very short connection where we heard my mother say, “Hello” but our voices didn’t carry back so she said something to the effect of, “Just stop it!” at which point we realized the phone had been ringing and being answered by my mother; whoops. We’ll try again in the morning. As mentioned, we signed-up for Netflix, our first subscription media service, and I had all of our TV’s set-up to work with the internet / streaming applications except for the older, non-smart TV in our bedroom. So, today it gained a compact Sony BlueRay / DVD player with a built-in WiFi interface and is now connected as well. As for whether or not we’ll stick with Netflix, that’s still TBD. We’re in a 30-day trial period and as I look over their offerings there’s a lot of stuff out there, but it’s an odd collection. Moreover, I was a bit disappointed to see some of their documentaries are seriously biased, with three-out-of-three programs about Donald Trump having an overtly negative message and spin, not the typical glowing celebration of political figures who are embraced by Hollywood and the media. Once again, content control is a powerful tool. So, Netflix may not be the end-all for us, but there are a lot of other options out there that could lead to us dropping traditional cable and/or satellite-based TV content… that is, if it will be user-friendly enough to make it practical. After another night where I couldn’t settle down until 2:00am, I was up at 7:00am with great expectations for another sunny day. Sadly, those expectations were not met. The day began with overcast skies and, aside from a few brief moments when the sun peeked through the cloud cover, it remained overcast for the balance of the day. Our friends heading down to Daytona decided to stay put at their hotel a few miles north of where we’re staying because, as expected, far less expensive than the room at the Nautilus now that we’re within a couple of weeks of our stay. While I would have liked to have them at the same hotel, we’ll make it work and, well, I was able to cancel the reservation I’d made on their behalf and get my Amex account credited for the full $291 deposit. It was around 9:00am when we attempted to call my mother and, thankfully, had success on the 1st try. After explaining we were the source of the “prank phone calls” last night we moved on to the normal weekly chit-chat and finding out how she and Bill were getting along. 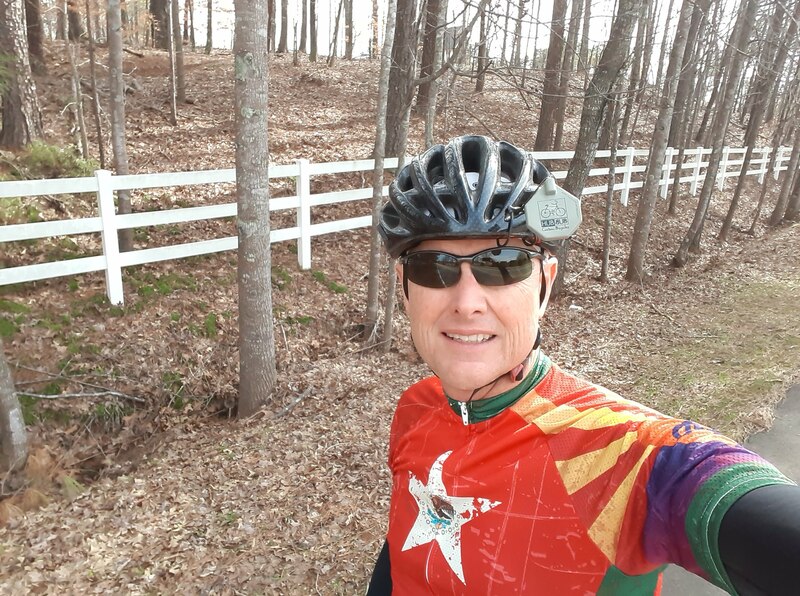 I was able to get out for a short spin on my bicycle around 10:00am. It was 50° and cloudy and while it felt good to be back on the bike, my legs and in particular my left knee weren’t feeling 100%, hence the shortened ride. Debbie and I began watching the 1st of a 4-part series on NetFlix series entitled: Trump – An American Dream. It turns out, this 4-part series was produced by the same outfit that did the shorter and far less balanced “Meet the Trumps” documentary I watched last night. Again, while they include interviews of some close associates, the majority of the editorializing comes from former members of the press corps and media who are life-long critics of Trump. More to follow on this, I’m sure. After lunch we headed off to collect the Harley from Atlanta Harley-Davidson. For some reason the drive over seemed exceptionally long today. Yes, there are other Harley dealers who are a bit closer to home, but it’s worth making the drive over to Lithia Springs: they’re simply the best in my view. The bike was ready to go with the new clutch valve installed, which gives me great piece-of-mind, along with the previous ruling on the cruise switch behavior, as we get ready to put about 1,200 miles on the bike in two weeks. The 1st was at Carnival Shoes to pick up a new pair of Nike Sliders after my 12-year old ones fell apart last week. The 2nd was a Wine & More to replenish my home stock of Sauza 1800 Silver; I swear, it just seems to evaporate! The 3rd stop was at Hobby Lobby to pick up another small plastic box that will be candidate #2 for my wireless charger installation project later this week. Back at the house a box had been left by FedEx on the front porch (noting they have clear instructions to leave all packages on the side porch) with the new fog lights for my Tacoma. Long story short: they were junk and are already on their way back to the seller. I’ll just live with the fog lights I have, thank you very much. We made contact with some cycling friends from New Jersey who we discovered via Facebook were camping & cycling in the local area on their way to an off-road tandem weekend down in Ocala, Florida on Friday through Sunday. We’ll be meeting with them for dinner tomorrow night and in the future they now know they have a place to stay if they don’t feel like glamping (aka, Glamorous Camping) in their AirStream. Well, the sunny weather was nice while it lasted. Today it’s still warm, but overcast with rain on the way. Cest la vie. But, it’s still a pleasure getting up at 6:00am instead of getting up at 5:30am, rushing to get ready for work and being out the door at 6:00am!! I try to keep this in mind when we have days that may or may not afford me ideal weather for bicycle ride or other outdoor activities. And, there’s always plenty of things to do inside, including exercising the body and mind. In addition to my usual morning reading and writing, I spent some time corresponding with our investment advisors as it looked like they were shifting nearly all of our holdings around in all six of our retirement account portfolio’s. Their rationale was, rather than riding the tide of some expected future volatility they would rather take a defensive position to maintain the gains (they call them gains, I remind them they’re still down $70k from where we were in July after I retired) made since the 1st of the year during the market’s recovery. If they see upside opportunities, cash reserves held back from the defensive investments can be used to take advantage of those opportunities. While I typically prefer to see a more aggressive, growth oriented strategy I also understand the need to protect what we have, especially when everyone is talking about headwinds and market volatility in the coming months. I also decided to change our gas service provider, or as I like to call them our gas brokers. I find it humorous all of the natural gas we use comes to us via the Atlanta Gas Light company’s infrastructure: the distribution facilities, pipes, meters and data collection technology as well as the gas flowing through the pipes. But, we have 8 different companies who act as salesmen for our gas service. So, every year we typically lock in a fixed rate for the coming year’s gas service at some per/therm value and then each year the current provider tries to get you to simply re-up, knowing there are other firms out there offering lower rates. Of course, when you attempt to decipher the rates after factoring in various per-therm discounts, fees, give-backs and incentives you find they’re all within 10% – 15% of each other. This year I decided to switch over to Scana from Georgia Natural Gas (GNG) if only because GNG has been a pain to deal with for on-line billing. They want you to use their 3rd party ebilling partner and make doing otherwise a challenge. So, bye-bye. We’ll see how easy Scana is for the coming year, noting we’re really just setting our rates for next fall and winter; this one has been mild. Of course, March is when you can get burned as you switch providers as you can end up in a variable pricing structure when temperatures plummet and gas prices spike. So, well see what happens. Speaking of on-line bill paying; wow! Not sure why I waited so long to jump on this. It’s truly a wonderful thing being able to hit a few key strokes and have your bill paid on the day it’s due or, for me, I always have them paid a few days early. In fact, a lot of our service providers offer paperless billing so between the two the amount of mail we receive has been cut easily by 80%, both coming and going. In fact, I think there may only be one service related bill that still gets paid by check to a local landscaping firm. Well, and then there are the hard copies of this weekly journal I print and mail out to my folks every week. As for my project du jour, today it was all about the Harley. I’d been working on a wireless charger to add to my smart phone holder and with the bike in the shop from last Thursday through yesterday I was in a holding pattern as 1/2 of my home-made solution was already installed on the bike and needed to be removed and adapted so I could finish my weather resistant circuit board interface box and do the physical installation on the Harley. Today, we achieved wireless charging on the Harley! While I’m sure a better, production-quality wireless charger for motorcycles that’s as easy to use and secure as our Ciro SmartPhone holder will eventually be available, in the mean time I now have a home-made solution. It’s basically a wireless charging coil embedded in a rubber mat thin enough to fit behind a smart phone in a Ciro Smart Phone holder, with the circuit board now moved 5′ away into a water-proof enclosure with a USB power source in the fairing of the Harley. Power switches on & off with the bike at start-up & shut down, but can also be cut-off by an accessory switch. So, no more plugging and unplugging the phone or worrying about getting caught with a “hot USB plug” that shorts-out during a rain squall. 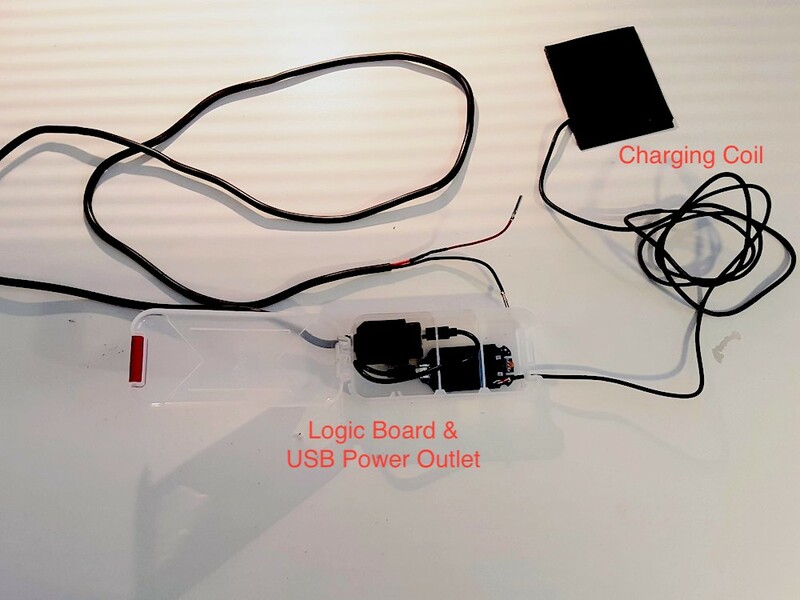 There’s probably about $25 worth of material in the device: $1.99 box, $6.99 charging coil, $6.95 for USB power outlet, $5.00 net worth of rubber and styrene (I have left-overs), $6.00 for 2 cannibalized 3′ long USB power cables; should have bought a 6′ cable instead. One of the “tricks” to this was using a clear plastic enclosure and mounting it in a location that allows the charging status LED to be illuminated through a small hole in the Harley’s inner fairing. Stick the phone in the holder, turn on the ignition and the phone begins to charge: what could be easier? Nothing to plug or unplug and just to be on the safe side, power to the wireless charger can be shut down using an accessory switch when not in use and/or while riding in heavy rain. 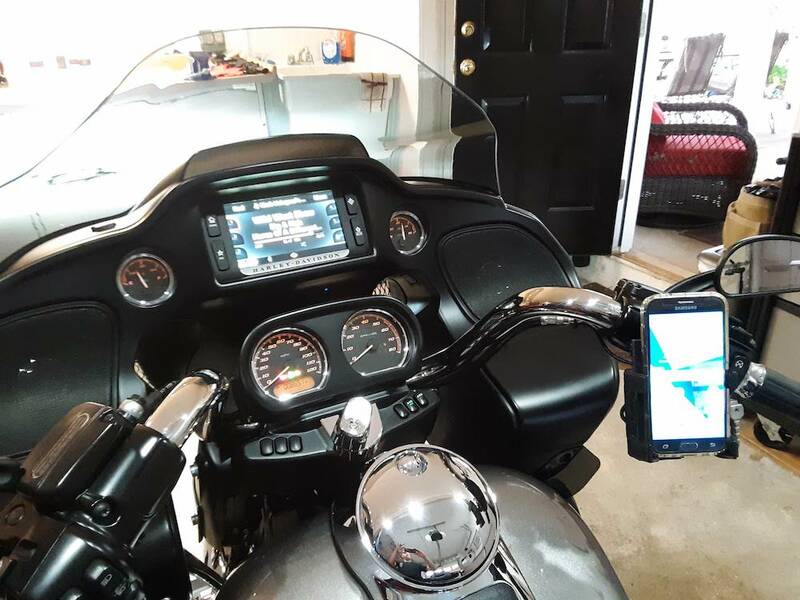 Note: I use my smart phone for navigation because the Harley-Davidson system is awful, but you need to have constant power to the phone when running Waze or GoogleMaps otherwise your battery will go dead in a couple of hours. This is not about keeping up on Facebook, Messenger or other phone apps. While I was working on the Harley Debbie headed off to see her hair stylist, Tracey. Tracey always does a great job on Debbie’s hair and is able to get the color and cut just right, while using products that seem to make her hair more healthy than it was when she used other salons and stylists. And, Tracey is also a friend from Loco Willy’s, so there’s that! She’s a talker and a tequila-enthusiast… What’s not to like about Tracey. As mentioned, we discovered via Facebook updates that a couple from New Jersey whom we met pursuing our interests in both road and off-road tandem cycling many years back were camping at Red Top Mountain a mere 11 miles from our home. They were in route to Ocala, Florida, for an off-road tandem cycling gathering. The last time we visited with Brenda and Larry was in October 2010 at Asheville, North Carolina, for our friend Alex Nutt’s inaugural Appalachian Off-Road Tandem Adventure (aka, A.O.R.T.A.). In fact, there’s a video out there somewhere shot by Larry as they followed us along a section of single track during A.O.R.T.A.. We’ve also ridden with Brenda & Larry at a couple of road tandem rallies; just a wonderful couple who we haven’t seen in a while given we’ve not been doing any off-road tandem cycling and haven’t attended any of the Eastern Tandem Rally events in many years. Anyway, they accepted our invitation to join us for dinner at Guston’s Grille in Acworth, which was about a 15-minute drive from their campsite. We knew Guston’s would be a good place to meet as the four-top tables make for great conversation and if we picked the right table we’d have Justin as our server: the food is always good as well. 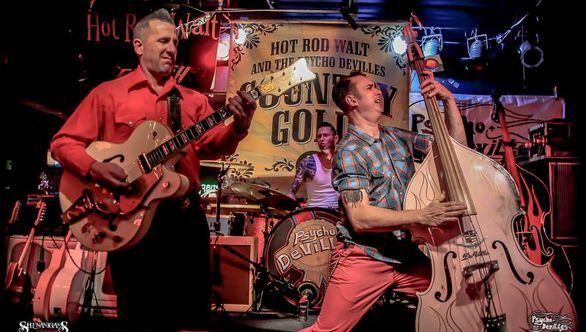 The bonus for being a Wednesday night was having live music, courtesy of Hot Rod Walt, a local icon who front’s his own Rock-a-Billy band, “Hot Rod Walt & the Psycho DeVilles” who, interestingly enough, is a New Jersey native. It was just Walt going it alone on his guitar but he was joined a bit later by a friend and professional musician who was in the audience and they put on an amazing show. It suffices to say, I think we all had a grand time catching up and just shooting the breeze and then settled-in to enjoy Walt. Three hours somehow vanished as Debbie and Brenda were having their own deep conversation while Larry I did the same. We’d all come up for air now and again and acknowledge the other pair and, well, I think everyone enjoyed their dinner as well. Just a grand night for us, to be sure… and I think Brenda and Larry enjoyed it as well. As Brenda said, let’s not wait another 10 years to do this again!! Back at home, I sat down and posted a synopsis of my wireless charger installation to Facebook that I’ve already plagiarized for this blog. It was around 11:30pm when I headed to bed, where I found Debbie dozing on the couch in the sitting room of our bedroom watching one of her favorites, Murder She Wrote. That was pretty much it for a productive and fun day. Life is good! Thursday: Just a Day In The Life…. I’m like way behind on these updates so I’m going to have to rely on my sometimes spotty memory, but I’m pretty darn sure the weather was cold and wet. I’m also pretty sure we didn’t do anything highly significant or epic today which is a little sad but also our lot in life: we’re not movers and shakers in the big scheme of things. We’re just little cogs in the machine and that’s OK. 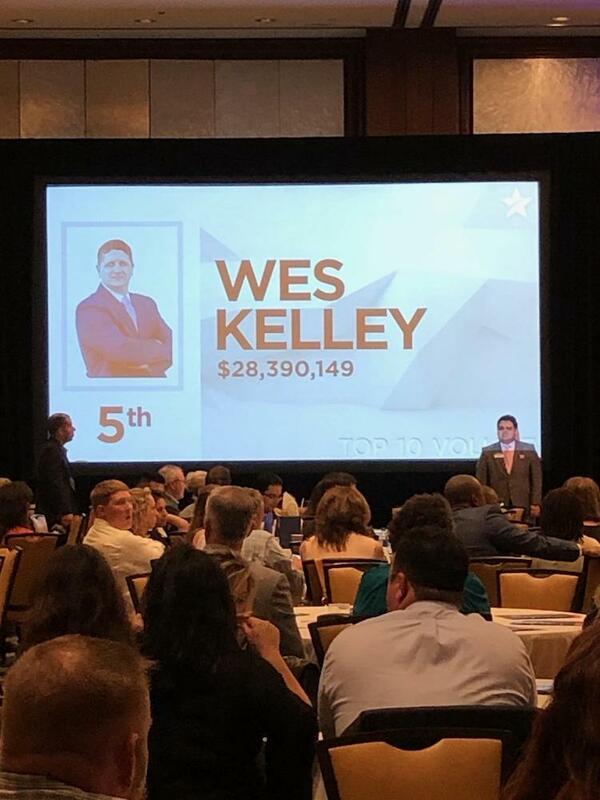 Speaking of little cogs, Debbie got to go and spend a little time with Miss Scarlett this morning so Julie could go to the salon and get ready for an awards banquet for top performers at Wesley’s firm: yes, he’s one of those top producers having closed $28M worth of mortgage loans in 2018. Tonneau Cover: Hearing from a potential buyer for the Tacoma’s no longer needed tonneau cover who saw my for sale ad out on Craigslist. If all goes as planned, she’ll be making the two-hour long, 117-mile drive down from Hiawassee, GA, on Saturday to look at and most likely buy the cover. This is great news as I’d really like this Albatross out of the garage and, well, every dollar I gain selling bits that came off the Tacoma lower my net expense for the money I’ve put into it. 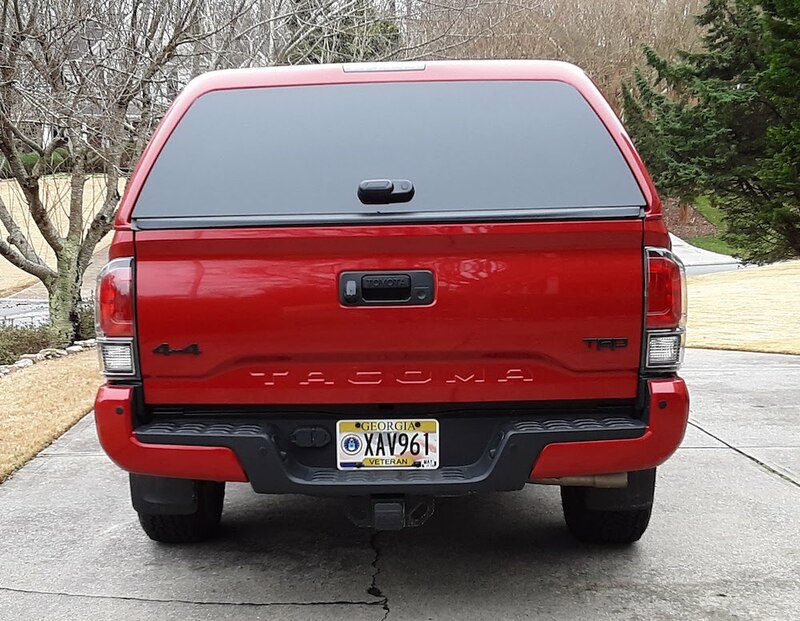 Head & Tail Lights: In keeping with my drive to eliminate stuff from the house, having spent a little time living with the new, blacked-out head and taillights on the Tacoma, I’ve decided I have no need for the ones they replaced so I listed those on ebay today. 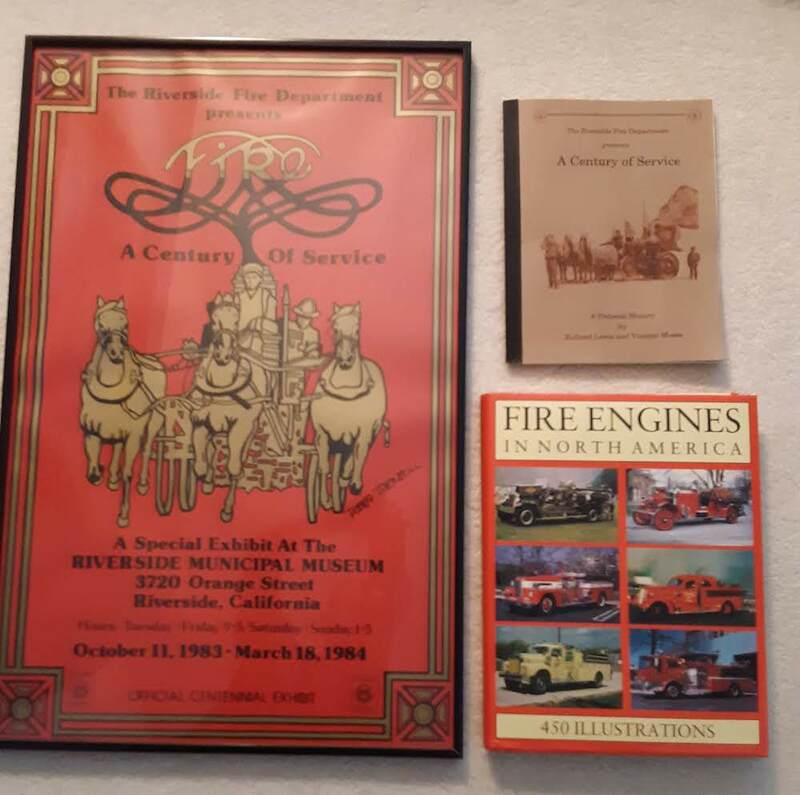 Other ebay Auctions: Speaking of ebay, while a few things have sold well, others not at all and with just one deadbeat buyer, the most interesting auction has been the Riverside Fire Department memorabilia. The only real interest I’ve had was from someone who appears to be in the fire department memorabilia business who low-balled my already very low initial bid price. Perhaps he knows the values better than I do, but my guess is as someone in the business he just looks for bargains he knows he can flip for profit. I guess there’s a lot of money being made buying and selling “hidden treasures” for those who are willing to get into that business. I’ll let the Riverside Fire Dept. stuff sit out there for another week, after that I’ll just send it to the Fire Dept. and let them do with it what they want. I’m sure there’s a young fire fighter out there who wasn’t even born when they celebrated the Centennial who would like to have it. Blogging About the Wireless Charger: Being housebound by the weather I went ahead and created a blog entry where I described how and why I fabricated a wireless charger for the Harley-Davidson; on-line readers can find it HERE. 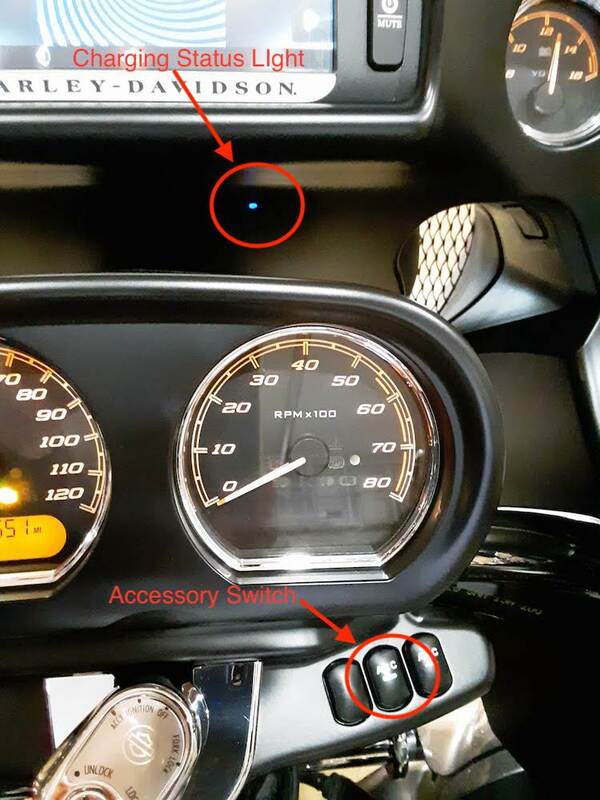 Blogging About the Cruise Switch Anomaly: I also tapped-out a blog entry on the unusual behavior I observed on our Harley whereby touching the cruise control toggle switch causes a change in what’s being shown on the 6.5″ LCD display when music is being played from an ipod or other external source. These Harley posts seem to get some of the heaviest traffic of all the things I’ve ever written, so hopefully they are proving to be of use; on-line readers can find it HERE. Exercising Again: Even though I wasn’t able to get out and ride the bike, I did bring myself to doing a little indoor exercise. I don’t know why I struggle to incorporate this into my daily routine. 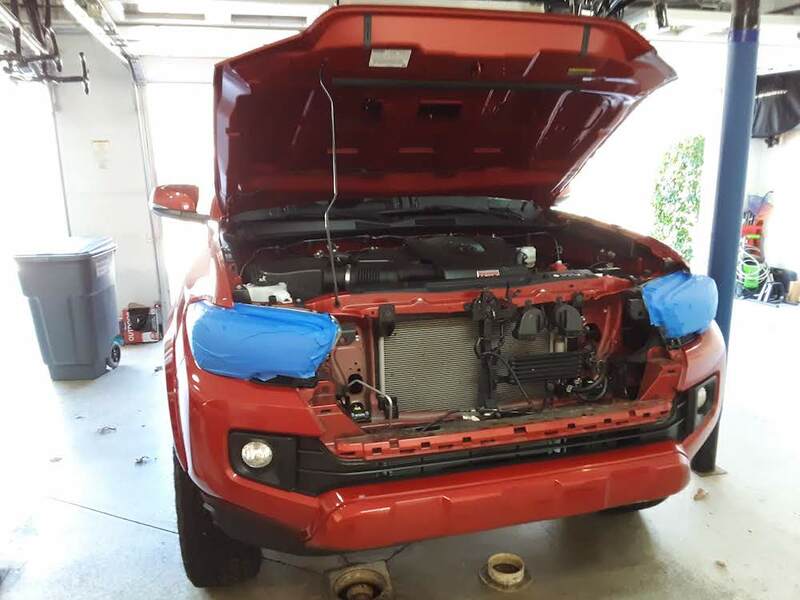 Cleaning-Up the Tonneau Cover: With the impending sale of the Tacoma’s tonneau cover, I realized I should probably take a little time to clean it up so it would be ready for inspection on Saturday. It’s been folded-up and sitting propped-up in the garage since early January and was likely in need of some attention, if only to clean off the cobwebs. Sure enough, more damp weather, but at least it’s warmed-up a bit. Still playing catch up on the blog so this will also be something of a laundry list of activities from the day. Birds & Porch Lights: I’ve got an ongoing feud with a pair of house finches who are attempting to build a nest in our front porch light. I’ve had to blow-out their nest-building materials several times a day and have even taken to putting small, decorative Easter eggs in the light to see if that will keep them from nesting in the bowl-shaped fixture. Removing Scratches from Interior Door Trim: So, yes… I always find time for a little truck stuff. Today I decided to risk doing permanent damage to the black plastic interior door cover in an effort to remove a few scuffs and scratches added by the previous owner. There’s a trick that involves using a heat gun to encourage those small abrasions in the plastic to self-heal, but it comes at the risk of creating high-gloss splotches where ever you’ve applied the heat. My strategy today was to essentially heal the scratches and then blend the discoloration by simply “painting” the door with my heat gun so it would have a uniform sheen. Amazingly, it worked. Yes, the driver’s door now has a bit of a sheen that’s not present on the other doors, but I’m probably the only one who’ll notice. And, I’ve got some ideas about how I can either knock down that sheen or use car care products on the rest of the interior trim to even-out the sheen. Ah, there’s always something. Let There Be Light: If there’s one thing you can’t have too much of in a garage it’s artificial light. As mentioned in last week’s blog, I repurposed an overhead fluorescent work light by moving it to my workbench which worked out really well. When I was working on the truck today I noticed one of the overhead soft white light bulbs had burned-out so I replace the incandescent bulb and it’s twin with a pair of 75 watt LCD ‘Daylight’ floodlights with great effect. In fact, there are only four floodlights out of 11 in the garage that are still soft white and they probably won’t survive the weekend. A Little Lite Housekeeping: While Debbie still takes on the honest-to-goodness house cleaning, I tend to dabble in it when I see something in need of cleaning. Today I did a lot of that: must be a spring thing. Dinner at Guston’s Grille: Given Loco’s would likely be crowded since the outside bar and seating area is still effectively unusable we headed to our newest, favorite place for dinner: Guston’s Grille & Tap a mere 2.2 miles from the house. We arrived a bit earlier than usual around 5:30pm and found a couple of seats at the bar. We’d hoped we’d find our neighbors, Dave & Trudy, but no such luck. However, our friends David & Deb would be joining us around 6:30pm, so no worries. We struck up conversations with the folks sitting next to us and had a great time, right up and until we needed to go and secure a four-top table in our favorite server, Justin’s, section. A short time later David & Deb arrived and good times ensued. Dave & Trudy came in a bit later as well. Again, just a good night visiting with friends and being a Friday, the live music began around 8:30pm. We outlasted David & Deb as well as Dave & Trudy listening to the different musicians who cycled through and even got in a little dancing. OMG, it’s nice out today! Heck, I may even be able to get in a bicycle ride!! Of course, the birds were still at it. Putting the easter eggs in the front porch light worked well; however, those pesky finches just moved around the corner and are now trying to occupy the lights under the ceiling fans on the breezeway and veranda. So, the nest removals continue as I contemplate what I will need to put in these lights to keep them from nesting. After a late night out last night I will note I actually slept-in a bit. But, around 7:30am I knew there was no hope in getting any more sleep so I quietly headed down to do my usual morning routine. With the yard finally being somewhat dry I was able to get out and pick up all of the small tree twigs and branches that littered the landscape after some of our stronger storms of the past few days. I’ve got a Japanese Cherry tree in the process of dying and that’s been shedding some big twigs. In fact, I probably need to get after it with the chain saw and trim away all of the dead branches before it begins to sprout leaves. I’ve got some Juniper’s that grew about 40 times larger than I ever expected down at the end of the driveway that also need to go. In fact, I probably need to borrow my friend David’s trailer so I can cut down and haul away the debris here in the not too distant future. It was right around 12:45pm when the gal from Hiawassee arrived to look at the tonneau cover. She came in her 2016 Tacoma long bed truck so this was definitely looking like it was going to happen. She gave the top a look-see and I pointed out the wear and tear with didn’t faze her in the least. She’d done her homework and knew that new tops like this were selling for $750 – $800, so $375 would be a great deal for her, a good deal for me and best of all… the top would be out of my garage! I went ahead and showed her how it fit by essentially installing it for her and I think she appreciated that. A real win-win! It was about this same time Debbie headed off to pick-up our granddaughter, Caroline, and take her to the YMCA’s regional Swim Meet, noting the kids were away for the weekend at Wesley’s awards banquet. So, Julie’s parents, Patrick and Belva, had the duty at the house watching all of the girls, with Debbie dropping in to cover as needed and in this case, making sure Caroline got to her swim meet… which Debbie enjoys doing. While she was off with Caroline I did a little more yard work and headed over to Home Depot to pick up some additional LCD light bulbs for the garage as well as the kitchen. Again, I was so impressed by the quality and price of the LCD lights I’d put in the garage on Friday that I wanted to go all “Daylight” lighting with the same type and wattage of LCD lights in the garage. But, I also knew Debbie was never happy with the level of light we had in the kitchen so I decided I’d swap out the older halogen spot lights for 75 watt LCD spot lights while she was out. If suffices to say, she was really happy with the new lighting in the kitchen. In fact, this is the first time I’ve actually needed to use the dimmer switch on the kitchen lighting! 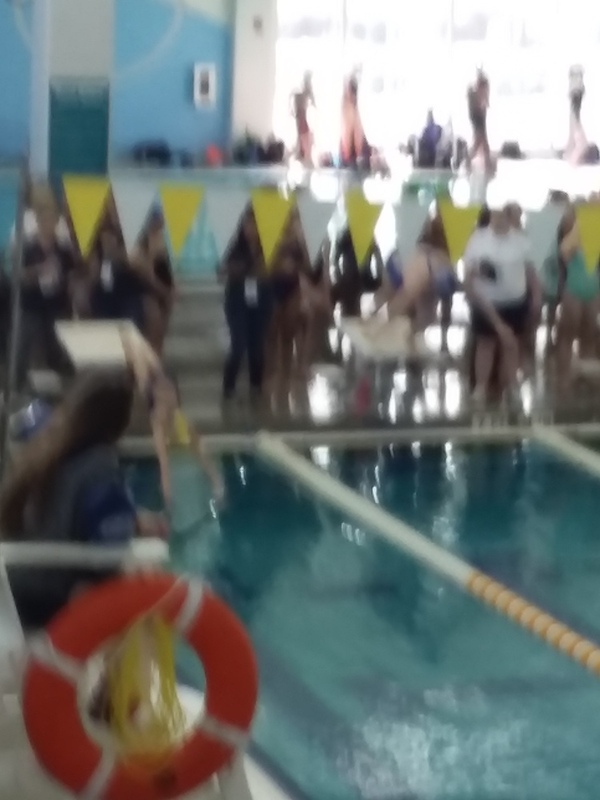 Oh, and Caroline did very well in her two events at the regional swim meet: she placed 3rd in one of her events and 5th in the 100M freestyle, but beat her personal best time in that event by 9 seconds! Debbie also received some photos from the awards presentation and dinner event later that evening; so very proud of Wesley for so many things. We tried to stir-up some company for dinner via a posting to our group of motorcycling friends on Facebook, but came up empty. No worries, we decided we’d give Loco Willy’s a try as Saturday evenings in the winter aren’t usually all that busy and, by golly, we were craving their food. We arrived around 7:00pm, found some seats at the bar (yeah!) and ordered the pork ribs with kobi-kai (sp) sauce and side orders of jalapeño cole slaw, french fries and onion strings. Oh, it was soooo good! We didn’t stay long as it was still cold in the bar with the A/C set around 68°F. In fact, we warmed up when we went outside; come on guys. Back at the house we settled-in for the movie Han Solo on Netflix. We’re still feeling our way around with Netflix, but believe it’s a keeper. The Star Wars spin-off of Han Solo… meh. For a Ron Howard directly movie it was a bit weak so I’m not sure if the script was just bad or that just about every Star Wars movie seems a bit too familiar with strange alien creatures that simply don’t make sense: weird and unusual for the sake of being weird and unusual. Weather wise, we had a cloudy morning before the rain and thunderstorms came in just after noon time, about 2 hours ahead of the forecaster’s predictions. The last thing we need around here is more rain, but we got it. Thankfully, we live on high ground and there aren’t any roads we use on a regular basis subject to flooding. That’s not necessarily true for a lot of other folks. Anyway, my battle with the birds continued today and I finally just resorted to putting pieces of left-over metal over the light bowls. So, with any luck, the finches have been forced to move on as they do need to get a nest built… just not in my lights. Of course, as I say this, I’m hearing some noises coming from the steel cap on our chimney suggests a bird may be building a nest up there. So, I guess I’ll have to fire up the gas logs and send up some hot air to chase them away, lest we end up with hard-boiled finch eggs. 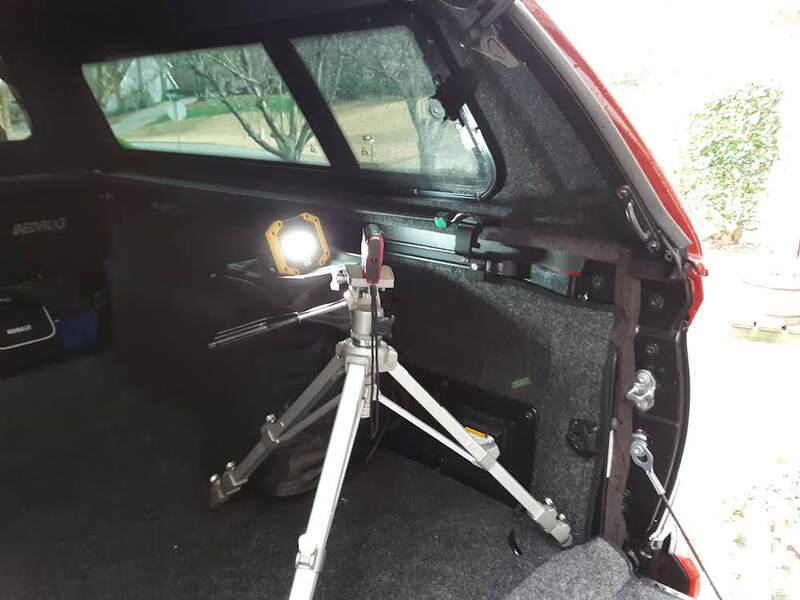 Modifying the Exterior Lighting: This was a 3,400 word write-up on the changes I made to the head, tail, fog and mirror light housings and upgrading the H11 halogen low beam & fog light bulbs to better quality bulbs; on-line readers can find it HERE. 1st Impressions of the A.R.E. Z-Series Shell: This was a more reasonable 2,100 word update on what I think of the A.R.E. 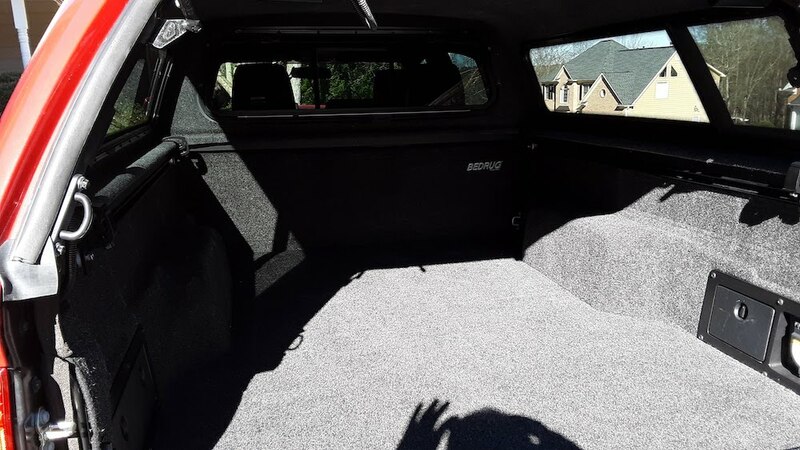 shell I installed on the Tacoma’s cargo bed after nearly two months of ownership, to include the quality of the product, features and of course the all-important ability to keep what’s inside the shell dry; on-line readers can find it HERE. In short, I will say I’m very pleased with the shell. I’ve got a little bit of water getting into the right rear corner of the bed, but it may not be an issue with the shell as much as it is the truck bed. So I’ll be investigating that this week. It was around 2:00pm when our friends Ryan & Jeanette and Jeff & Sharon put out the word they’d be heading over to our friends Randy & Liz’s new establishment in Mableton, Georgia, the “Full Throttle Roadhouse” bar and grill. At 20 miles away and 35 minutes driving time it’s not exactly close by, but Randy & Liz are long-time friends via our interests in motorcycling and they were celebrating Randy’s birthday (which is actually tomorrow), along with Mardi Gras and, well, just because. In addition to running restaurants and bars, Randy has been publishing Southland’s Full Throttle magazine for as long as I can remember, it’s a “what’s happening” free monthly publication that provides a calendar of upcoming motorcycling events and charity rides as well as write-ups on past events and the like. 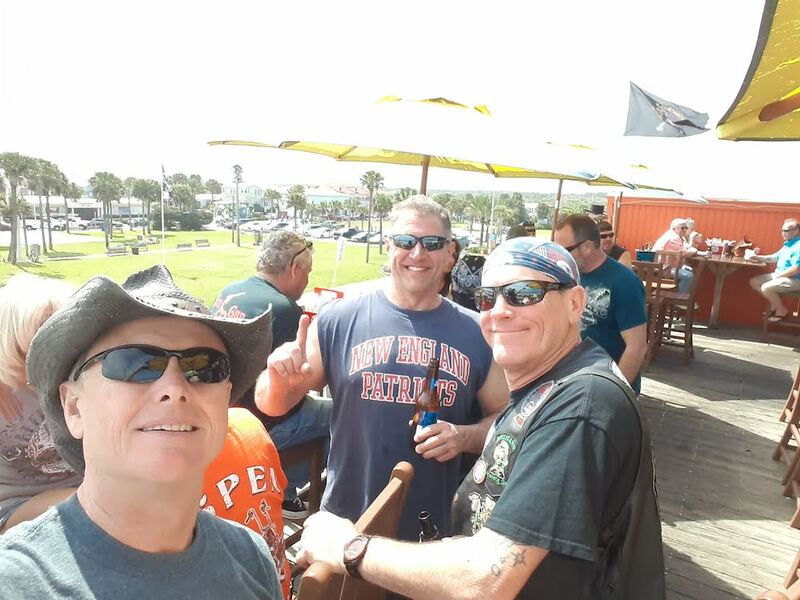 And, if that weren’t enough, Randy also operates a venue called “Lucky 13” during the spring and fall bike week’s down in Panama City Beach with live music from noon until 2am each day, several bars and vendors. Anyway, as we said, he and Liz just opened this new bar in early December and we’ve been meaning to pay a visit so today just worked out really well. 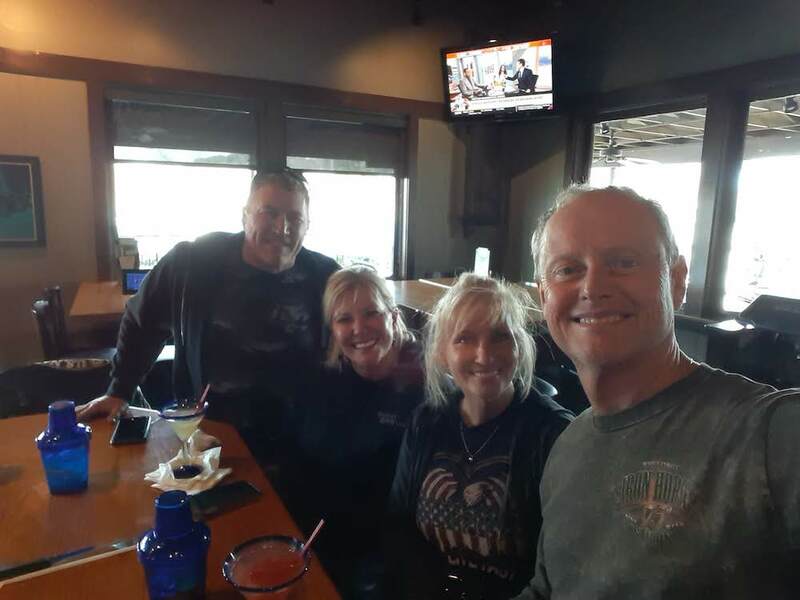 We had a great time catching up with our friends, noting Jeff & Sharon just returned from a 2 month-long RV trip in South Florida and Ryan & Jeanette have been busier than one-armed paper hangers. The Roadhouse was really a great little bar with great eats, a wonderful staff and nice feel. Much more neat and tidy than you’re typical biker bar, that’s for certain. Sadly, all of these places allow smoking so that’s always a bit of a challenge for us as my respiratory system and cigarette smoke don’t play well together. Anyway, as I said, a great time. I think it was around 5:30pm when we finally headed towards home. 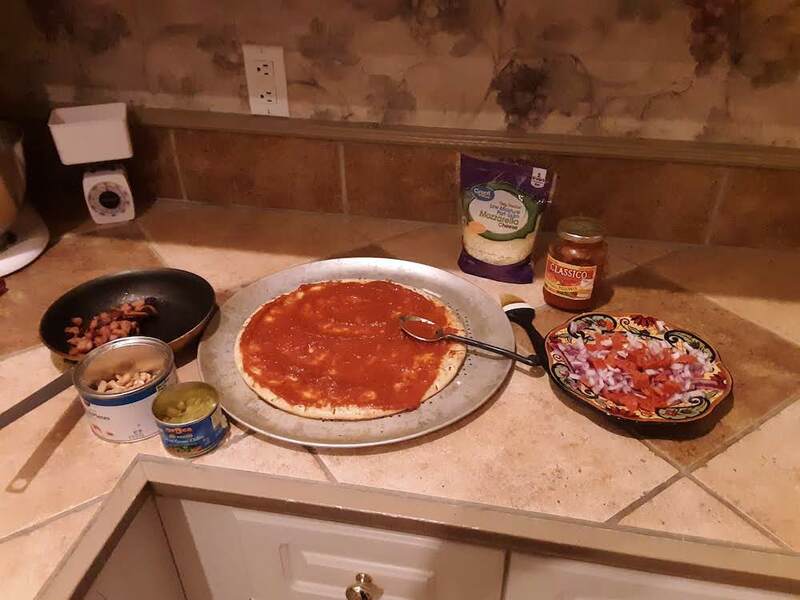 Back at the house, I ditched my smokey clothes, took a shower and then headed to the kitchen to make one of my Ort’s Special with Cashews pizza for dinner. It would normally be a wing night, but since we bought an extra Boboli pizza crust a couple of weeks back and it was up against its ‘use before date’ it gave us an excuse to bake up a pizza for dinner. I actually enjoy making “fun food” in the kitchen far more so than a real meal. So, making pizza, hot wings, Chicago dogs and brats, etc., is always right up my alley. 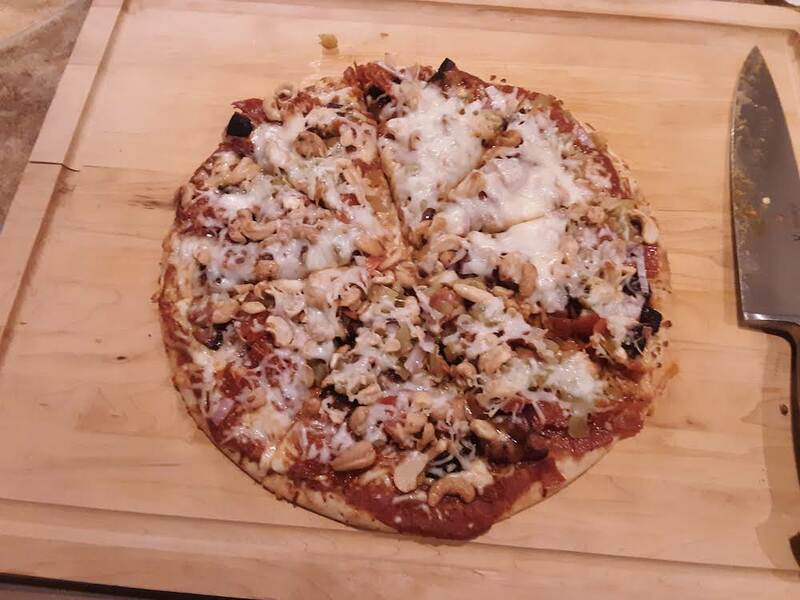 I think I got this week’s pizza about right in terms of having just the right amount of toppings & cheese and cooked it just long enough to crisp up the crust and cook it through without burning the crust or toppings; there’s a fine line there. About my only regret is getting into the habit of using store-bought pizza sauce; I need to stop that and just make our own. The store-bought stuff is always too sweet or salty. Anyway, I think Debbie enjoyed her pizza and when she’s happy, I’m happy. That was about it for the week. 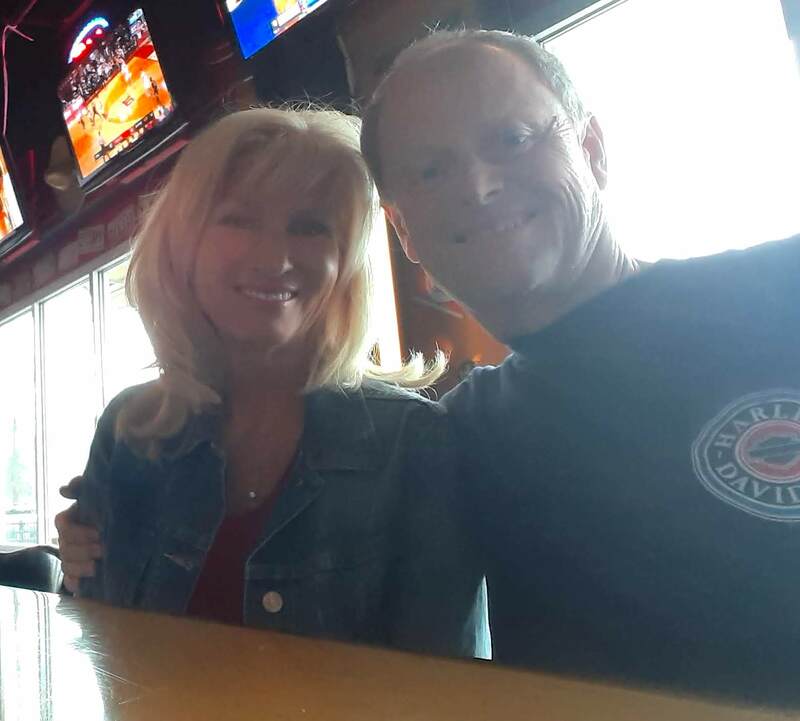 We’ve got 10 more wake-ups until we head to Daytona for Bike Week on 13 March with our friends Chuck & Julie. So, this week I’ll need to shift gears a bit and give the Harley a little attention since I’ll need to install the trailer hitch and get the trailer out of the shed and ready to go. This is our second A.R.E. Z-Series pick-up bed topper / shell and we purchased both from Custom Campers in Lake City, Georgia. 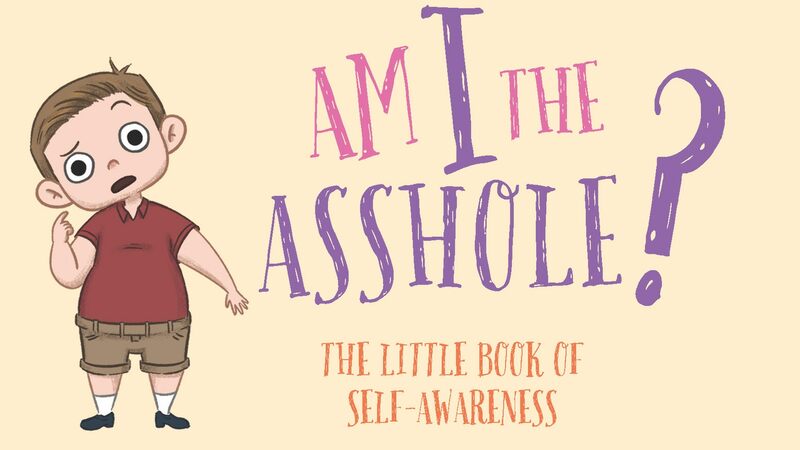 I thought I’d do a follow-up to the “installation” blog entry I wrote back in early January you can find HERE to comment on what I think of it after nearly two months of ownership. I will say, the high quality of the basic design & construction has remained consistent from when we bought our 1st A.R.E. Z-Series shell 12 years ago in November 2006 for our 2006 Toyota Tundra. And, quite frankly, it was the solid construction and design features that sold me on A.R.E. the first time and brought me back again for the Tacoma’s shell. There are some new features related to lighting and how the wiring is integrated to the shell that are very nice but the keyless entry remains my favorite feature. While detailing the truck under fluorescent lights in the garage at night my smart phone’s camera makes it easy to see the color variation between the shell in back and the cab up front. 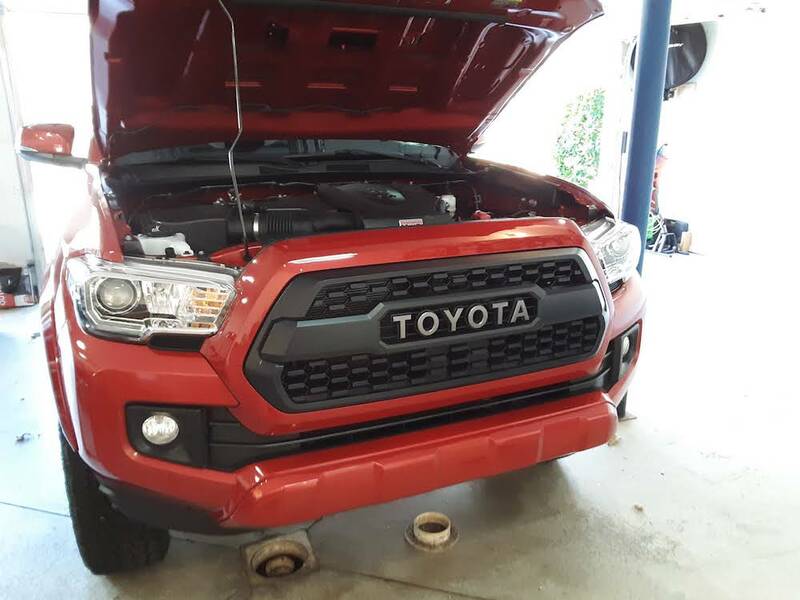 Paint: They definitely got the right color, but it would appear they opted to use the formulation Toyota uses on plastic parts like the Tacoma’s grill surround. 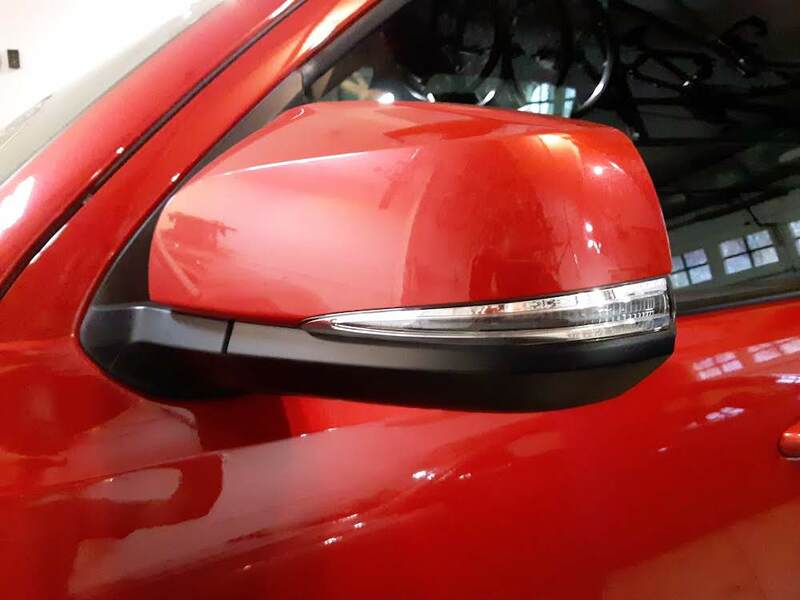 On red-colored vehicles, this particular formulation just looks a bit darker in low light conditions or under certain types of artificial lighting but is fine in bright sunlight. 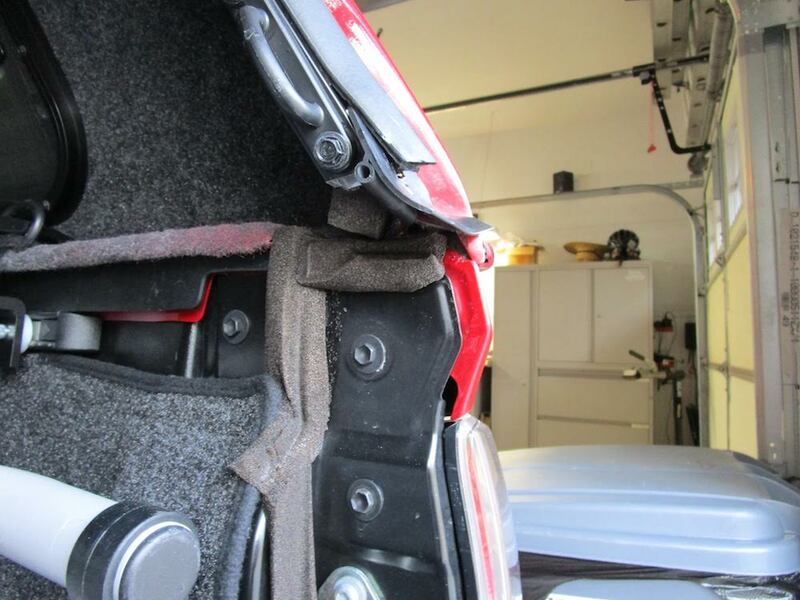 Our Formula Red 2004 Honda S2000 had the same color differences on the front & rear bumper covers. So, at times I’ll look at the truck and think to myself, “that’s the wrong color” even though I know it’s not as it’s a perfect color match on our Barcelona Red Tacoma to the front grille surround. Handling: For some reason, both of these shells have been delivered with several light scratches and nicks in the paint. I’m not sure if it’s because they’re hauled unprotected on a flatbed or what. On our black Tundra’s shell touching up was a no brainer. 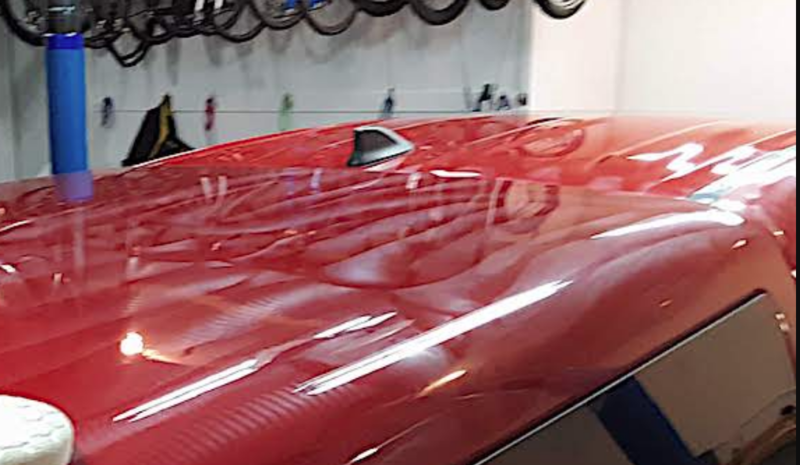 But, with the Barcelona Red color — noting they give you a small bottle with the actual paint used on the shell — the touch-up never quite matches even with the clear coat. But, that said most of the scratches buff out and I know I’ll add nicks and scratches to the shell so it is what it is and I’m the guy who bought a red truck knowing this about color matching. Water Intrusion: I’m not sure why, but A.R.E. shells seem to have more reports of water intrusion than most others. Mind you, the Tacoma’s bed design around the header & front rail are awful, so I chose to deal with this myself just to be sure it wouldn’t be a source for water intrusion and I’m confident that’s water-tight. So far, the seal between the shell and the bed rails also seems to be water tight. 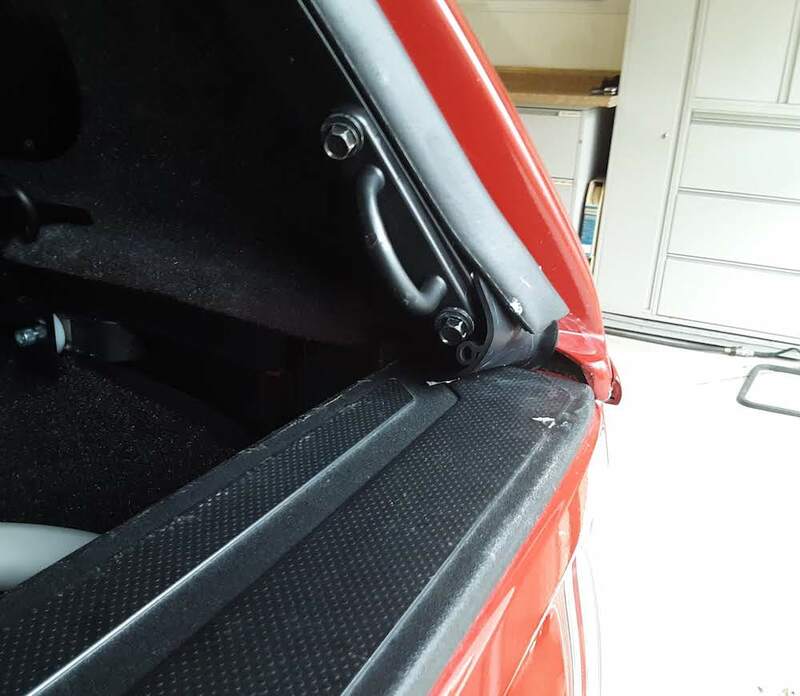 Back Door Seals: Reading through A.R.E.’s customer reviews there is a constant complaint regarding large gaps left at the rear corners of the shell where it meets the tailgate top rails and the shell’s door moulding and flap. These gaps are a ready entry point for water, snow and dust on just about every model of truck with an A.R.E. shell, not just the Z-Series… if only based on customer reviews and our shell also exhibit’s this condition. On the 2006 Tundra, it was easily addressed with foam weather stripping; however, it will require a bit more farm boy engineering to address on the Tacoma. This explains why a lot of Tacoma owners with these Z-Series shells are experiencing water intrusion in the back corners of their bed. The Beaver Tail: It appears that A.R.E. 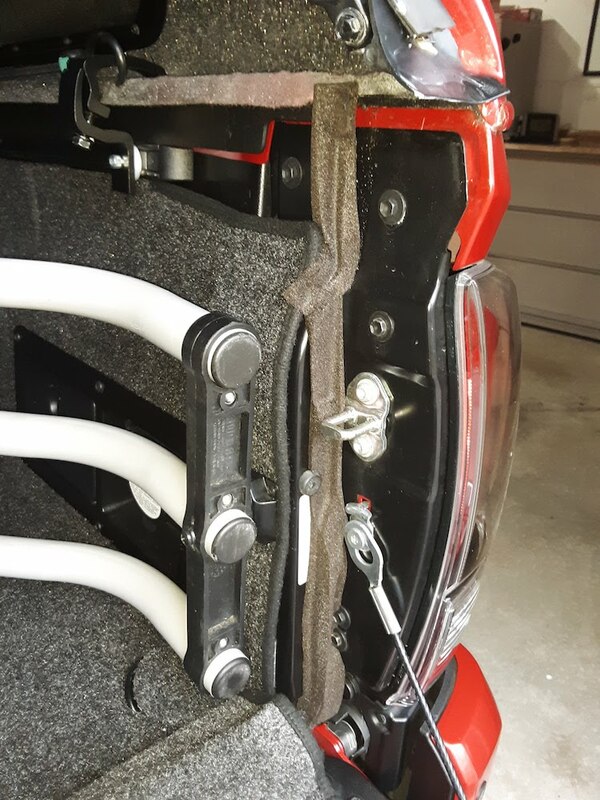 saw this problem with the funky tailgate design on the Tacoma (and perhaps other trucks with similar wide tailgate top rails) and developed a partial solution using a pair of rubber ‘beaver tail” flaps pressed in under the lower back corners of the shell’s door frame. 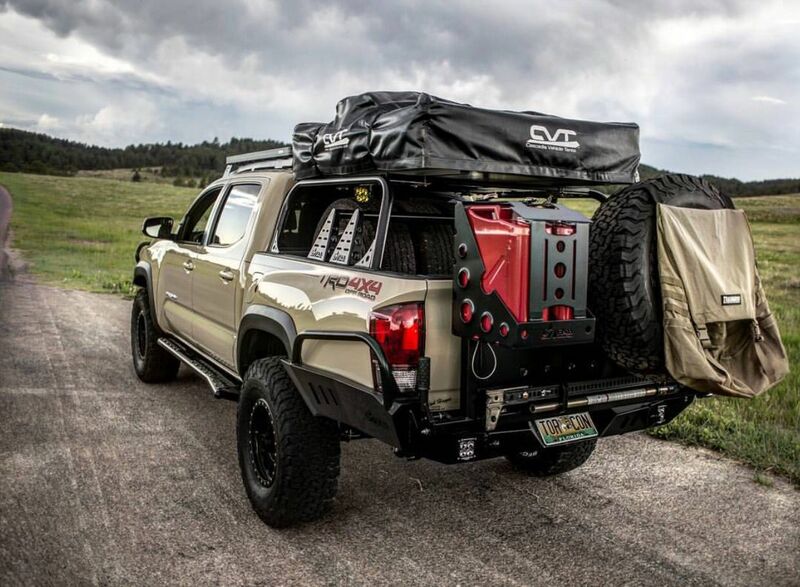 At first I though they were intended to extend out and over the tailgate’s top rail cover to direct water flowing off the shell and down the frameless door’s window channel over and past the rear corner of the shell and gaps in the tailgate. However, after shooting some video from inside the shell and flowing water off the shell and down the rear door with a hose to simulate rain, it appears the beaver tail is intended to be folded-in as that’s how it works best. However, even when folded into the gate I was still seeing water coming down the square aluminum tubing that makes up the internal frame of the rear door opening. I sent a note to my selling dealer describing the issue and with a link to the video and got a great response: No worries I know what I have to do.. call me Monday and we will schedule a time for me to fix it at no charge. So, more to follow. 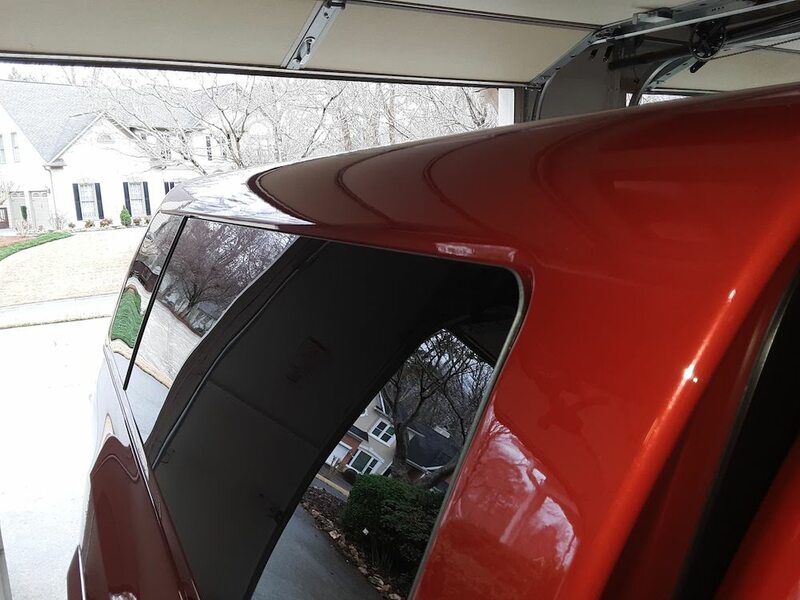 Toyota’s Gaps & Cracks: Below the shell is another problem when it comes to water intrusion: all of the gaps around the bed and tailgate that make it anything but a weather-tight seal. 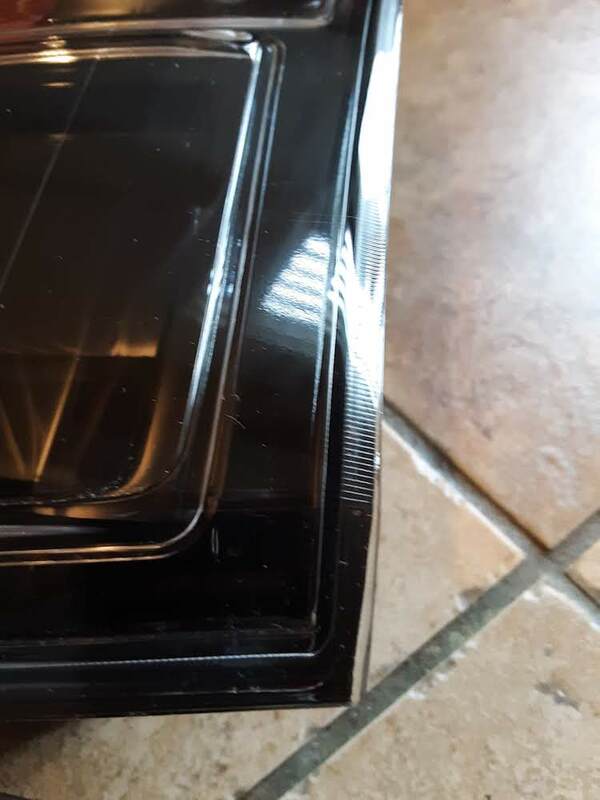 I addressed those when I had the tonneau cover on the truck by using M-D Expand N’ Seal Foam Window Weatherstrip which is a closed-cell, expandable foam product (Lowes and other home stores have it) that conforms to and fills irregular gaps to seal-out moisture and air when it’s tightly compressed. Between the two of those elements — the flap correctly placed outside of the tailgate and the weather-sealed tailgate — it keeps the water out of the back of the bed. Side Window – A Self Inflicted Wound? Despite all of the rain we’d been having, the truck had still not been driven through a heavy rain since the shell was installed back in early January. However, I may have created a problem for myself when I installed some 20% window tint on both side windows back on 19 February. 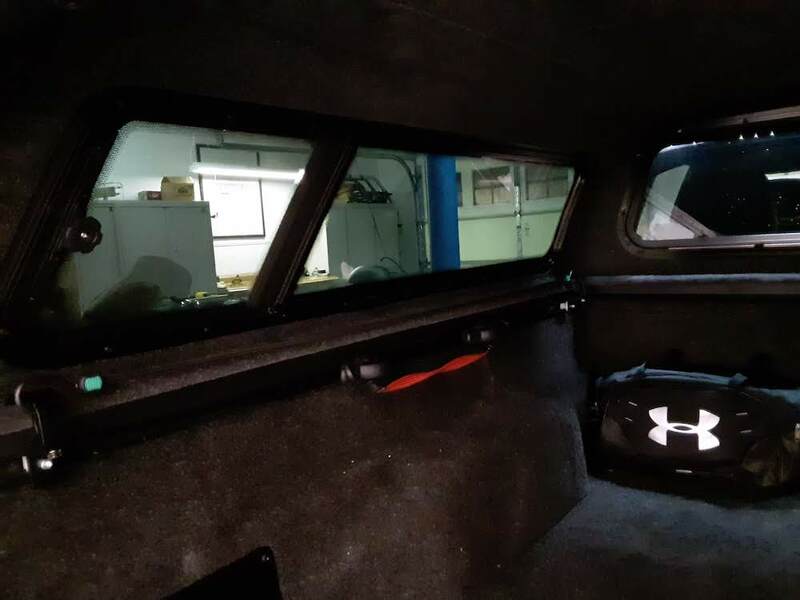 The purpose of the tint was to essentially black-out the shell’s interior so lookie-loos couldn’t easily see what was in the bed, often times high-end bicycles and bicycle tool boxes, etc. In order to apply the tint to the small wing vent windows the screens had to be removed. 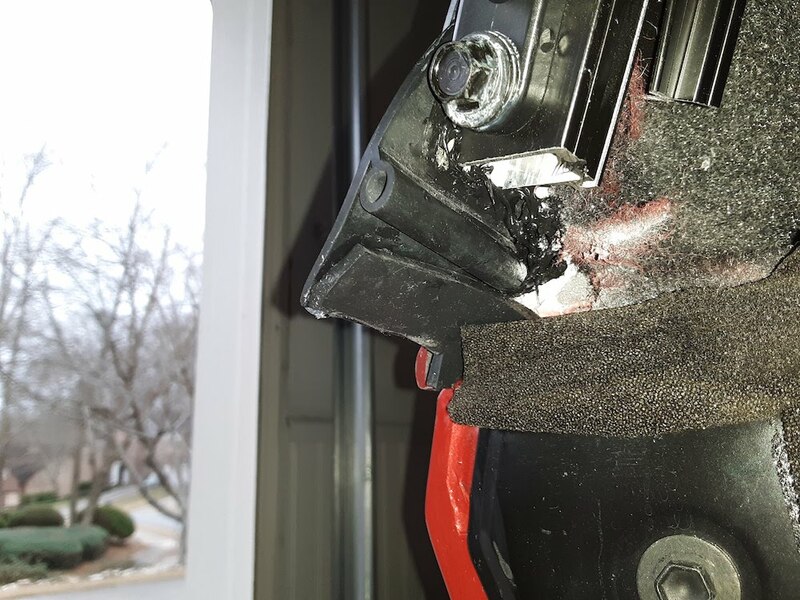 In order to remove the screens, the inside frame that pulls the flush fit side windows against the shell to create a water-tight seal had to be removed. These lightweight aluminum two-piece frames are installed and held together with sheet metal screws which are, quite frankly, a pretty crude fastener. Anyway, despite going back and re-torquing both windows after completing the tint installation and re-installing the interior frame, I discovered the right-side carpeted shelf under the window was wet after a night-long rain storm on 23 February. So, I’m reluctant to say the window was not properly sealed at the factory since I meddled with it. On the bright side, I re-torqued those sheet metal screws a second time and saw enough tightening to suggest I did not have a good seal and this past Sunday after having the truck out in a driving rain the right-side carpeted shelf under the window was dry, so I believe I’m good and won’t have to remove and reseal the window, which was my back-up plan. That’s about it for any negatives regarding the construction and condition as delivered of the A.R.E. Z-Series shell. However, I did end up redoing the wiring installation by Custom Campers. I discussed it at length in yet another blog entry back on 17 January where — to make a long story short — when I went to install a Pop-N-Lock I found the wiring installation to be not tied-in or as tidy as I’d like so I pulled it all out and re-did it myself. And, for anyone who might be having an integrated rear door lock installed on an A.R.E. 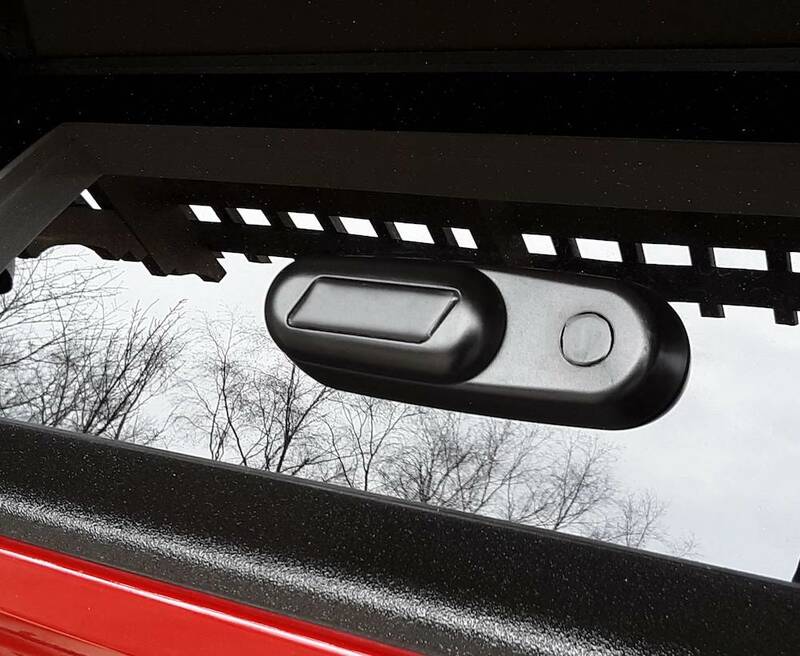 shell, here’s a tip: make sure they tie the rear door lock to the electric lock wiring for the passenger doors — located in the passenger side kick-panel — so the rear door locks don’t cycle every time you unlock the truck. Yes, all of the locks will still cycle when you lock your door, but at least you’ve reduced the total number of times the locks will cycle by 1/2 if they’re tied to the passenger doors. Overall Exterior Style & Fit: I’ve looked at them all and this one has just hit the sweet spot for me. It’s the combination of how it fits on the bed, the frameless flush-fit side windows, the rear wing vent windows and the frameless rear glass door makes it look less like your typical “aftermarket topper” and more like an OEM-designed accessory that truly compliments the vehicle design… making it look more like an SUV than a pick-up truck with a shell. Interior Finish: The grey polypropylene headliner just happens to be a perfect match to the grey polypropylene BedRug in our truck. These faux fabric’s are nearly indestructible and never show signs of aging. 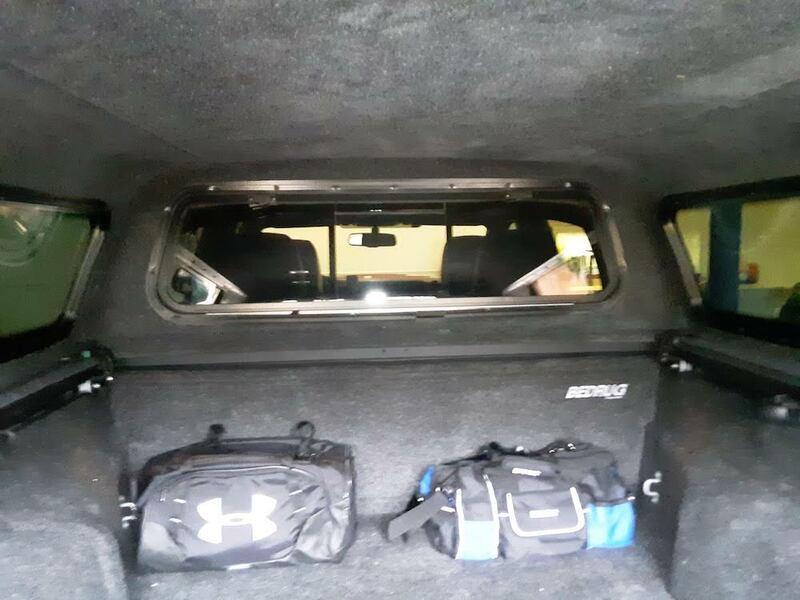 Even though we don’t camp in our shell, it just gives it a very polished look when you open up the back of the truck to put things in the bed. Frameless Glass Door & Side Windows: Again, the flush-fit, frameless rear glass door and side windows set the Z-Series apart from most other shells by giving it an OEM quality. The only thing I’ve ever needed to do to these windows is to add window tint film to further reduce the ability to easily see what’s in the bed of the truck. 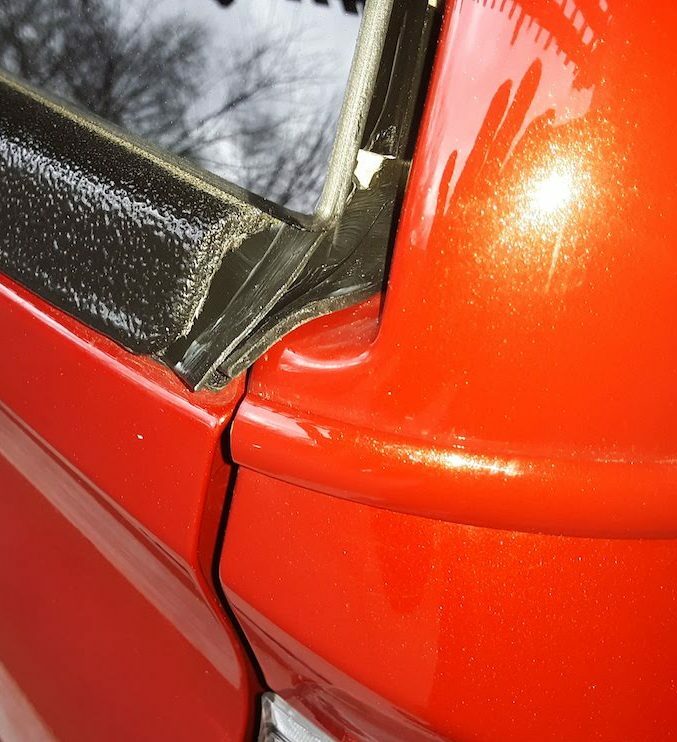 The crank-out rear wing vent is a great feature in that it breaks-up the long piece of side glass with a stylish slash cut while giving you a very secure way of allowing air to flow through the shell without giving potential thieves an easy way into your shell which is often the case with many of the other sliding window designs. Single Latch & Integrated Remote Keyless Lock: One of the biggest selling features for me back when I was shopping for a shell to put on the 2006 Toyota Tundra was the single, center-mounted latch design that secured the rear door at the corners of the shell via cable actuated cam locks. 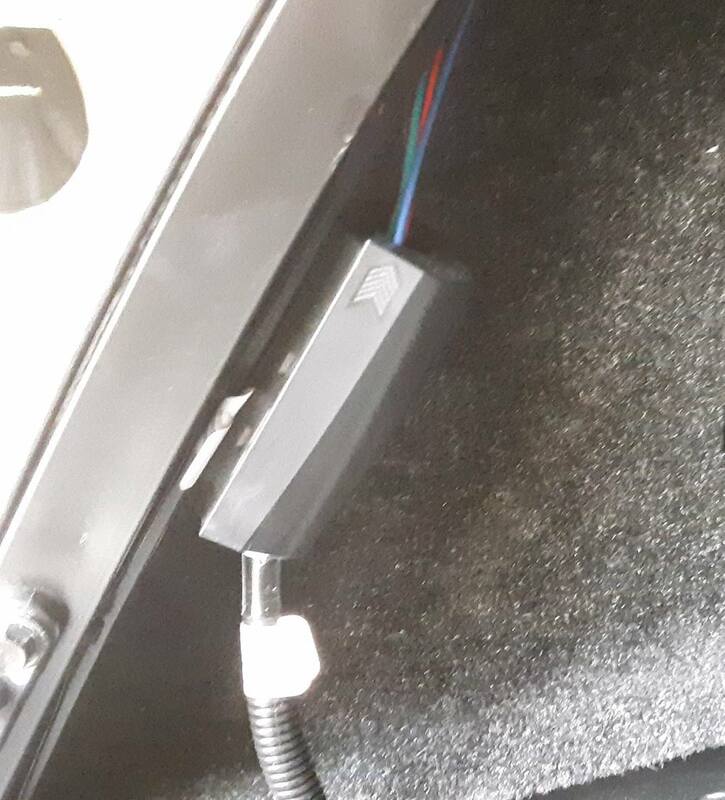 And, when I discovered a solenoid switch could be added such that the rear door lock could be integrated with the rest of the truck’s electric door locks it was a done-deal. That is truly the best feature and, at the time, I believe it was one of if not the only shell with that feature. Others have adopted it since then. 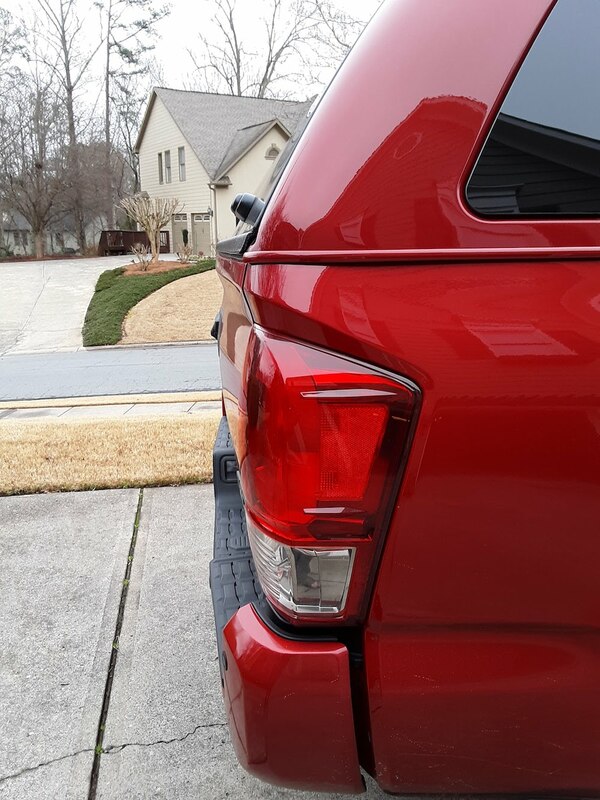 As a bonus, on the 2006 Tundra the overlapping rear door lip was robust enough to keep the tailgate from being opened when the rear door was locked which was especially welcome since it didn’t have a lock of its own. Sadly, the extremely wide top rail on the Tacoma’s tailgate precluded the same bonus locking function but by adding a Pop-N-Lock the rear door and tailgate now lock automatically whenever the truck’s doors are locked, and unlock when the passenger doors are unlocked. Fold Down Front Window: This is another must-have unless someone is using a boot to allow access via the rear window of the truck to the shell. Without this fold-down window keeping the cab’s rear window and the shells’ front window clean would be a near impossible thing to do. As it is now, it takes just the flip of two latches to drop the front window of the shell and you have full access to both pieces of glass. Interior LED Lighting with Prop-Arm Switch: One of the really weak features of the 2006 model-year Z-Series was the rear lighting. Suffices to say, I eventually replaced the battery-operated, switch-activated light with a proper 12v light wired into the truck’s rear bed light so it would go on when a cab door was opened and/or be turned-on with the bed light switch on the dash. They had a 12v light option back in 2006, but it was a hot lead wire powered, switch-activated light you needed to remember to shut off, lest you end up with a dead battery. My 1985 and 1989 Brahma shells had the same set-up. Our new shell has an incredibly bright, 3 LED dome light at the top of the rear door that fully illuminates the bed and can be set to an auto-on mode via a switch mounted to the rear door’s right-hand prop rod. Quick Disconnect for Wiring: This was actually an unexpected surprise when my selling dealer gave me a walk-around of the shell’s features after they finished the installation. Unlike the 2006 model-year Z-Series where the keyless entry wiring, rear brake light wire and dome light wires had individual in-line bullet and plug disconnects, the new one has an electrical interface connector that uses a single quick disconnect plug to separate the all of the wiring at a hub. Now, I never removed the shell from our 2006 Tundra during the entire time we owned the truck, but if someone needed or wanted to remove the Z-Series shell it’s a heck of a lot easier to do now with this very slick power hub. There you have it, my first impressions. I still have yet to take it through a driving rain storm to be certain the shell’s bottom seal is water-tight but believe it will be just based on what I did to prepare the truck for the shell installation by putting silicone sealant under the bed top rails and weather-sealing the front header. Rest assured, if any problems develop they’ll get added here. As I edged ever closer to being “done” with dialing-in the Tacoma, one of the last things I still needed to address as part of my de-chroming process is the exterior lighting. More specifically, making changes to the head, tail, fog and mirror light housings and upgrading the H11 halogen low beam & fog light bulbs to better quality bulbs. The truck ended up with blacked bezel / TRD Pro Original Equipment (OE) replacement headlights from DEPO, a set of black bezel / TRD Pro Original Equipment Manufacturer (OEM) headlights from Toyota and my own black-out treatment to the switchback turn signal lenses in the rear view mirrors. The fog lights, I gave up on an aftermarket solution… at least for now. But, they do have much-improved, yellow H11 halogen bulbs so function was fully-addressed, even if form was not. 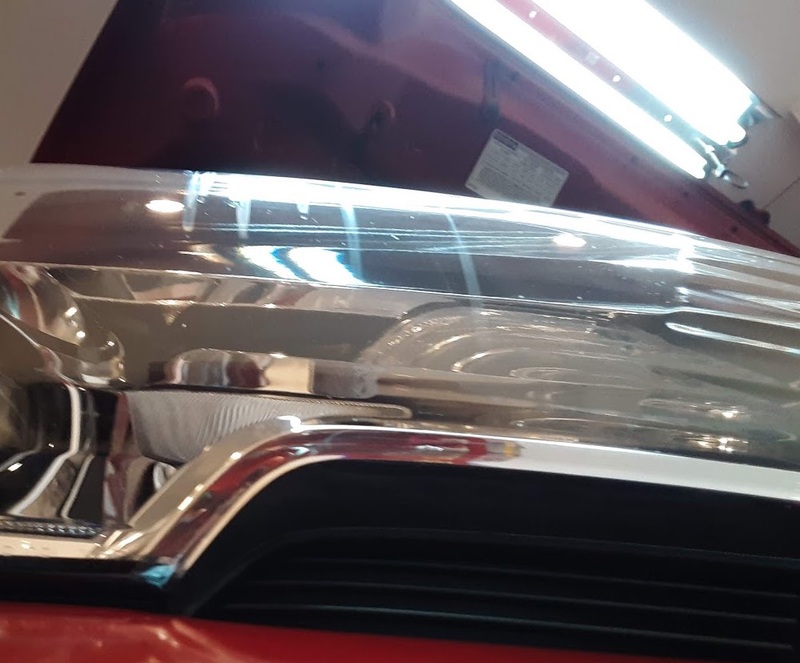 You can modify the original headlights by removing the lens, sealant and paint over the chrome, then re-assemble the lights for a cost of about $50, so long as you don’t damage your lights in the process, which entails the use of an oven: yes, an oven. My original plan was to go with the least expensive modification, also known as the “BLHM” or the Black Headlight Modification.” This entails removing the headlights from the truck, removing all of the exterior hardware and bulbs, and then warming the assemblies in an oven so the sealant used to bond the lens to the bezel will reach a temperature where the bond can be broken. Yes, it’s a bit out there for the average vehicle owner who doesn’t relish the thought of taking apart their new vehicles. But, as regular readers have already observed, I have no qualms about taking apart my truck, motorcycles, bicycles, you name it. 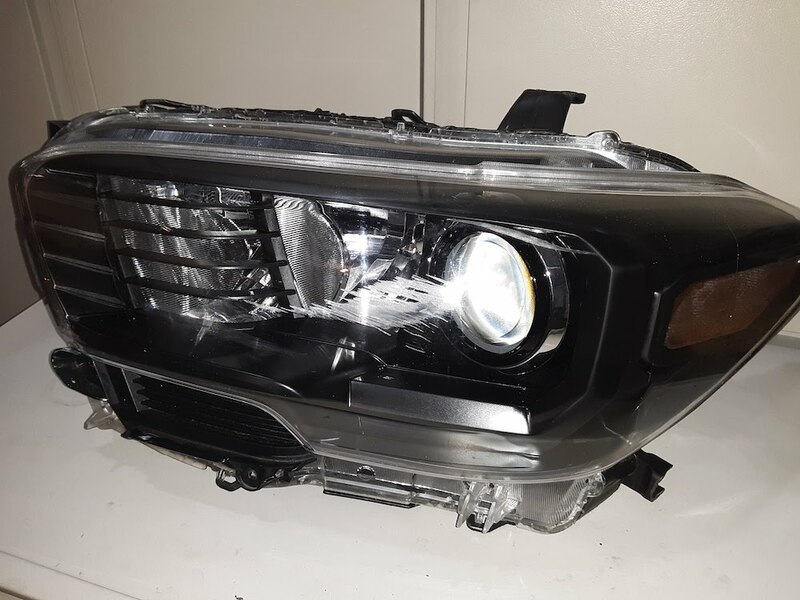 However, given the relatively high replacement cost of these sealed headlight assemblies, I decided to purchase a slightly damaged headlight from a salvage yard for $49.99 that I could use for a trial run of the BLHM process and it went well. 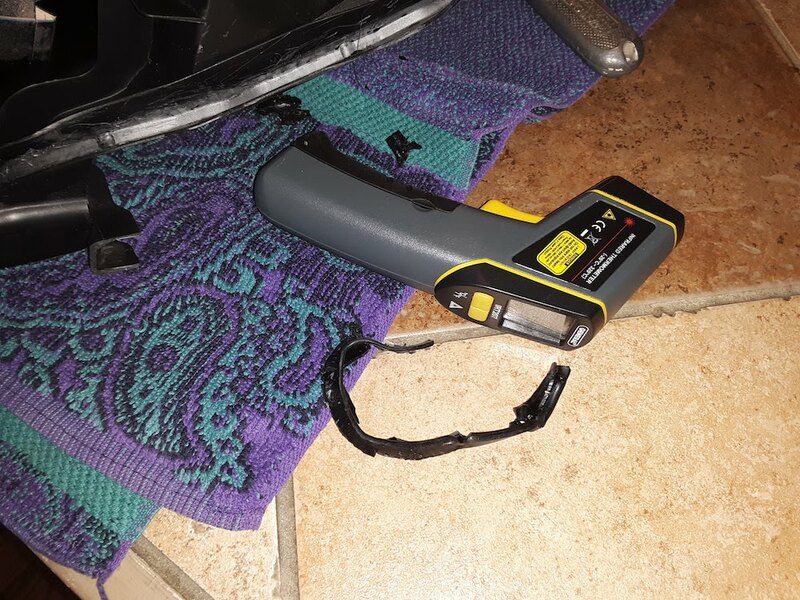 Based on what other’s have suggested, it was 15 min in the oven @ 300°F and then work around the lens to break the seal using a wide-bladed gasket scraper. Back into the oven for 8 minutes, then back at the bead with the gasket scraper and then a panel removal tool. Once I “quickly” had a corner of the lens pulled up and away from the housing I used the panel removal tool plus a firm grip pull to separate the two halves; they came apart quite cleanly. I was actually surprised almost none of the sealant came off on the lens. In fact, I was very surprised to see the sealant still had a glossy bead all around the housing and had simply released vs. becoming a gooey, stringy mess the way butyl or silicone rubber does. The next step is the one that usually makes folks who attempt the BLHM to question their motives: removing the sealant from the channel. I had a couple false starts where I attempted to remove the sealant under less than ideal conditions. However, what I quickly learned was there seems to be a sweet spot in the temperature range where the perma-seal likes to release from the housing and for me it was in the 77°F – 95°F range. Anything below or above that is problematic, i.e., the sealant will not release from the housing and comes apart. In the sweet spot, it comes out cleanly and relatively intact, albeit in segments. Patience is the key. To get and keep the headlight in the sweet spot range I opted to put the headlight housing back in the oven at 250°F for 10 minutes. 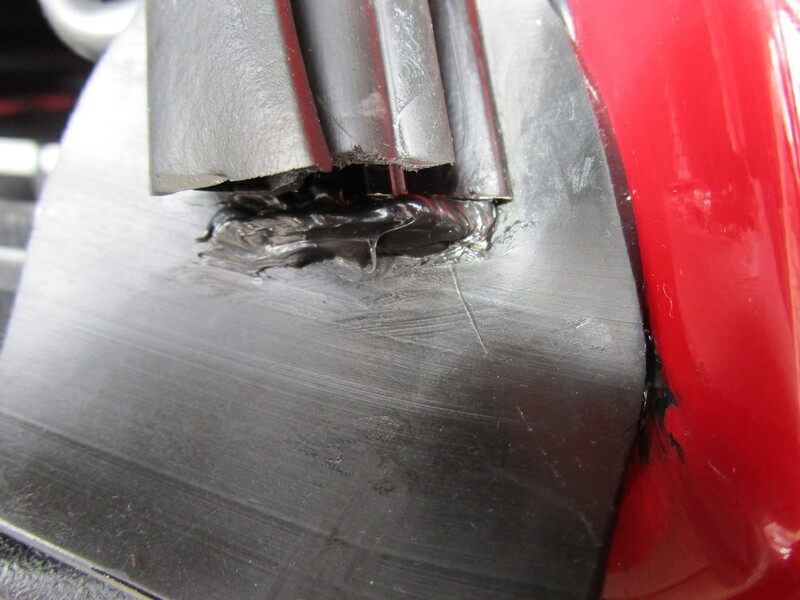 Once it came out I’d wait for the sealant temperature to drop to around 110°F and then use a medium-width screw driver blade to separate the sealant away from the housing with one hand while using the other to pull the sealant away nearly intact. However, once the part cooled into room temperature (~ 72°F) I could tell it needed to be heated back up so it went back into the oven for 5 minutes, then was allowed to cool into the sweet spot range before I started working the sealant in earnest. I’m guessing it would have taken the initial heating + 2-3 additional trips back to the oven for the entire sealant removal process on a single headlight, or about an hour per light to remove the sealant. 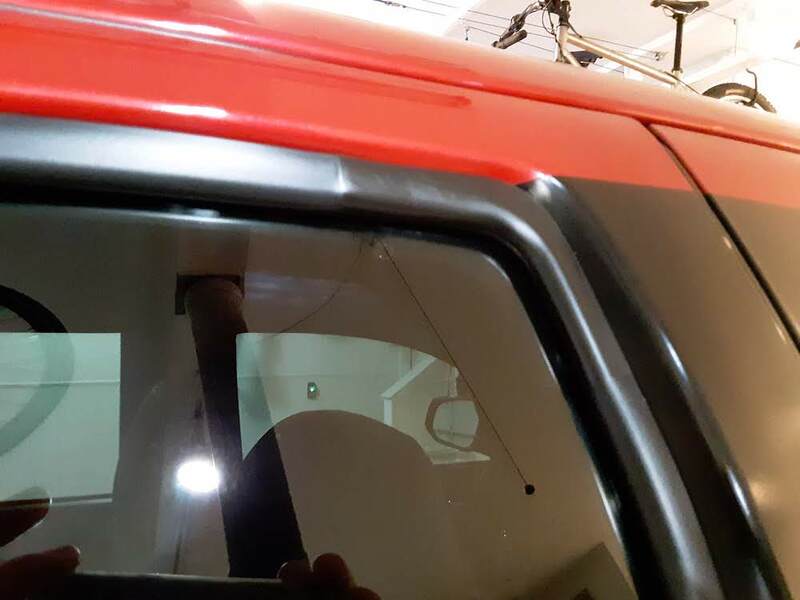 Painting the bezel satin black with Krylon Fusion paint was a no-brainer and took very little prep beyond a light scuff and cleaning and taping off a chrome band around the projector light housing. 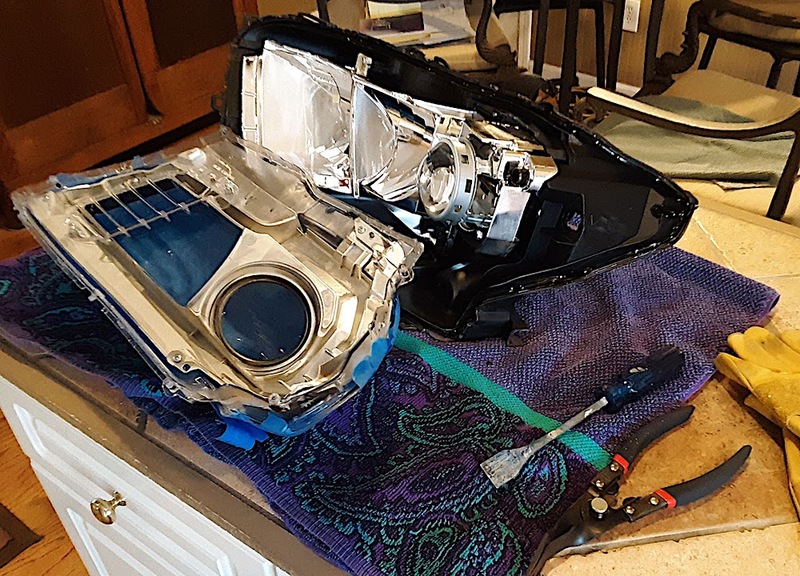 So, the $49.00 expense for the salvage headlight, including shipping, was well worth it as messing around with a headlight I knew was a throw-away allowed me to come way up on the learning curve, especially with the sealant removal process. However, based on what I learned — and despite my high-confidence level in being able to do this modification — I had to ask myself if I really wanted to screw around with the stock headlights on my truck. The most significant cost is my time, effort and any costs related to an appearance by ‘Murphy’ during the process which also puts the truck out of commission until I could fix my problem or get a replacement light, etc. There was one more wrinkle in the BLHM decision process, and that was the condition of my existing headlights. As I spent more time looking at my headlights I realized the right headlight had streaks on the inside of the lens, most likely some type of post condensation issue where water formed inside the lens and then ran down over the anti-fog coating creating streaks that even with the lens removed would be problematic to deal with without damaging the anti-fog coating. Thankfully, Toyota replaced the headlight under warranty. A close inspection of the left headlight revealed it was in better shape than the left, but still showing a lot of hazing on the inside of the lens and a light splattering of condensation staining on inside top of the lens. So, now I had to ask myself, do I want to spend the time and effort to black-out a mis-matched set of headlights, where one of the lights was now showing 2 years of wear & tear while the other was brand new? Based on everything I learned on the BLHM test project, not wanting to do the actual modification on my only set of headlights without a back-up plan, and the condition of my headlights I decided to go ahead and purchase a set of the DEPO original equipment (OE) TRD Pro lights and install them, freeing up my original headlights for either the BLHM process on a far less time-constrained schedule or to sell them individually and defray the cost of the DEPO lights. 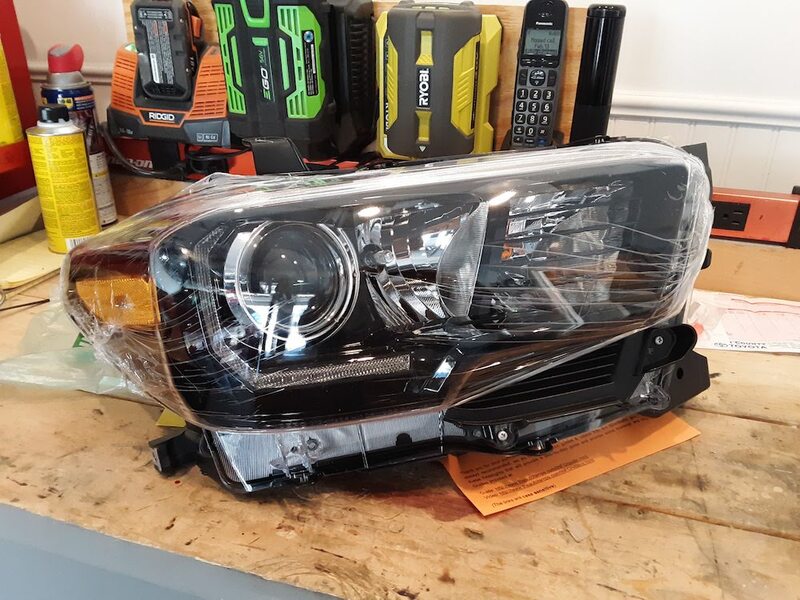 The minute I made that decision I could tell it was the right one, so $529 and 4 days later a re-seller in California had a set of DEPO headlights sitting at the house, noting shipping on these things is about $70 of the cost. 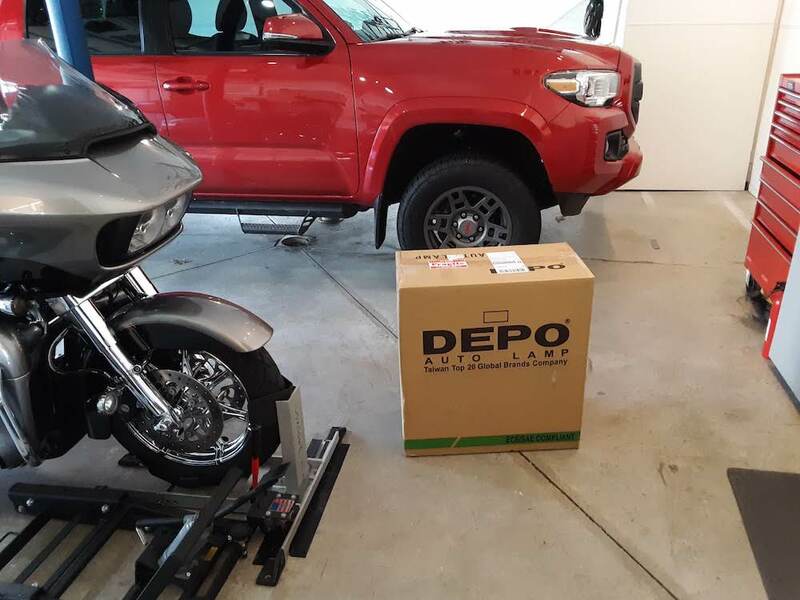 DEPO is one of those companies that make auto replacement parts insurance companies require repair shops to use as a cost-savings to the insurance company. There’s no doubt about it, factory-level quality parts, aka, Original Equipment Manufacturer (OEM) parts are a lot more expensive than the copies made by Original Equipment (OE) companies, which often time use less expensive materials, processes and don’t carry the overhead cost of having had to develop the original tooling to make parts for the manufacturer. Usually, OE parts look pretty good, especially if they get painted, i.e., body parts. However, as you get into things like lights, electronics, etc., they don’t always look or perform as well as the OEM parts. When I describe my DEPO tail light experience in the next segment of this article, you’ll see what I’m talking about. 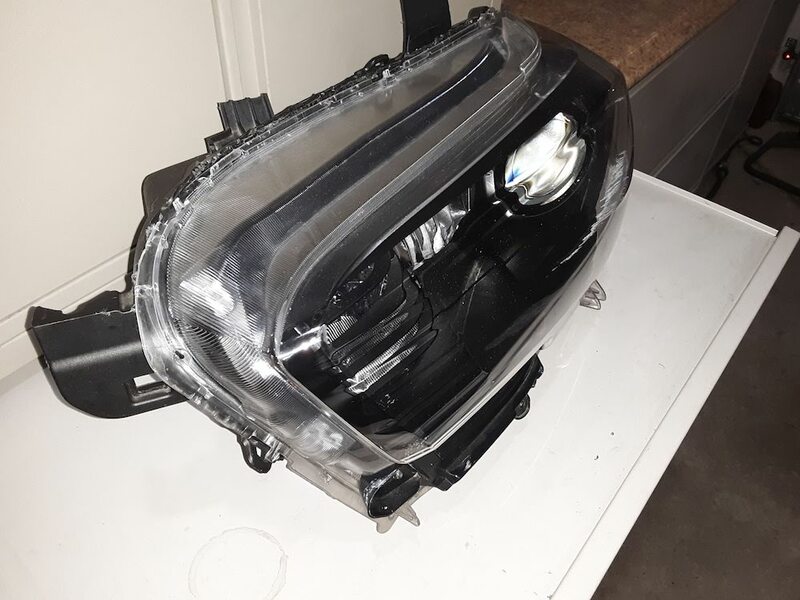 However, the DEPO headlights I received were quite nice and match up well to the factory assembly in terms of the materials, fabrication, assembly and fit/finish quality. carefully lifting the lights out of the front metal work. The new lights are direct replacements, so everything just plugs back in. All told, it took me about 90 minutes because I wasn’t hurried and took my time. The appearance of the blacked-out bezel was exactly what I was looking for. 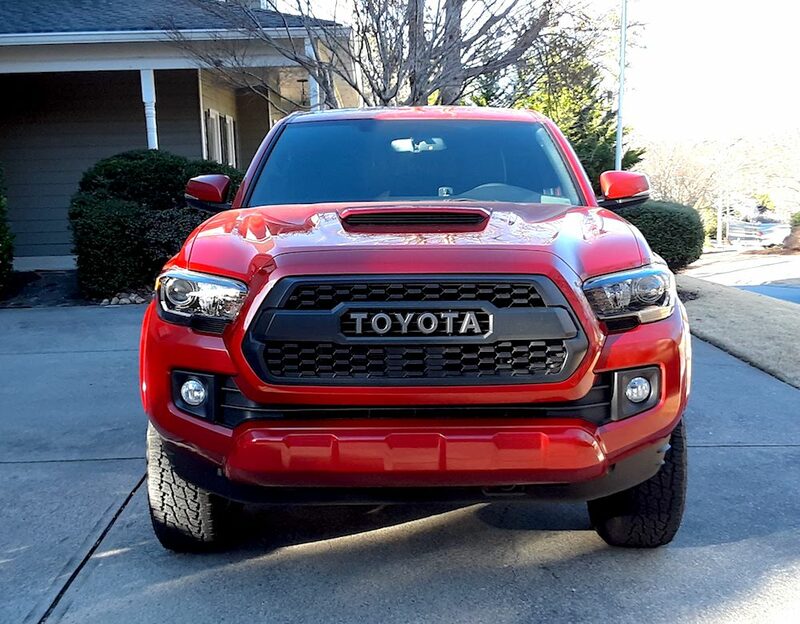 While I would have preferred a satin or black finish instead of the gloss black finish spec’d by Toyota on the TRD Pro headlights, the gloss black looks fine and matches the TRD Pro tail lights now on the truck as well. Again, just a great look but also very stock aside from the color. I also upgraded the stock H11 halogen bulbs to a higher-quality OSRAM 55 watt, 3600K bulb legal for street use per DOT guidelines. They have better optical qualities that provide a slightly whiter light vs. the stock bulbs and a more well-defined beam pattern. 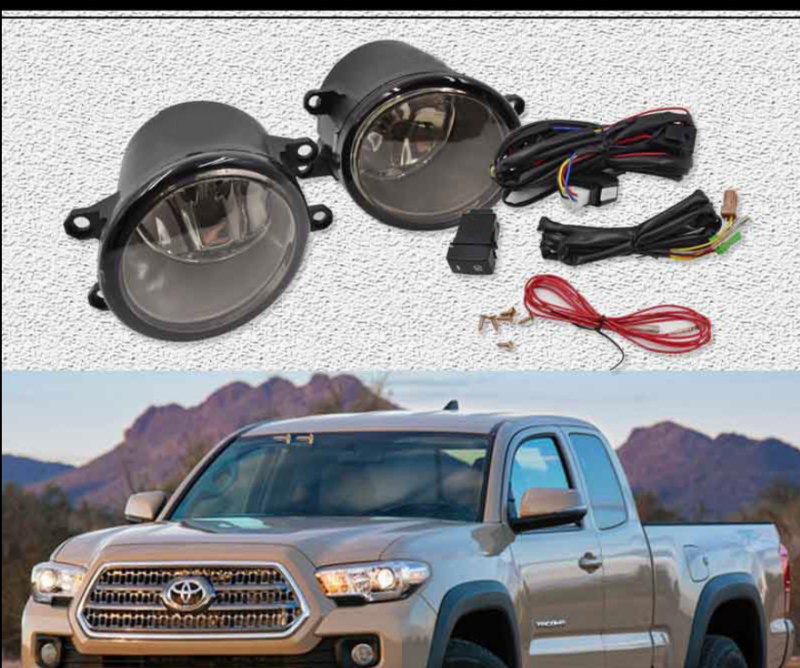 There are other, aftermarket headlight manufacturers making all kinds of exotic headlights for the Tacoma trucks, noting these little trucks are perhaps one of the most-often modified vehicles out there short of a Harley-Davidson. 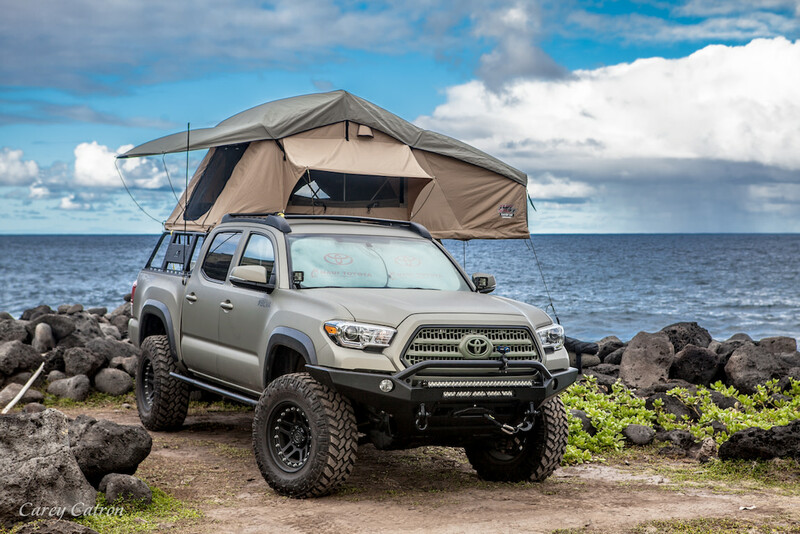 As much time, energy and expense as I’ve put into “personalizing” our Tacoma, it pales in comparison to what a lot of enthusiasts are doing with just $10k in suspension, wheels and tires, never mind as much or more going into custom front & rear bumpers, carrier systems for tents, recovery gear and the like: it’s breathtaking, to be sure. one of the other aftermarket offerings. I decided to go with the popular, well-reviewed DEPO OE TRD Pro tail lights and ordered a set from a re-seller on the east coast. They arrived a couple of days later and much to my surprise, they were a huge disappointment. The quality of the material and the fabrication process was nowhere near close to the OEM parts and, as a result, the lights didn’t look quite right. 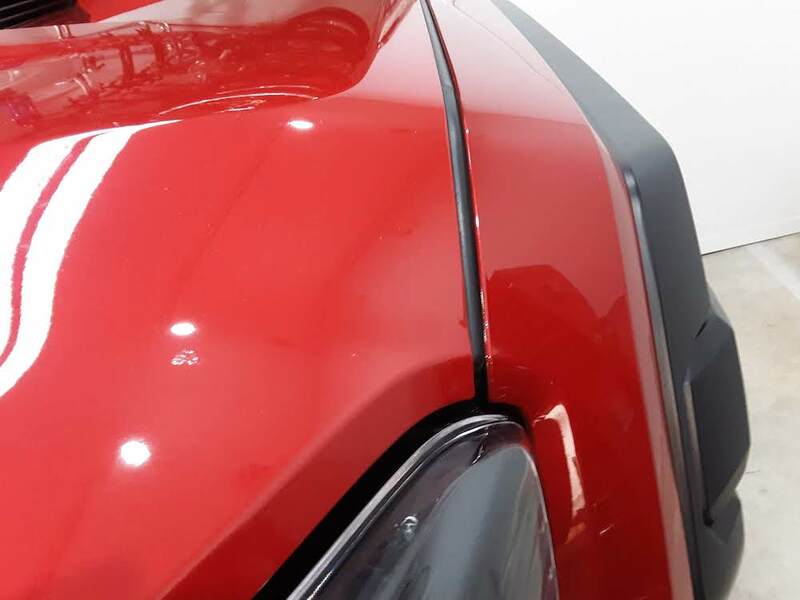 The hot melt seam had an almost white color which made it stand out quite prominently against the Barcelona Red color of our Tacoma. Add to that the poor quality of the bonding, especially the right-hand light, and there was no question in my mind these had to go back. 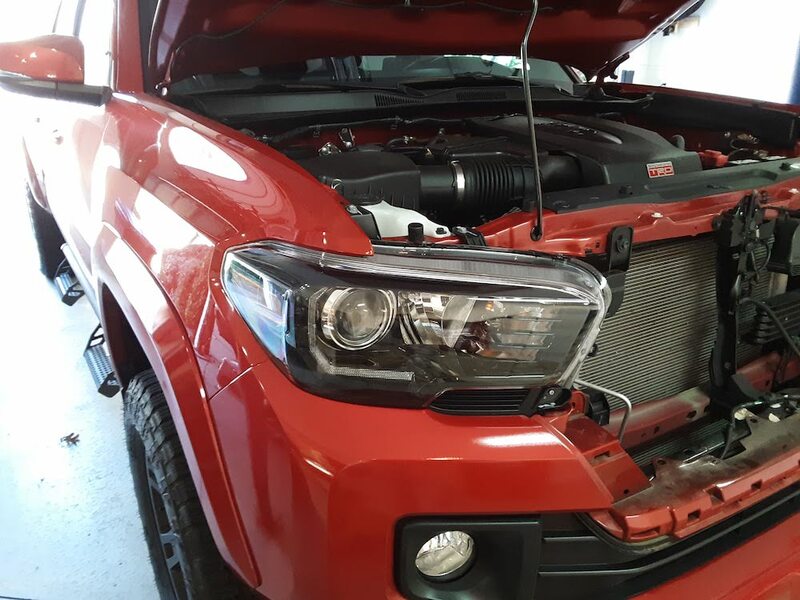 In fact, I had to drop by our local Toyota dealer to take a look at a TRD Pro model on the lot just to confirm what the lights were supposed to look like, as I was now even questioning if the factory lights would look right on the truck. Sure enough, the “real” TRD Pro lights looked very different, in a good way. Thankfully, the re-seller was excellent and agreed the right light was not 1st quality; in fact, he was surprised at how bad it looked. But, he also quickly processed the return, sent out a return shipping label and then credited my account as soon as the lights arrived back at their location. 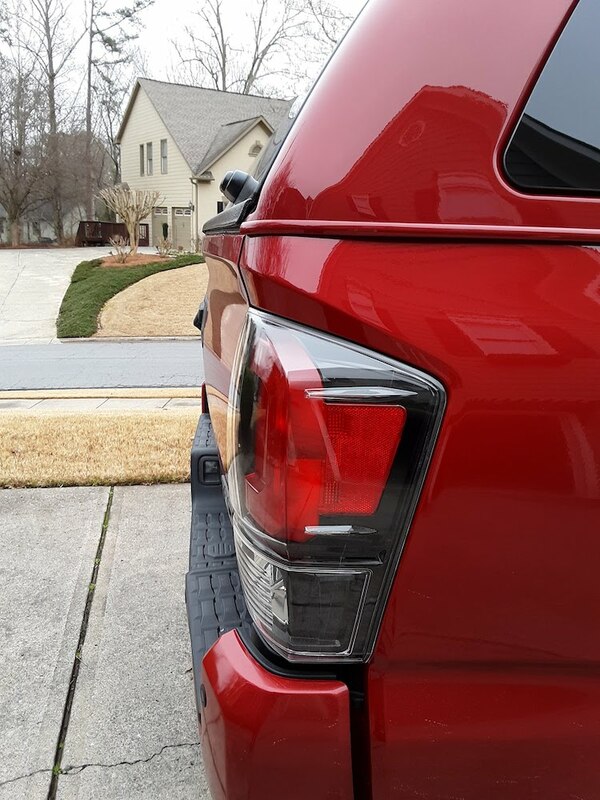 After confirming the Toyota OEM TRD Pro tail lights had the right look I was after for our truck, I went ahead and ordered a set of “the real thing” from Sparks Toyota in Myrtle Beach, South Carolina, on Valentines Day. They seemed to have the best pricing and were relatively local. They processed and shipped the lights with blazing speed, and they arrived two days later. The quality and look of the lights was exactly what I’d expected. Well, almost. I must still have a little black cloud over my head as the right tail light had a flaw in the hot melt bead seam and it was not something I could over look. 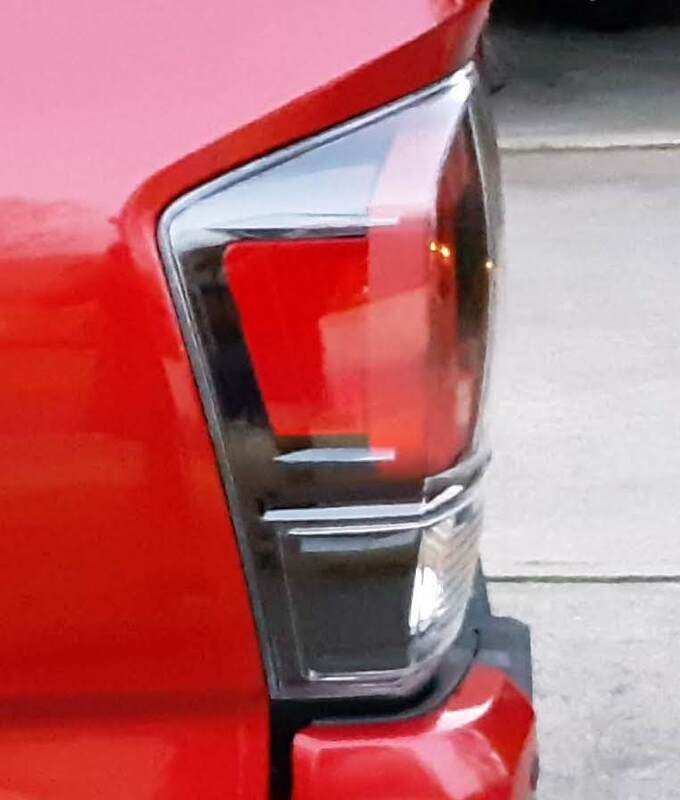 So, while the lights look great, they came right back off and the right-hand tail light went back to Myrtle Beach and was quickly replaced at no additional cost to me. The replacement arrived in fine shape as I could tell they’d taken the time to open the box and inspected the light to make sure it was 1st quality. All said and done, I’m really glad I went ahead and purchased the OEM lights, as they just look so far superior to the OE model and, well, I “had” to do something with the taillights, right? 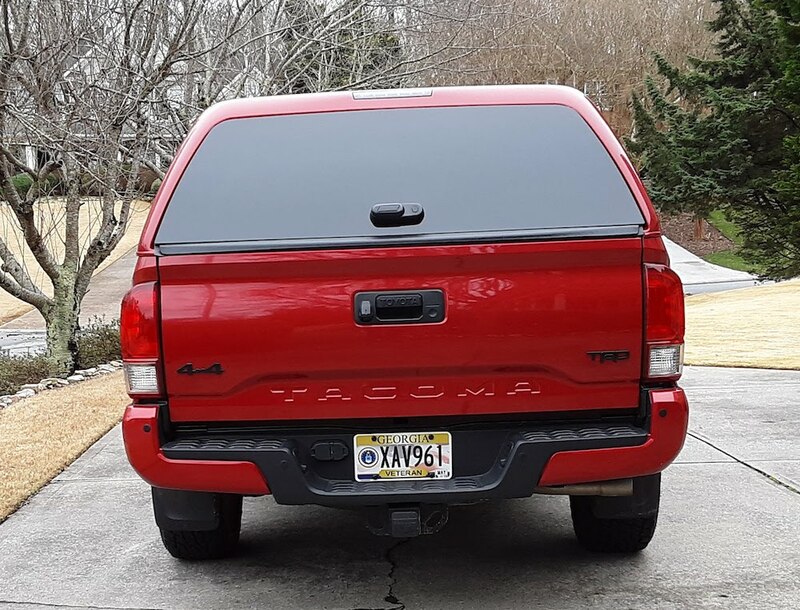 After changing the head and tail lights from chrome to blacked-out bezels, the only other bit of obvious chrome trim left on the body of the truck were what are referred to as the switch back turn signals nested in the left and right hand review mirrors. The default solution for Tacoma owners has been to replace them with aftermarket lights that are heavily tinted and otherwise blacked-out. However, at present, the small company that has been producing these is awaiting a new shipment. As an interim solution I decided to see if I couldn’t achieve some level of de-chroming the mirrors using left-over black-out trim tape. 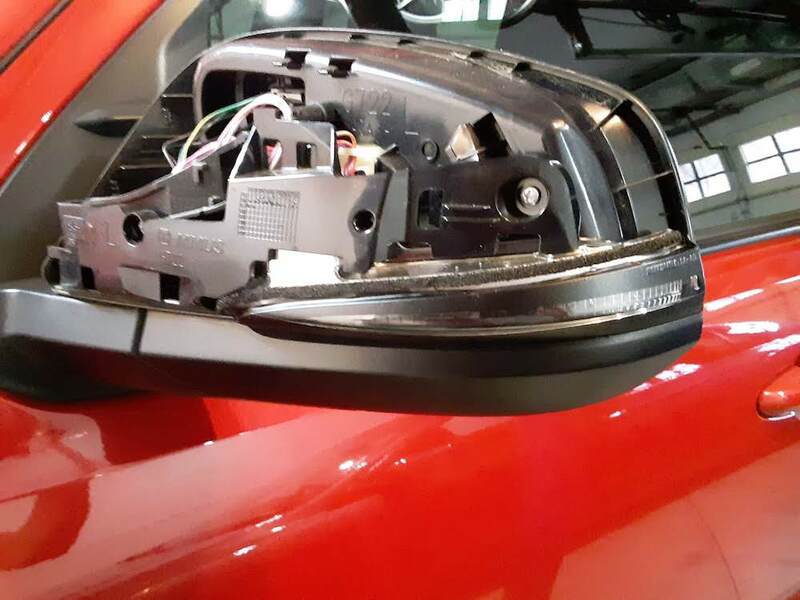 I removed signals from the mirrors — a relatively easy process so long as you know what you’re doing — then cleaned them and applied two 1/2″ strips of the black-out tape to the outer lens so the chrome strips under the lens on the housing were hidden. I’d considered separating the lens from the housing by using a razor blade to break the epoxy seal so I could apply the black-out tape directly to the chromed housing so the tape would be under the clear lens, but since this would most likely be a temporary solution putting it on the outside of the lens would be sufficient. 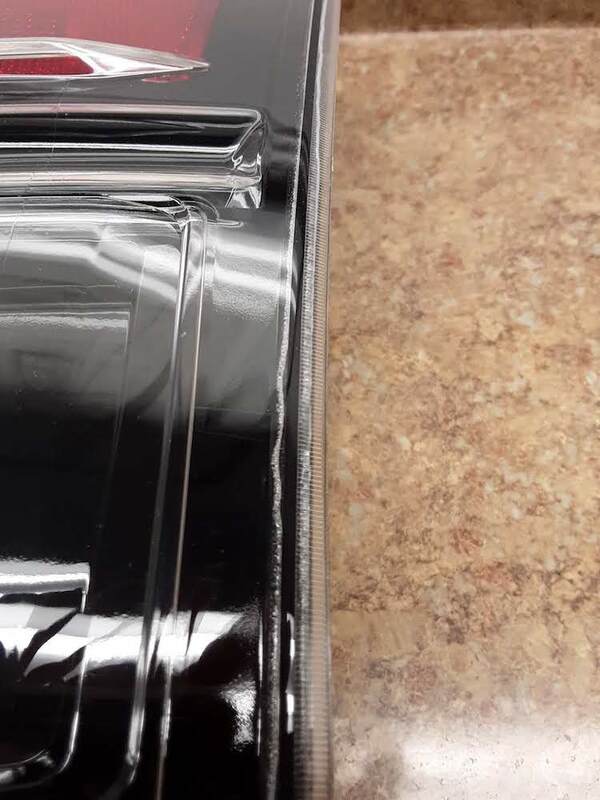 The tape has similar properties to shrink-wrap tubing in that when you heat it up it bonds and conforms. After getting a nice clean line over the chrome I held the lens under my halogen work light on the drafting / work table in my office to activate the bonding characteristics of the tape then trimmed away the excess. After that it was just a matter of re-installing the light assembly in the mirror housing, pressing the cover back on and I was done. Less than an hour for both mirrors and less than $1 in material., no fuss and no muss. From two feet away, they look good even with the clear lens and the black satin finish of the tape looks right at home on the Tacoma. As I mentioned, this may only end up being a temporary solution until the completely blacked-out, aftermarket switch back lights are available. On the bright side, it takes all of 5 minutes to swap these lights out. There were two compelling reasons to replace the fog lights on the truck; one is a good reason and the other not as good. 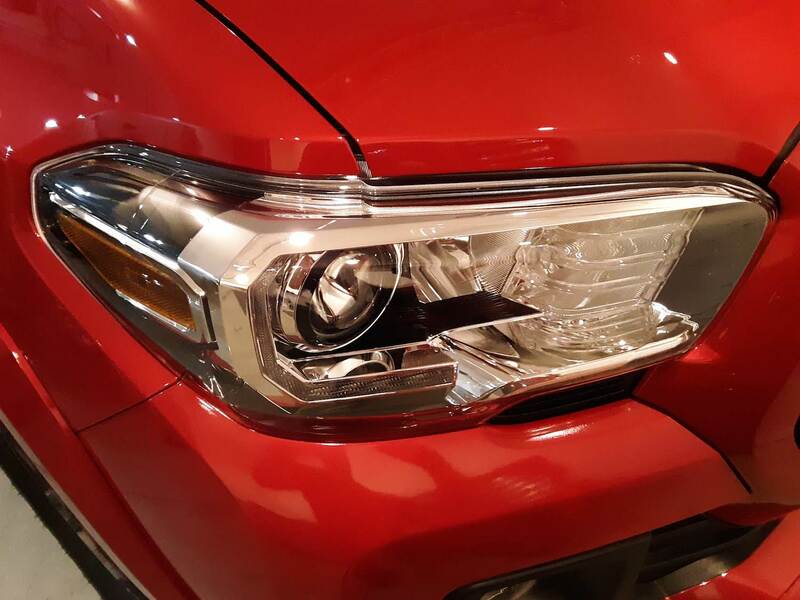 The truly good reason is help improve the quality and effectiveness of the lighting, whereas the not as good reason is to make the fog lights a closer match to the headlights instead of being a pair of chrome discs stuck in the grille of the truck. I’m not sure if it’s the high hood design or what, but the lighting on the Tacoma trucks is not great, and definitely not as good as it was on the Tundra. I’m not looking to blind on-coming traffic with some of the non-DOT approved, European-based LED and HID upgrades a lot of people put in their trucks, cars or motorcycles without really understanding how lighting works. What I’m after is better quality stock wattage H11 halogen bulbs in using a yellow version of the same higher-quality H11 halogen low-beam bulbs to eliminate the reflection / bounce back off of fog, rain, snow, etc., while also adding a slightly wide and longer light pattern with a cut-off line to ensure they don’t blind on-coming traffic. I ended up ordering and returning two different types of aftermarket fog light housings, as they both had awful optical characteristics. Yes, they looked quite nice once they were installed but I certainly didn’t need a novelty light that couldn’t be used as intended. 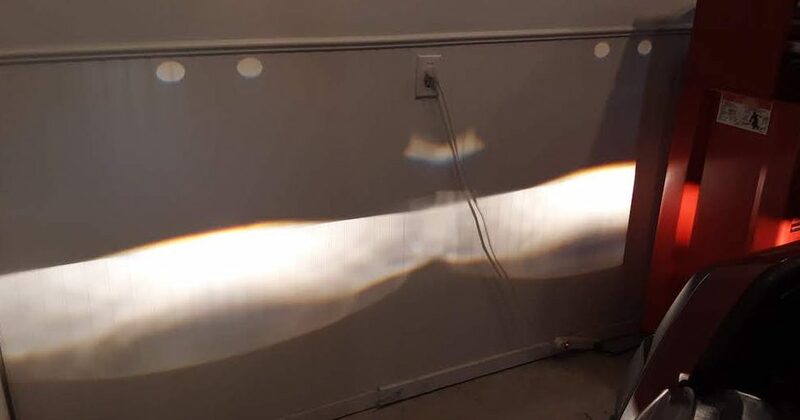 As an example, the following photo is the light pattern from the stock fog lights that come on a Tacoma, including the stock bulbs. Note the very well-defined upper and lower cut-off lines and the broad swath of strong light? Here’s what the 1st set of replacement lights looked like. Yeah, not exactly what you’d expect in any respect. The strange round beams of lights were actually holes in the light baffled inside the lights that, well… shouldn’t have been there. Just awful stuff. 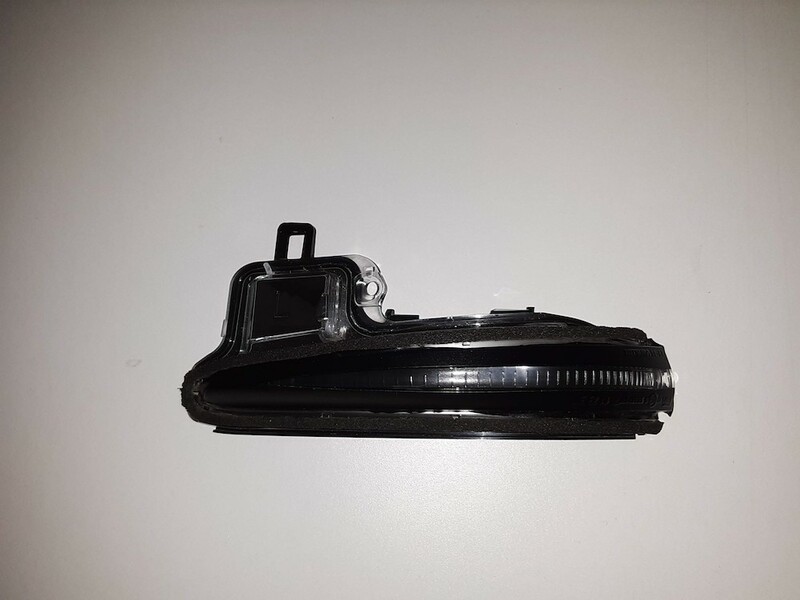 The second set which used a housing that was “similar” to the stock model already on the truck was equally bad in terms of the light pattern due to cost-cutting short-cuts in the design of the housing. On the bright side, both of the resellers sent out return shipping labels and processed full refunds. So, at least for now, I’ll stick with the stock housings but have upgraded the bulbs to a yellow, legal 55W / 2500k halogen bulb. By legal, this means I’m running the DOT approved bulb wattage for a halogen H11 bulb, not some type of “off-road use only” 75W or 95W super-bright bulb that blinds on-coming motorists and you’ll see on so many vehicles. 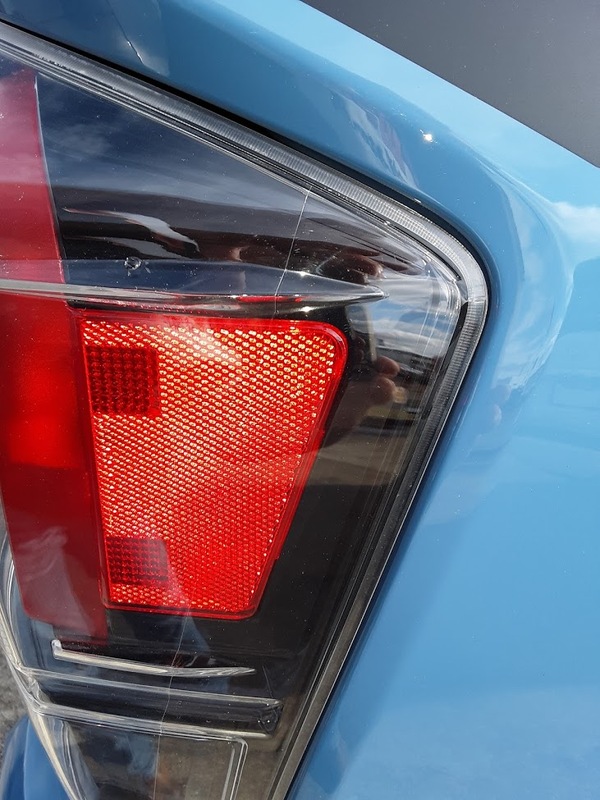 Or worse yet, super bright LED bulbs installed in stock housings with reflectors not designed for LED bulbs… which also blind on coming motorists while providing the user with marginal visibility. PLEASE BUY MY OLD LIGHTS! After living with the new lights for a couple of weeks I decided there’s no reason to hang on to the older, original equipment manufacturer lights. They’d just end up sitting in boxes in the attic taking up space and collecting dust. 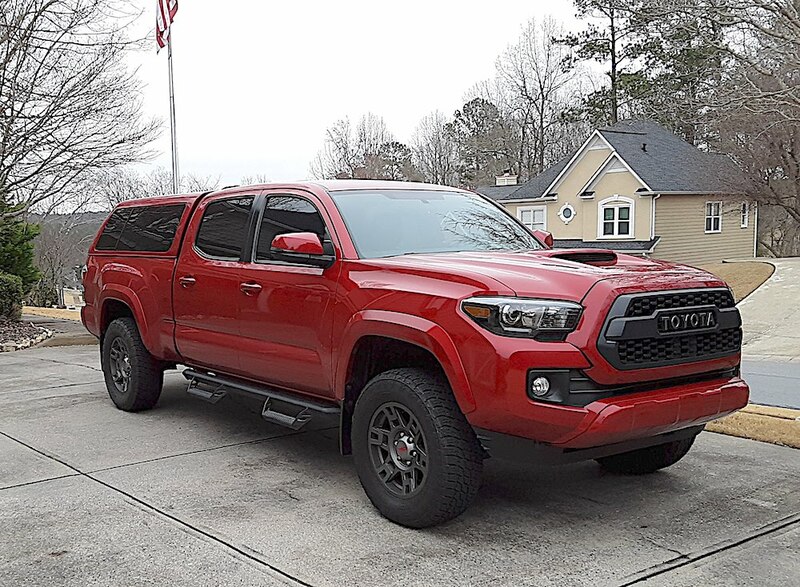 So, while they’re still “current” and can be used on a very large number of 2016 through 2019 Toyota Tacoma trucks, I’ve put them up for sale on ebay at what I think are reasonable prices. I say that as most of the “used” lights I see were taken out of crash-damaged trucks and have some type of broken tabs or cracked lenses that have been repaired. Mine are A1 quality so I’m hoping there’s a market for those and have priced them for less than I should ask, but enough to get them gone sooner rather than later.